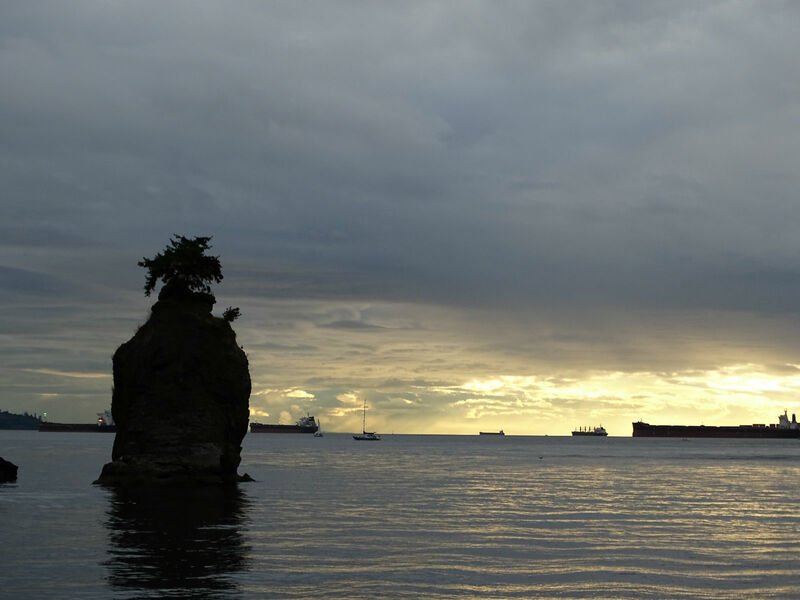 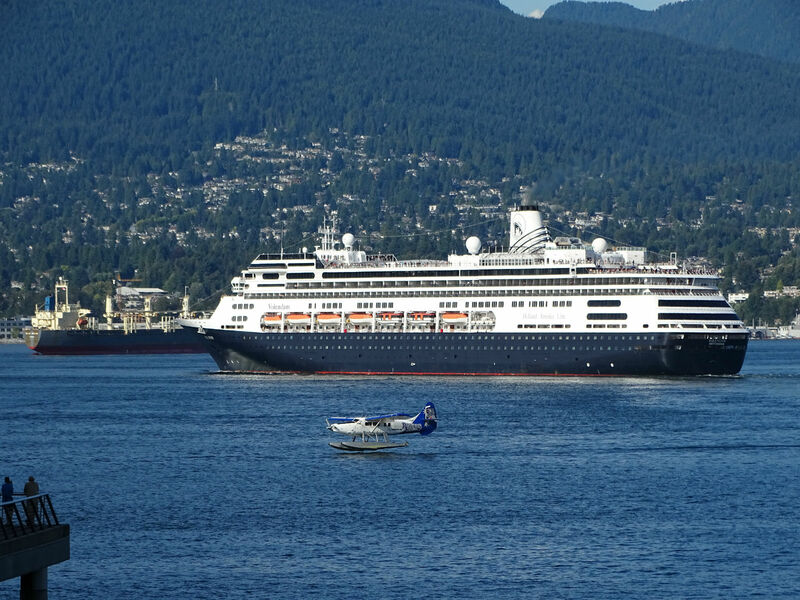 Our two-week Alaska cruise begins in Vancouver on September 1st, 2014. 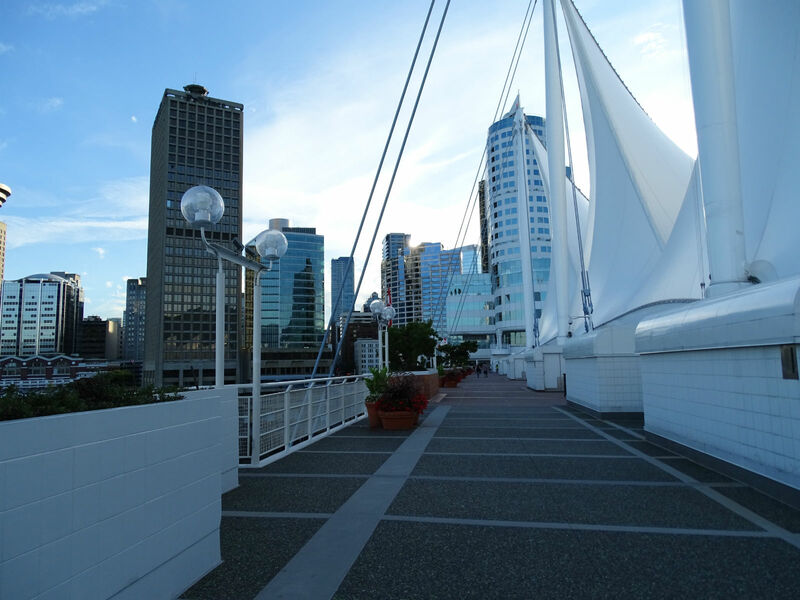 We arrive almost a week prior to explore the third largest Canadian city. 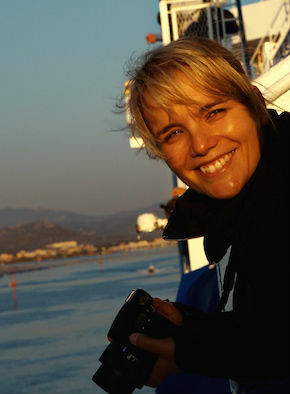 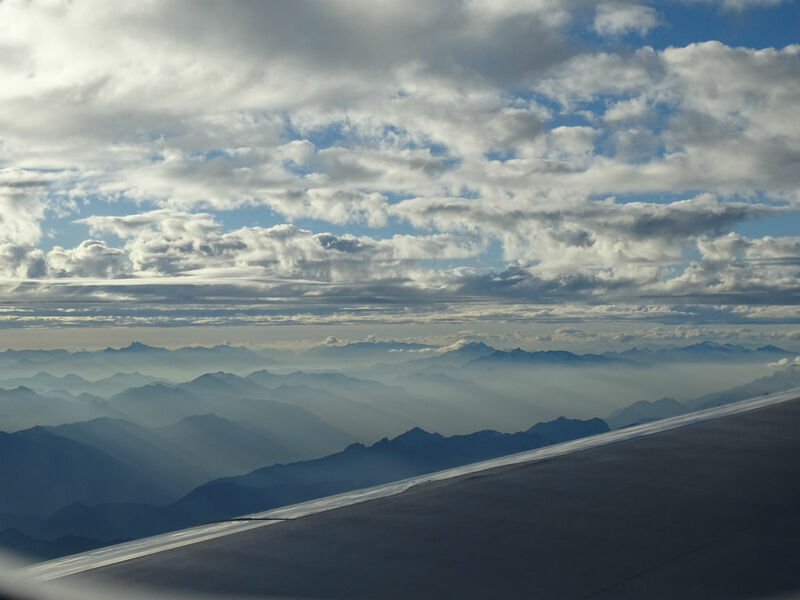 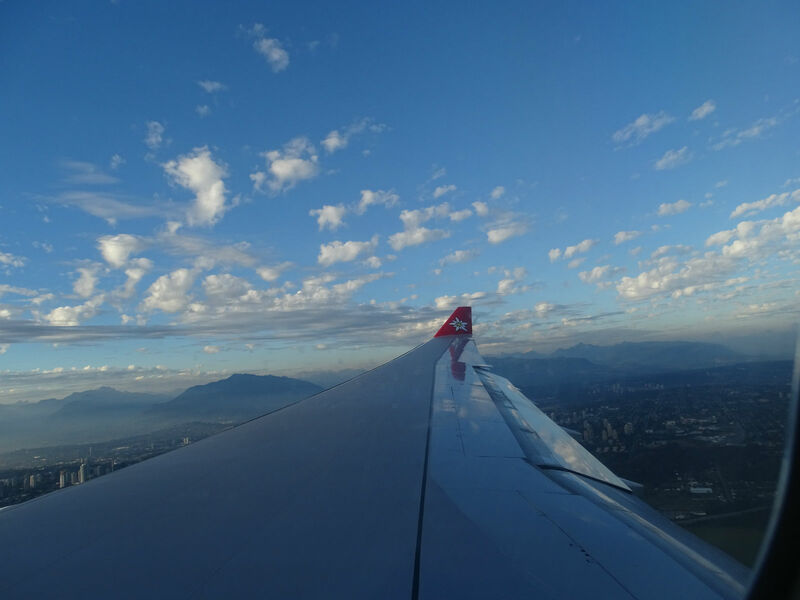 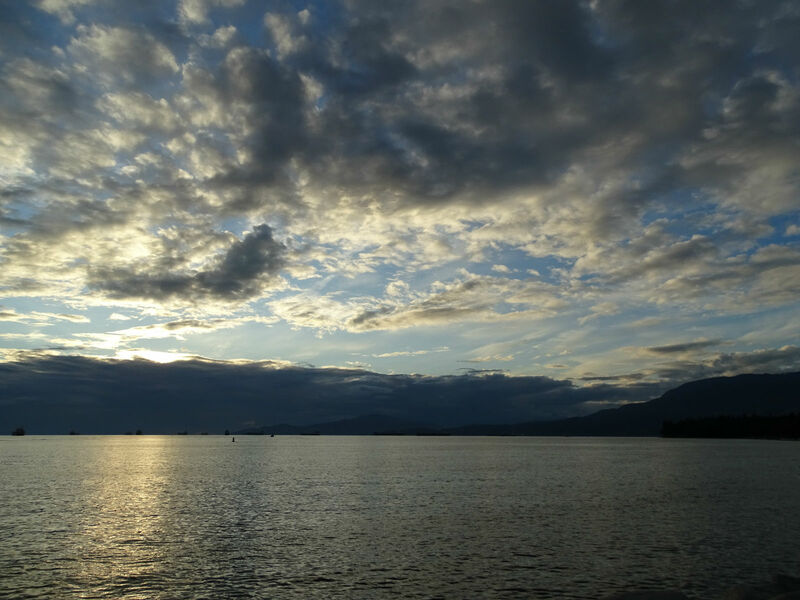 After an 11-hour direct flight with Edelweiss, from Zurich, we arrive in the evening, in Vancouver, on August 26th, 2014. 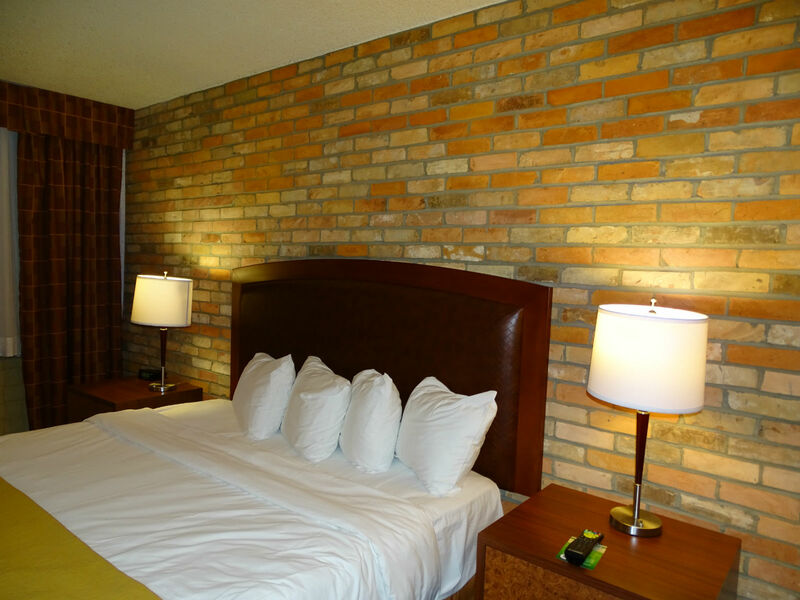 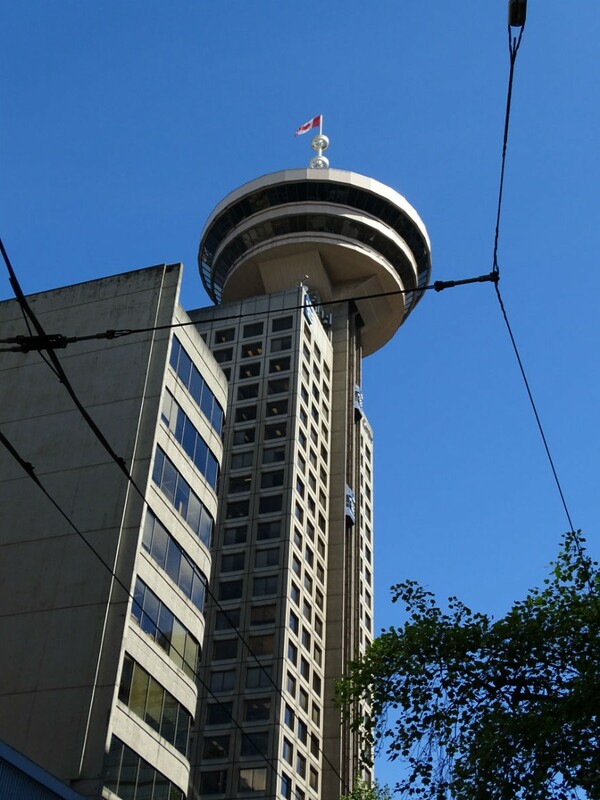 For 35 Canadian dollars (CAD), we take a cab from the airport to downtown, to our hotel. 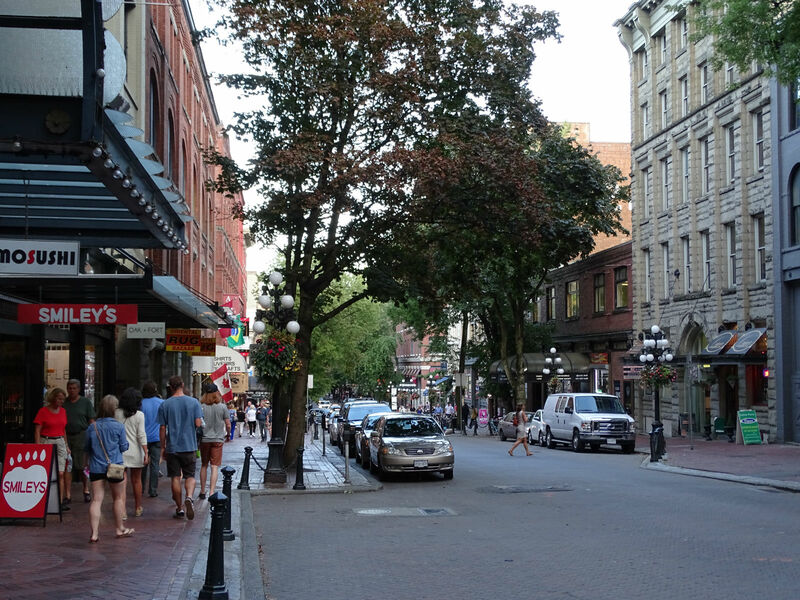 We decided not to rent a car, as the city should be good to explore on foot and by public transport. 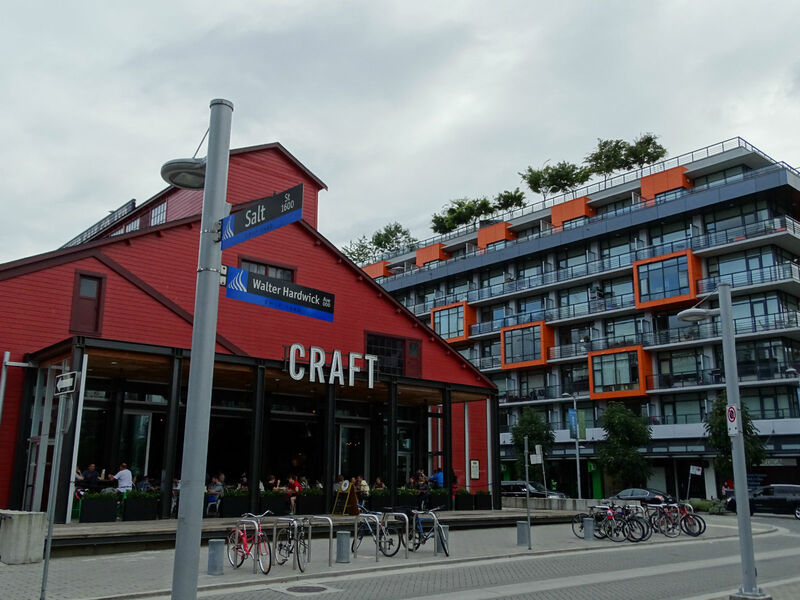 Checked in, luggage dropped off and off to False Creek, which is near our hotel. 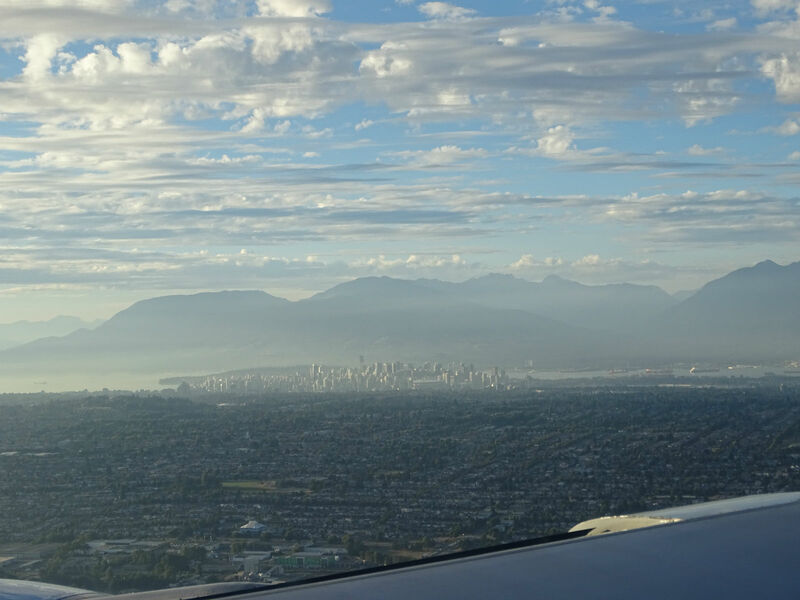 Good morning Vancouver! 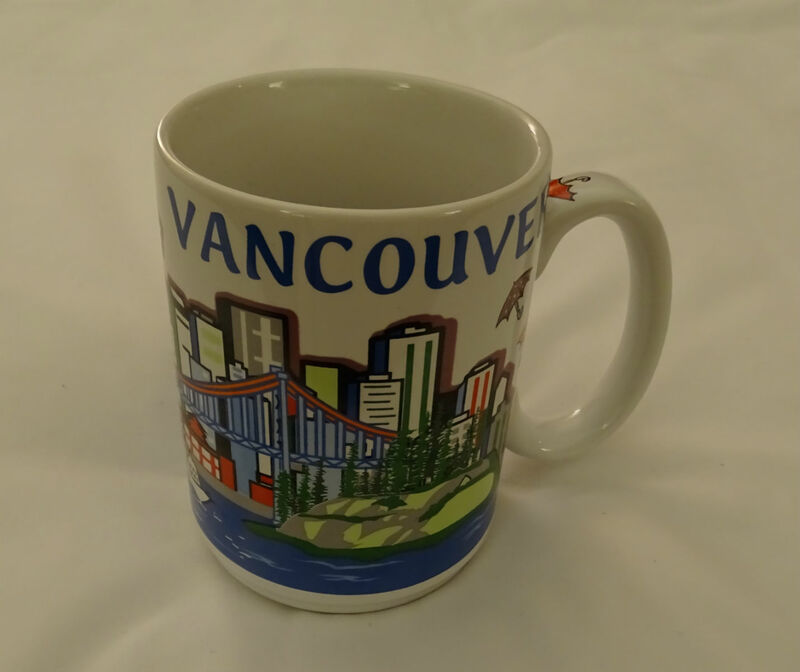 We start the day with French Vanilla Cappuccino at Tim Hortons. 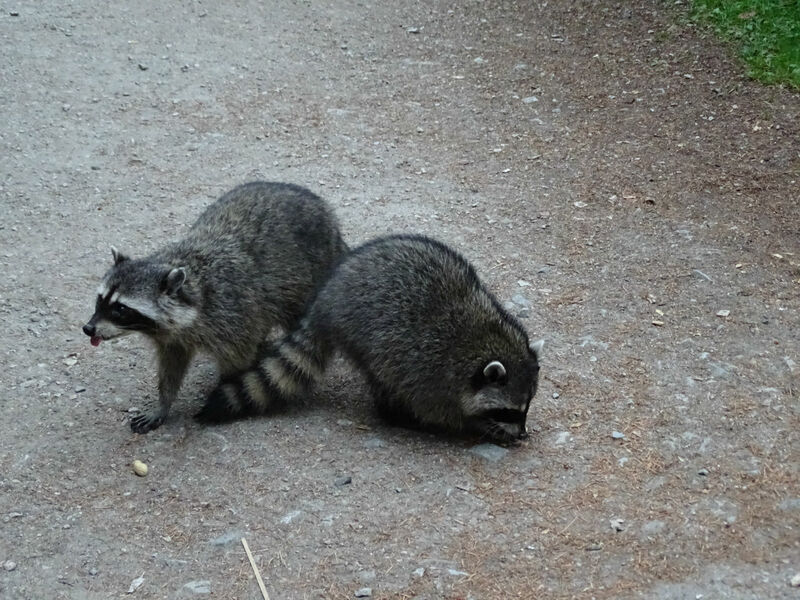 Then we get ourselves a Canadian prepaid data card at Rogers. 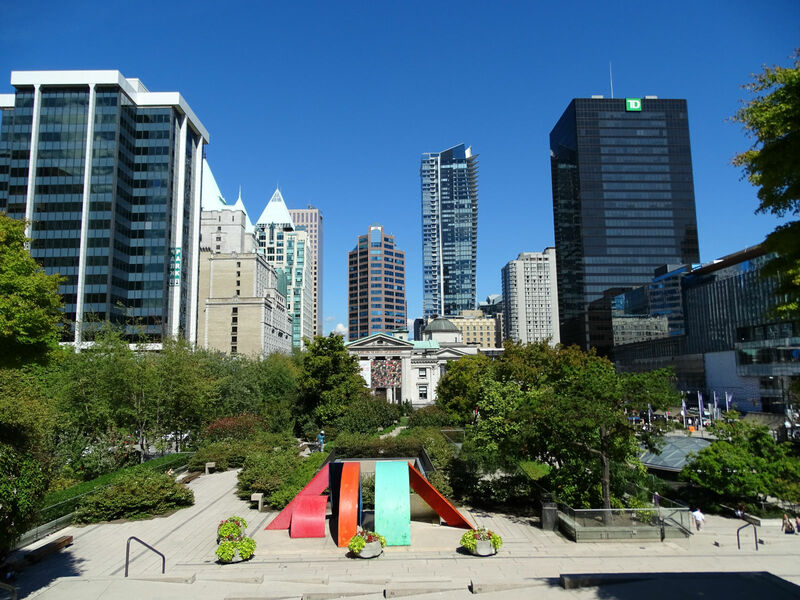 Thereafter we walk to the Courthouse and the trendy Robson Square. 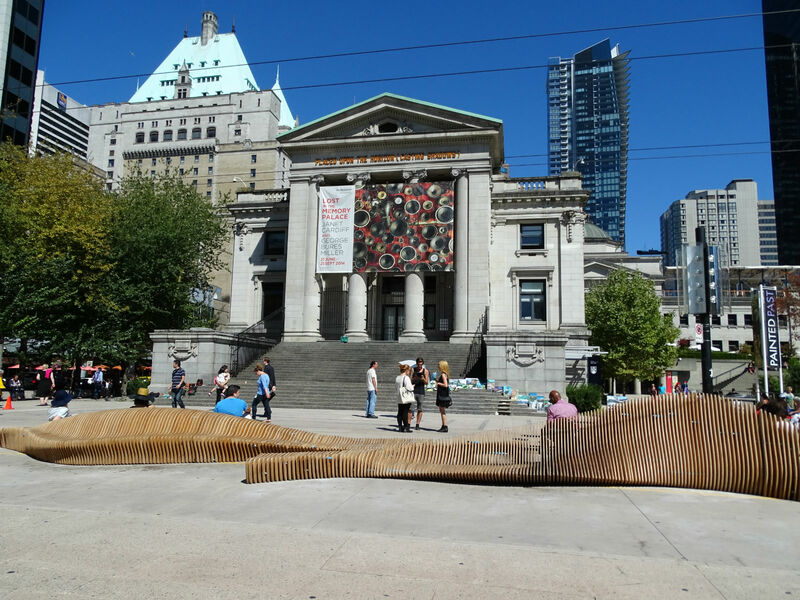 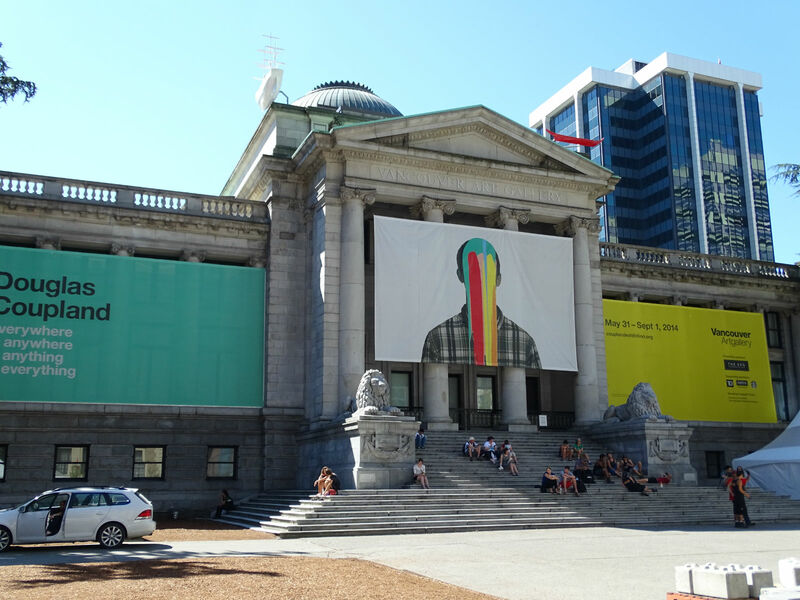 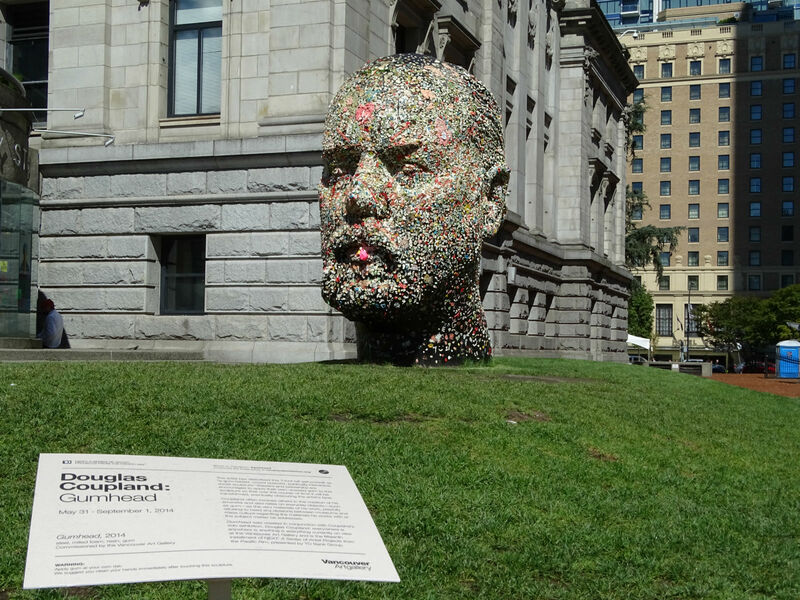 There, found next to a skating rink – only open in winter – is the Vancouver Art Gallery. 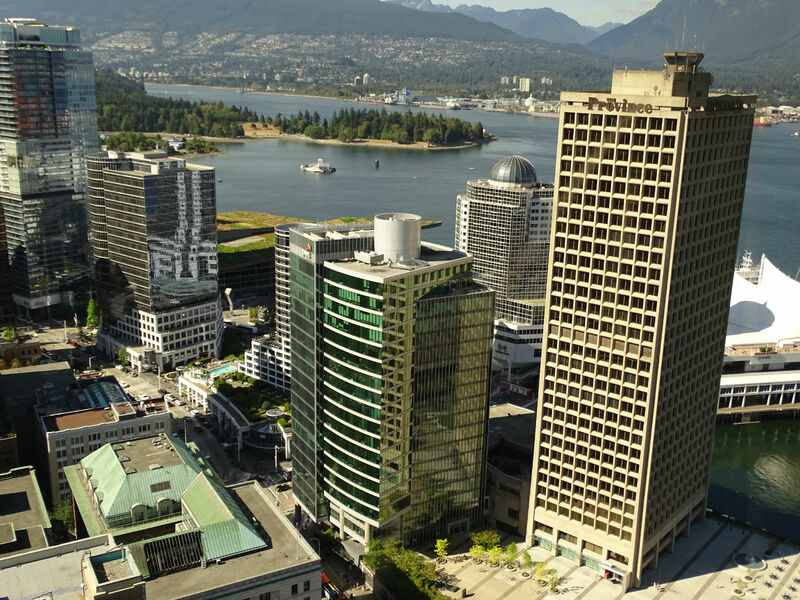 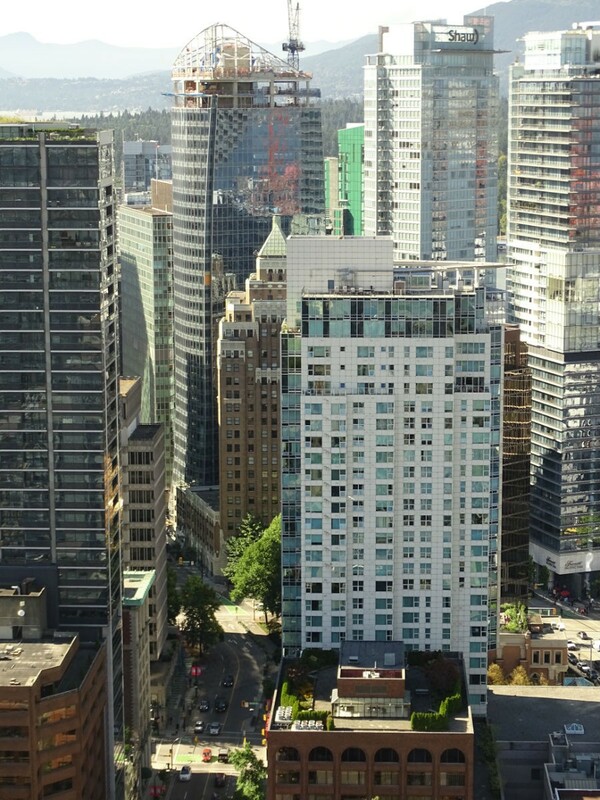 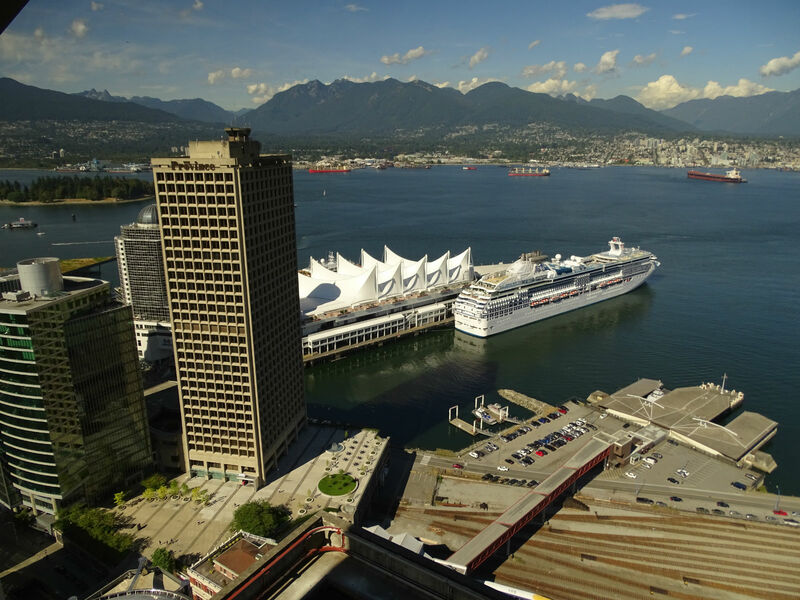 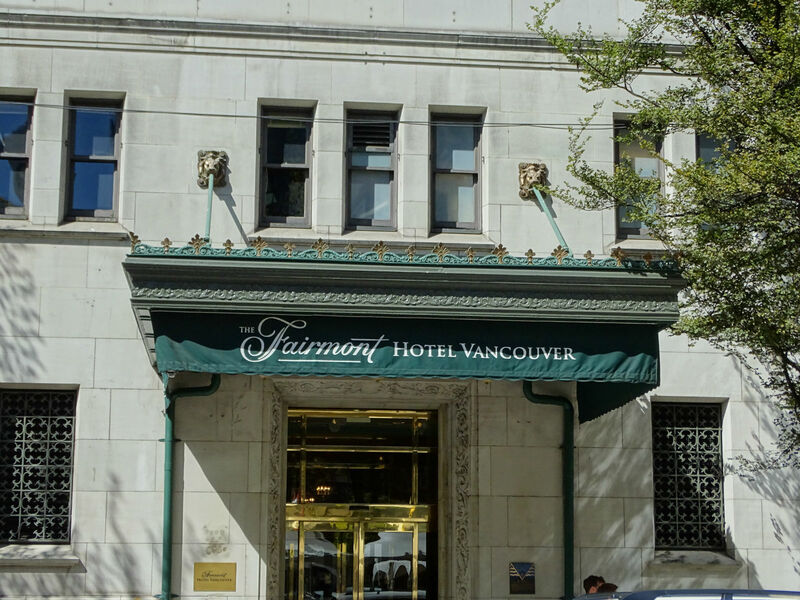 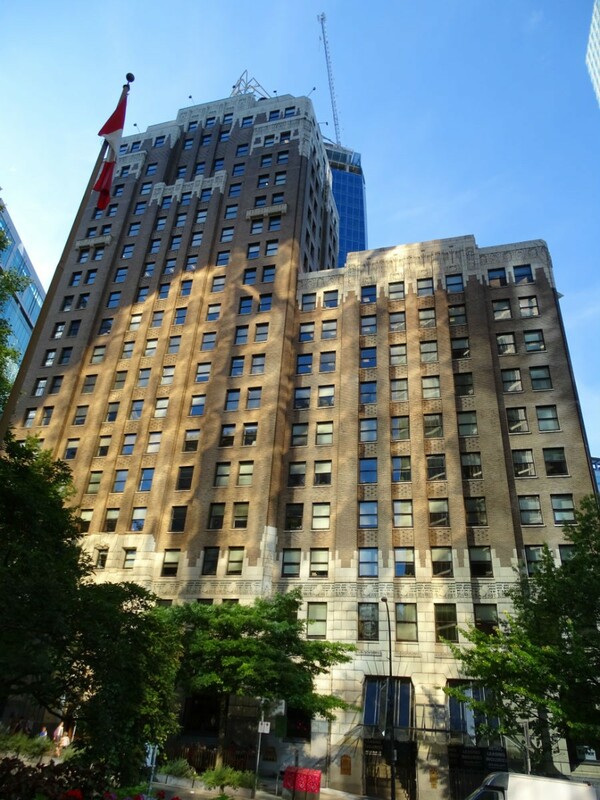 Nearby is also the famous Fairmont Hotel Vancouver. 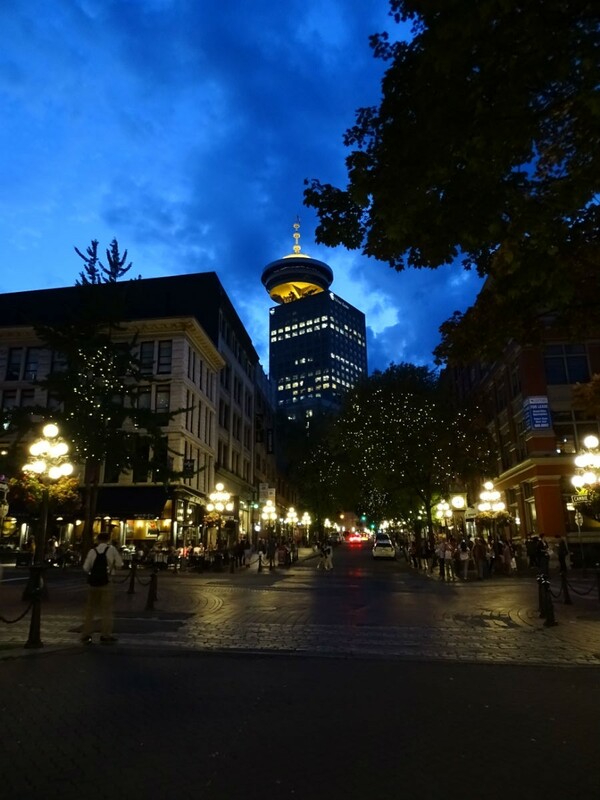 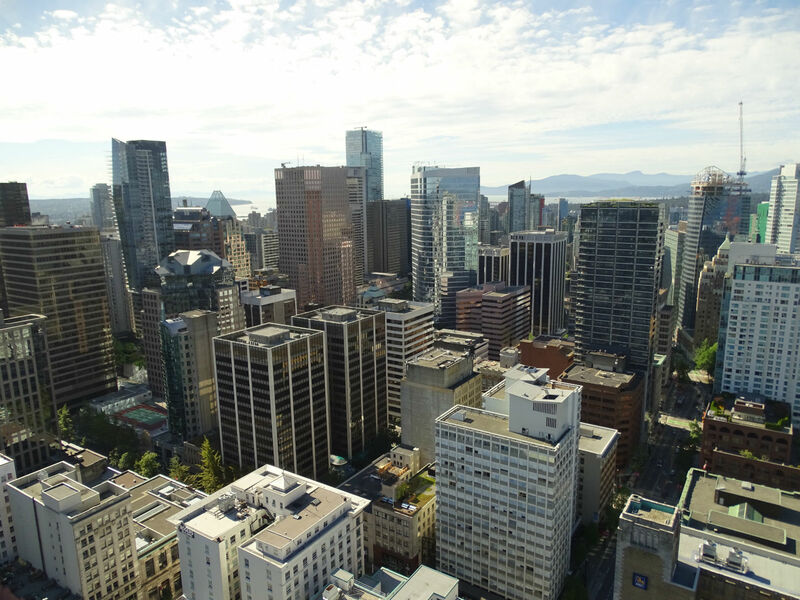 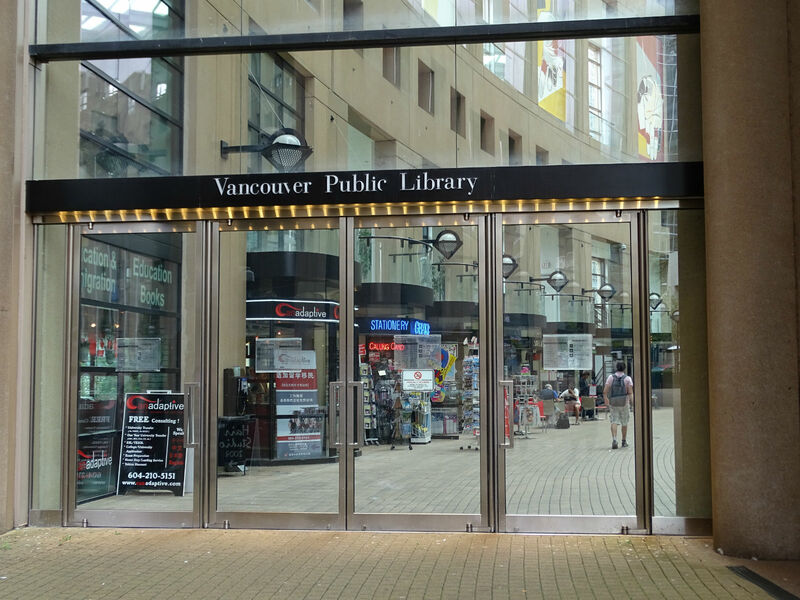 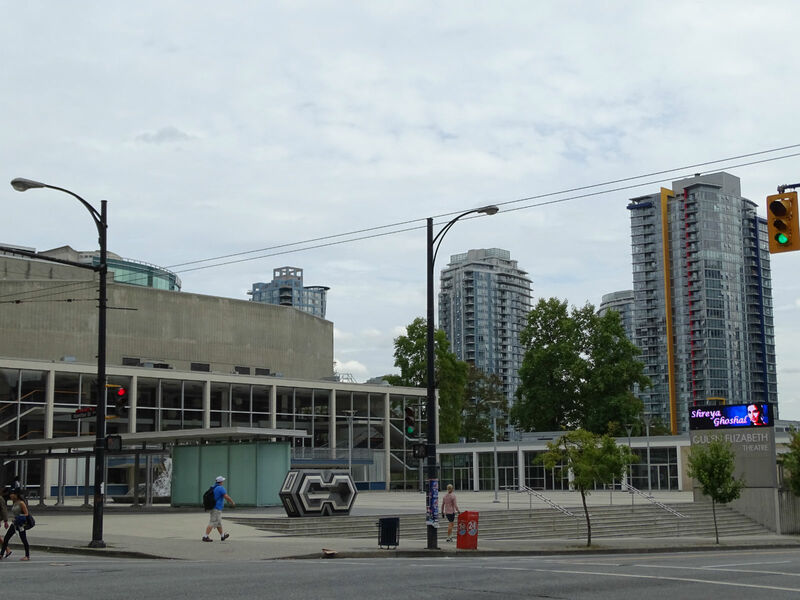 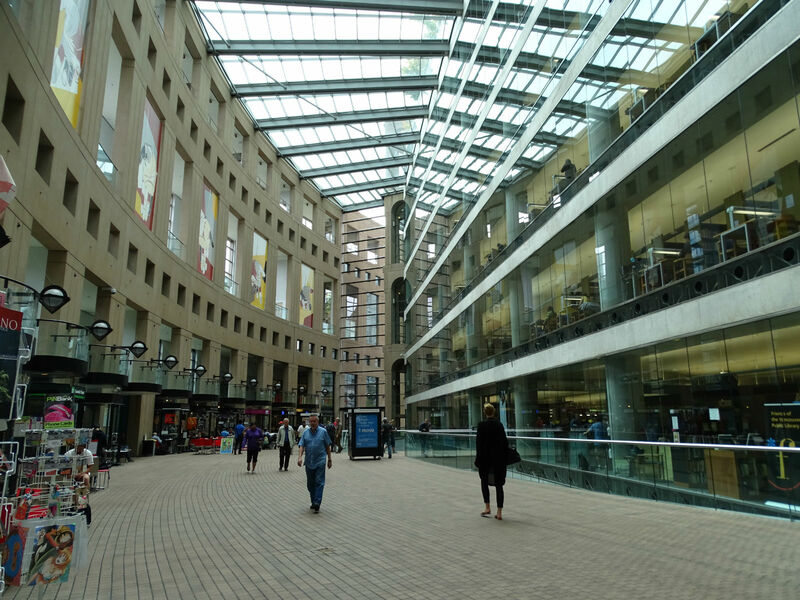 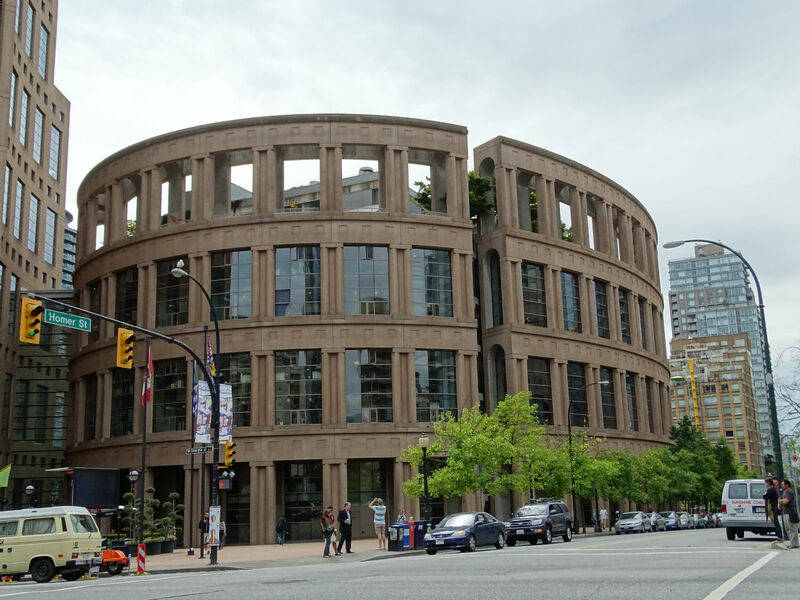 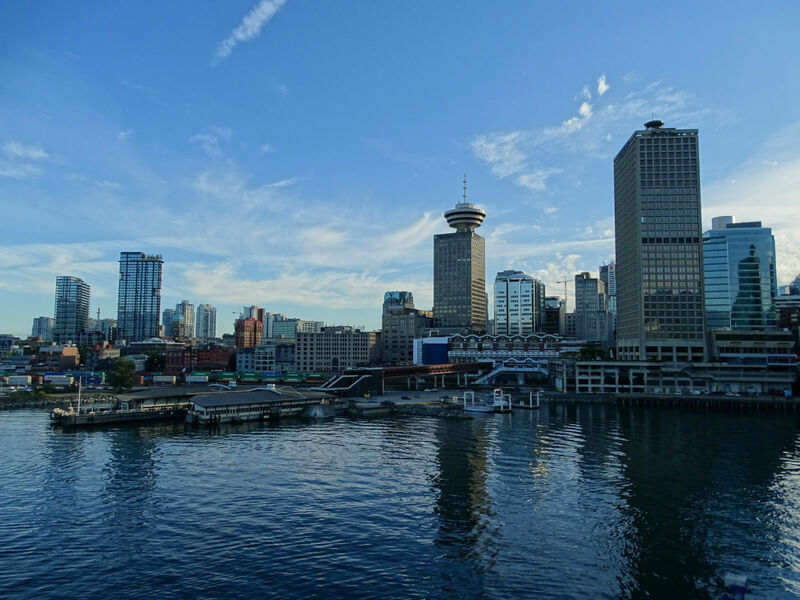 Then we walk along the main shopping street, Granville Street, to Harbour Centre, with the observation deck “The Lookout”. 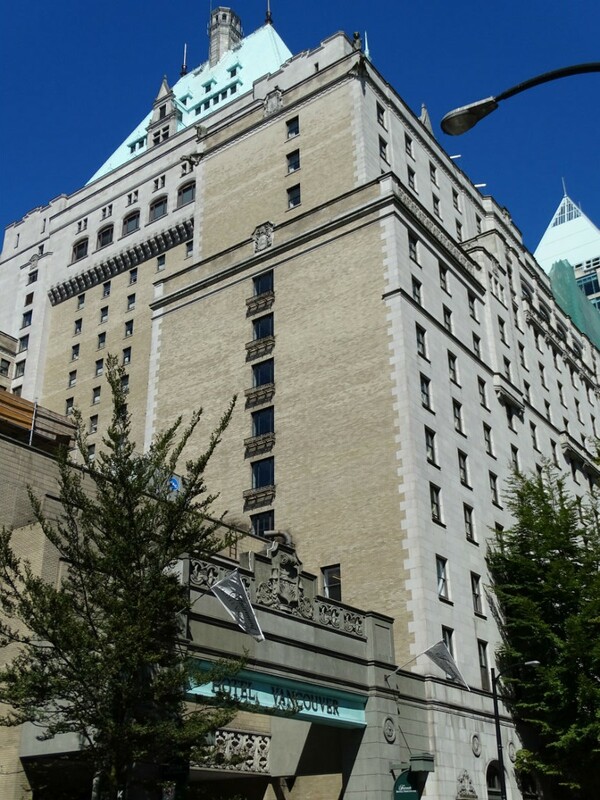 At the hotel coupon books were made available, and with it we pay only 14 CAD instead of 16 CAD per person. 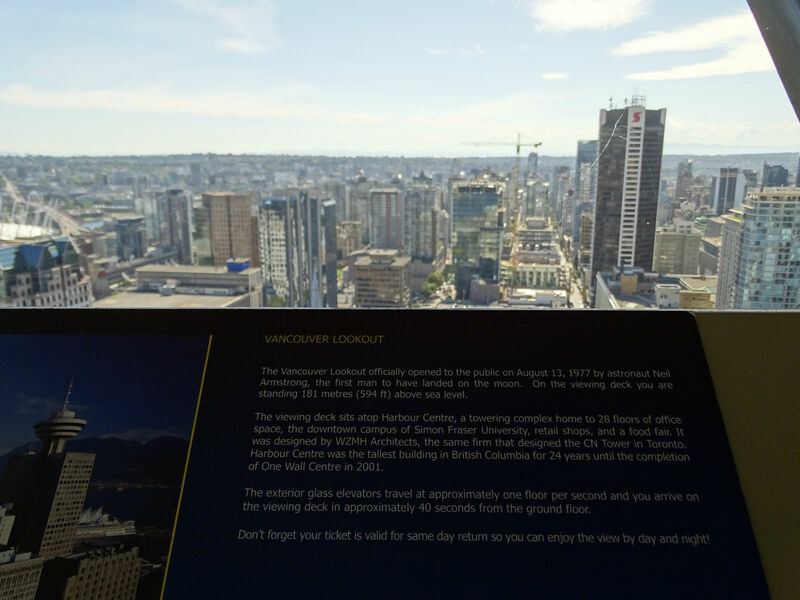 This is money well spent, because the view is really great and we get a good overview of the city. 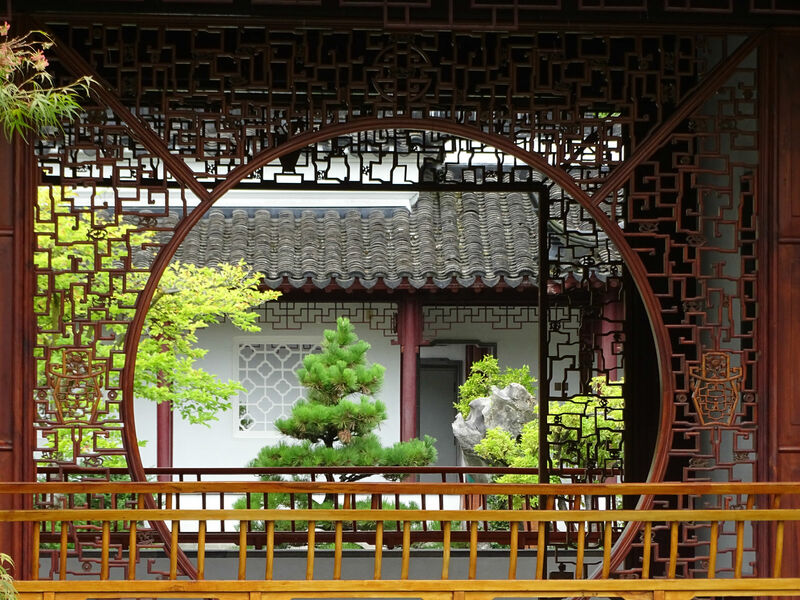 Also included, is a half-hour free guided tour, which you should definitely attend as the guides provide you with a lot of interesting information and tips. 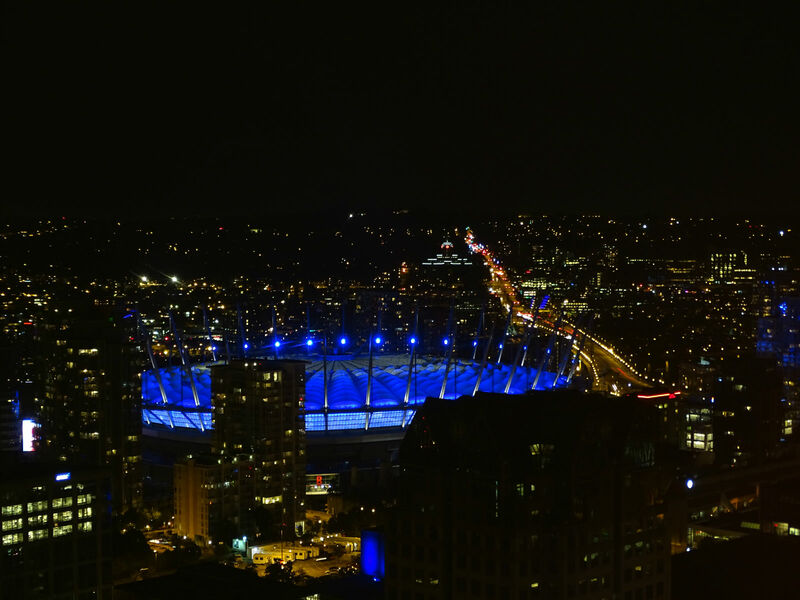 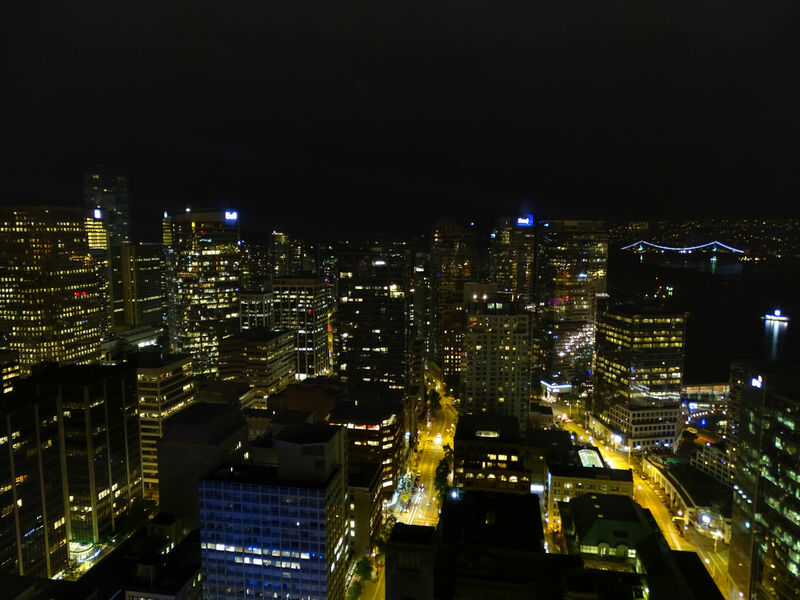 The ticket is also valid for a whole day; we therefore return in the evening to take pictures of Vancouver by night. 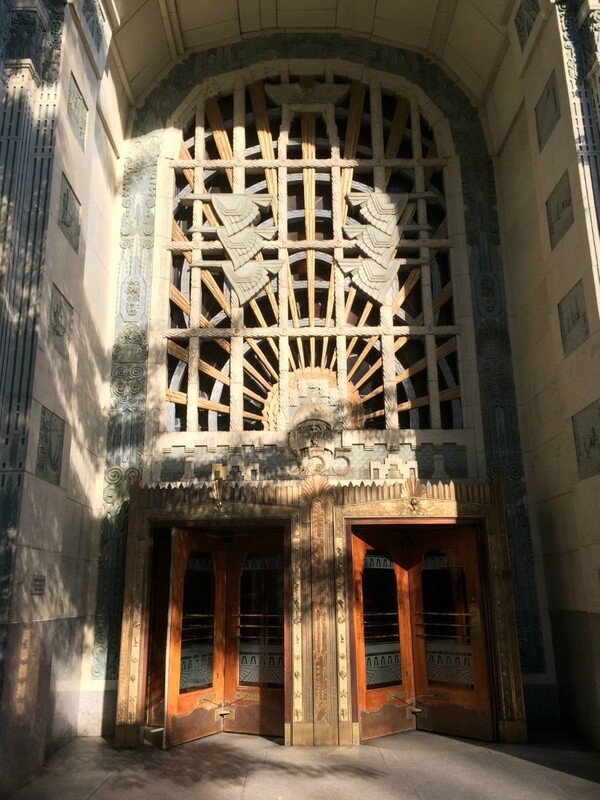 After we once again have solid ground under our feet, we go to the Marine Building, which among all the skyscrapers, stands out for its art deco style and decorations on the facade. 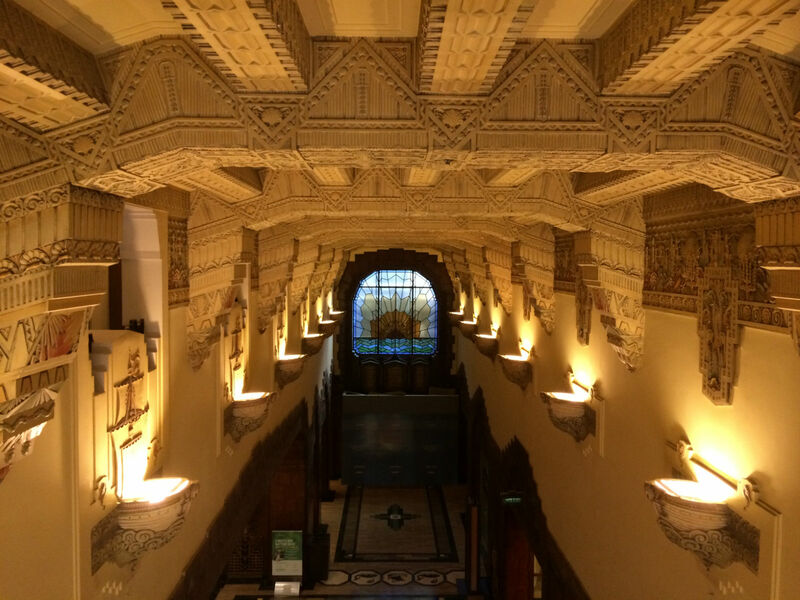 Also definitely go in and marvel at the entrance hall, which is designed as a Mayan temple. 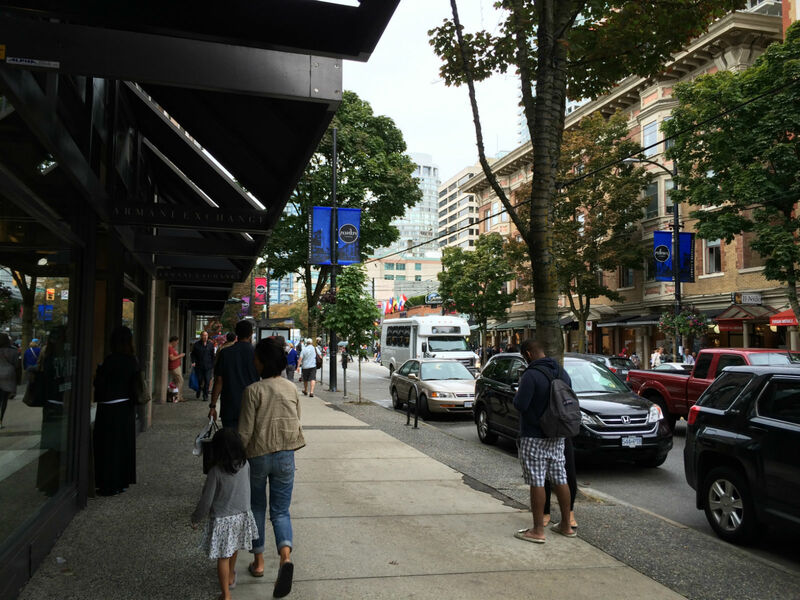 On the way to the Harbour we notice a queue of people in front of an ice cream shop. 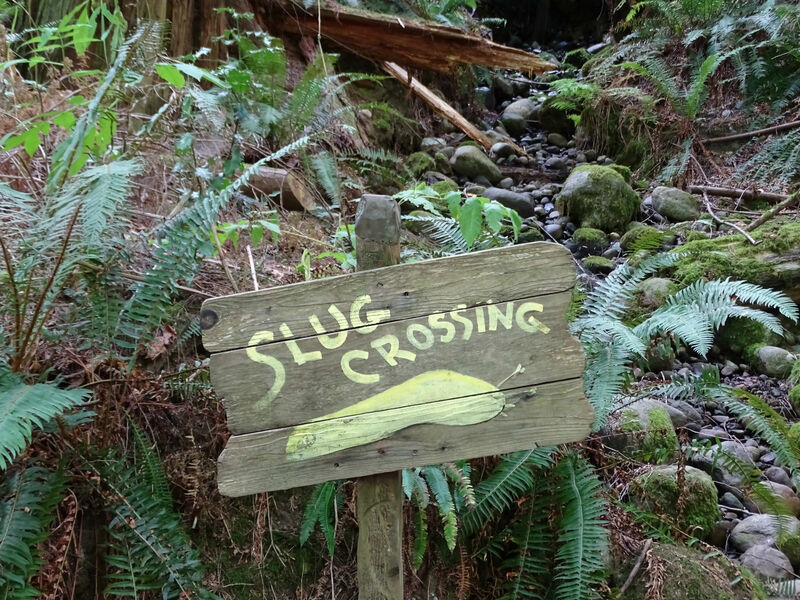 This is a good sign, so we too stand in line. 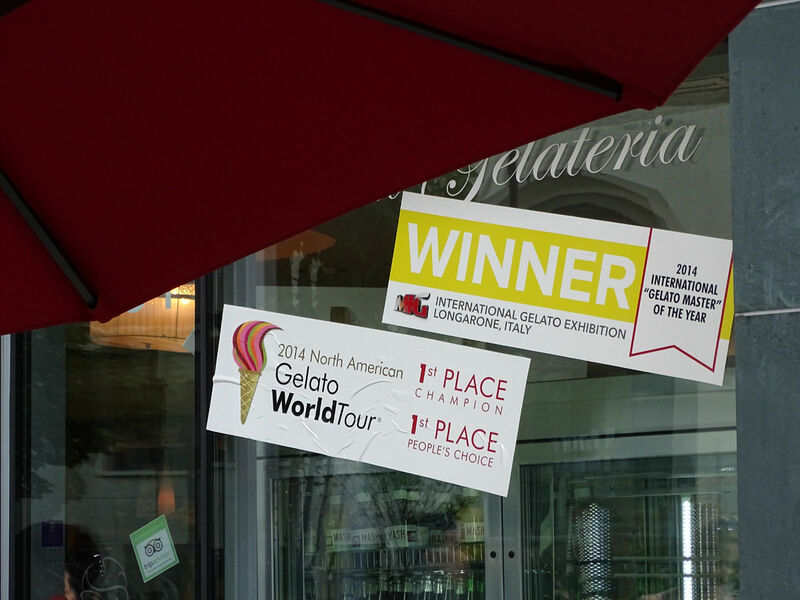 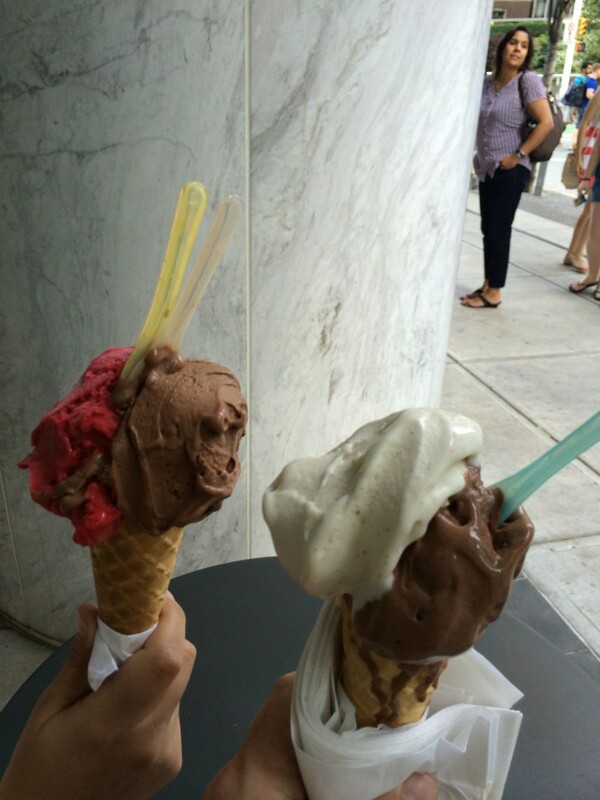 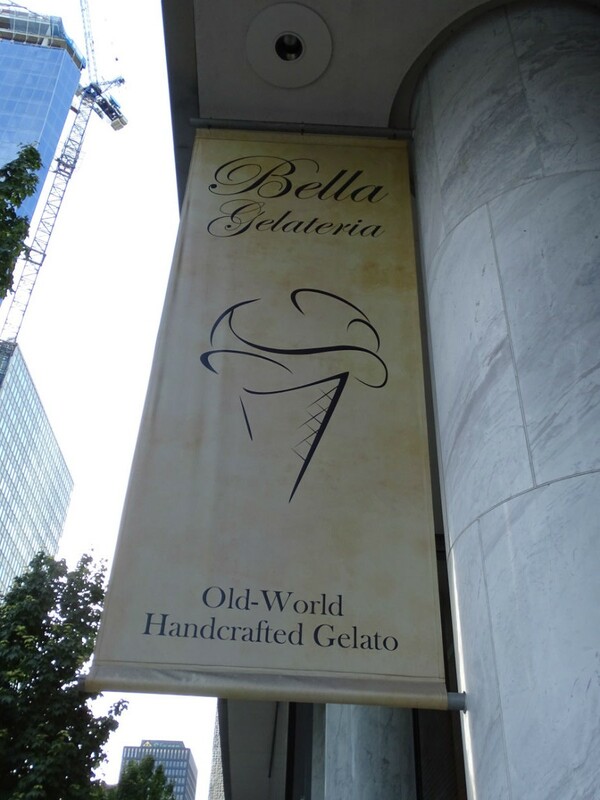 😉 We land at the “2014 International Gelato Master of the Year” and the ice-cream really is, world champion worthy. 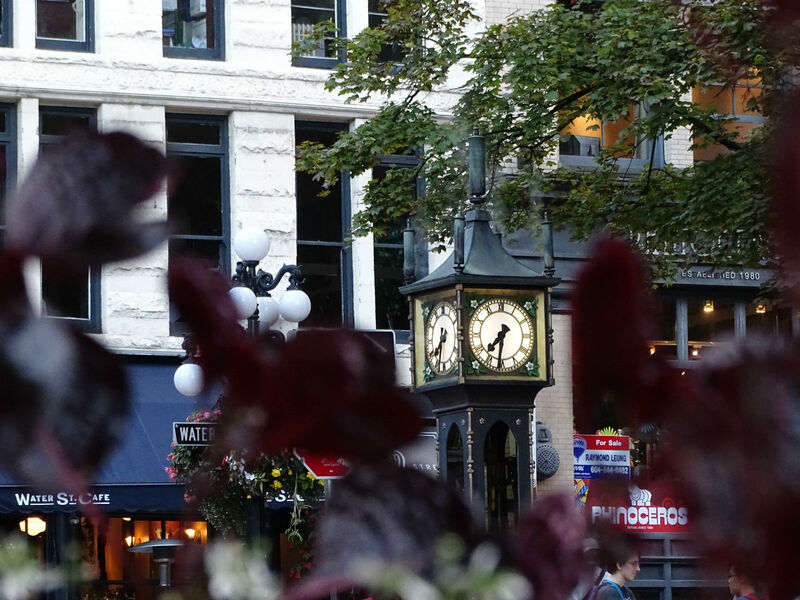 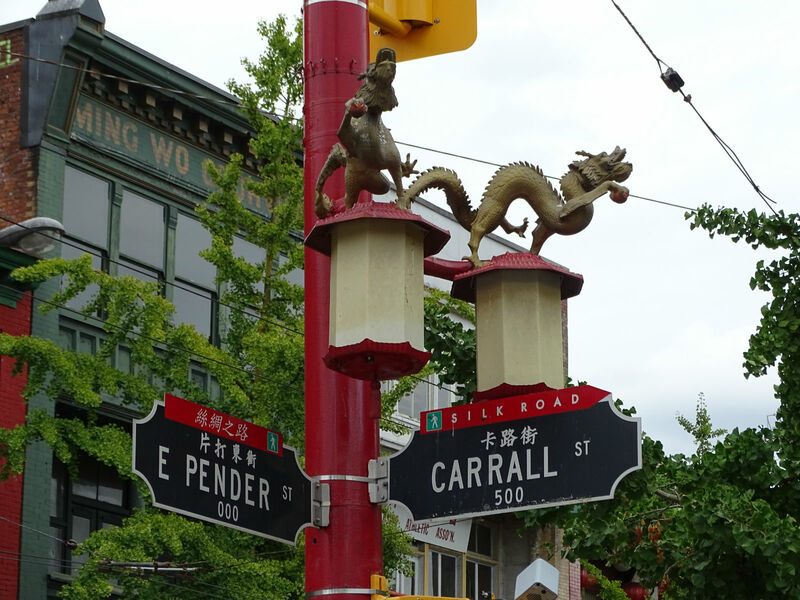 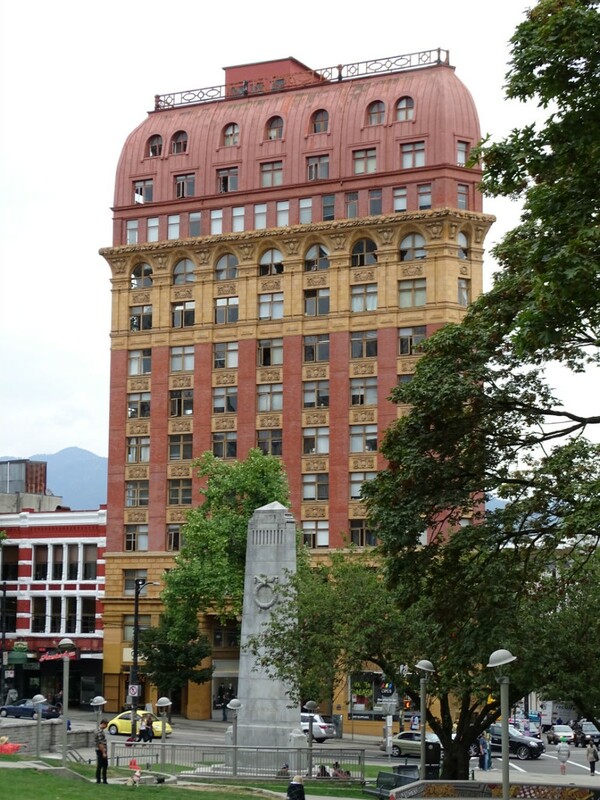 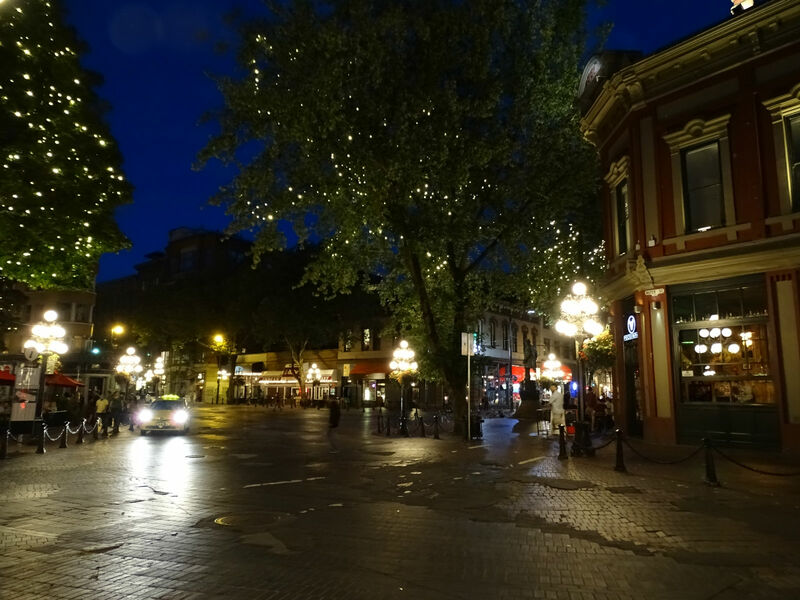 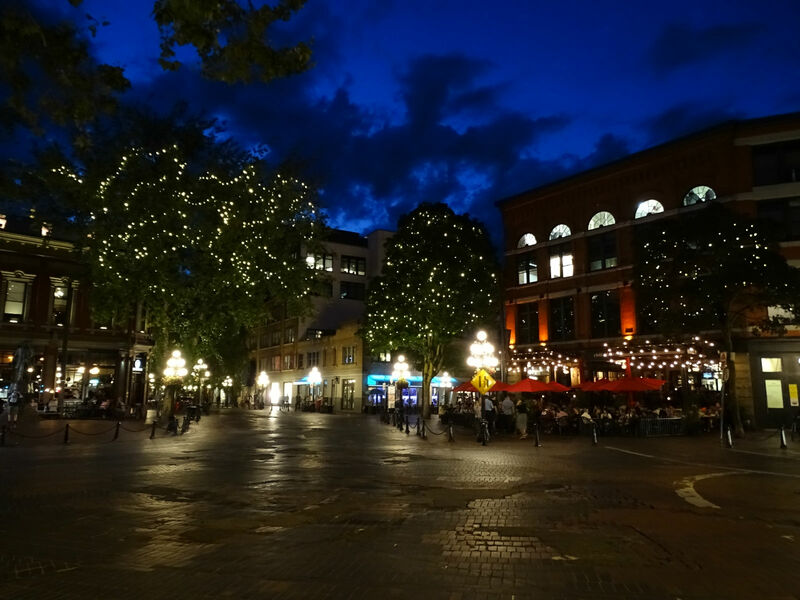 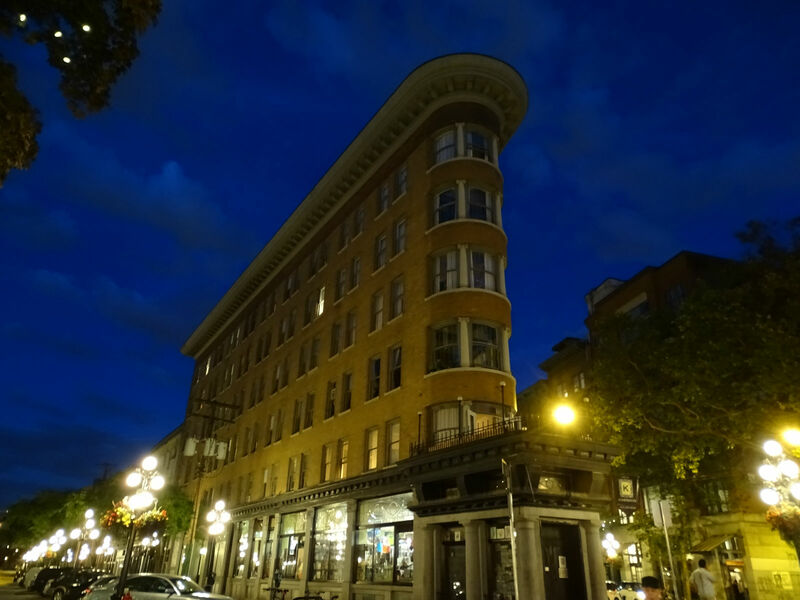 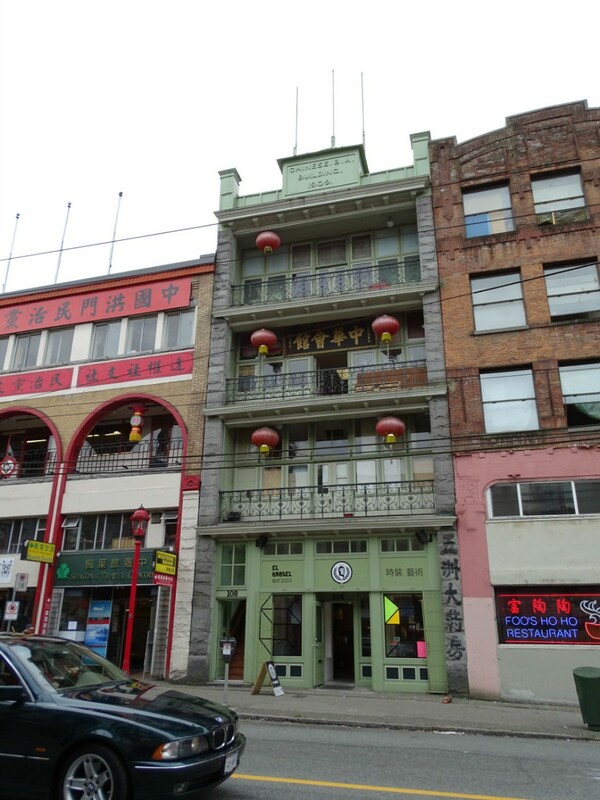 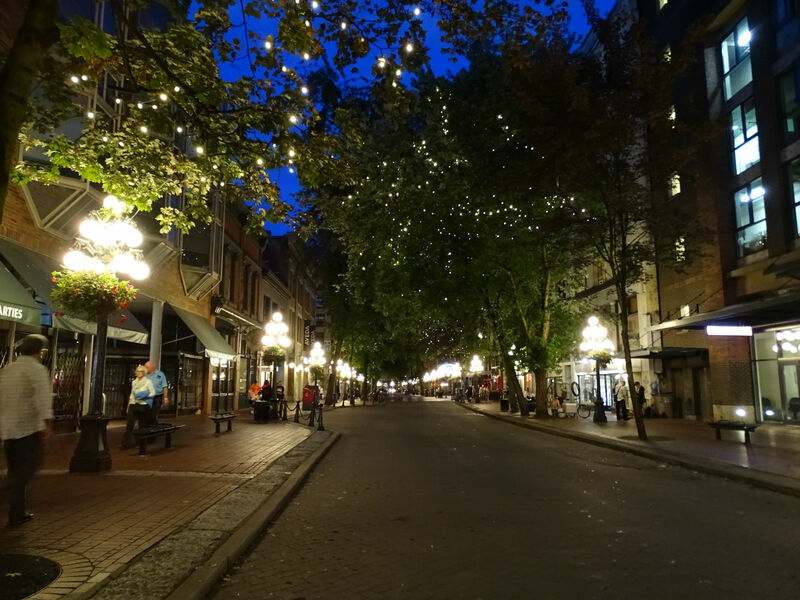 Our next destination of our city exploring tour is the Gastown district, the historical heart of Vancouver. 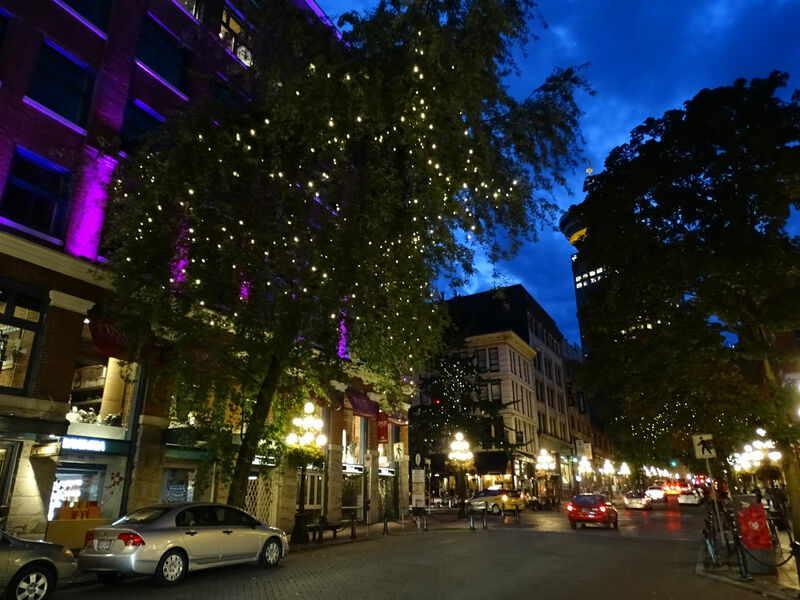 The Water Street is nicely decorated, with leafy street lights, small shops and restaurants. 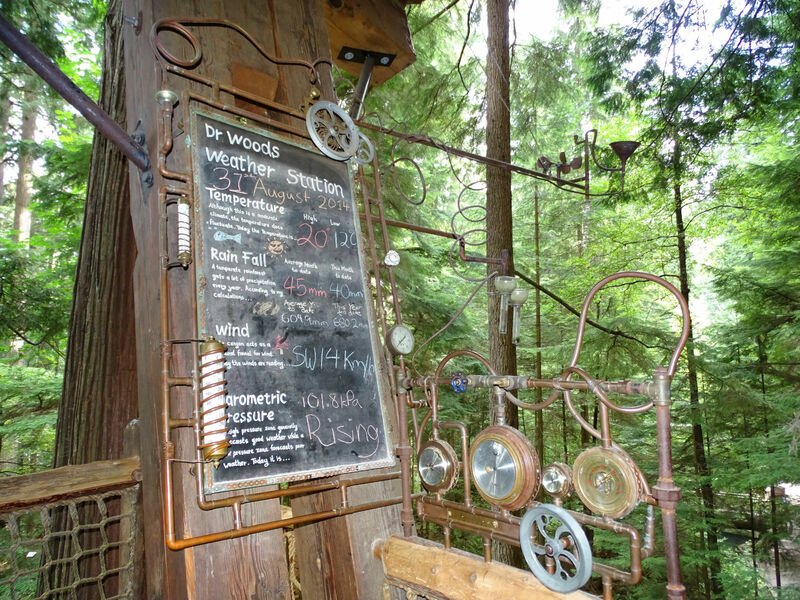 Here is also the Steam Clock. 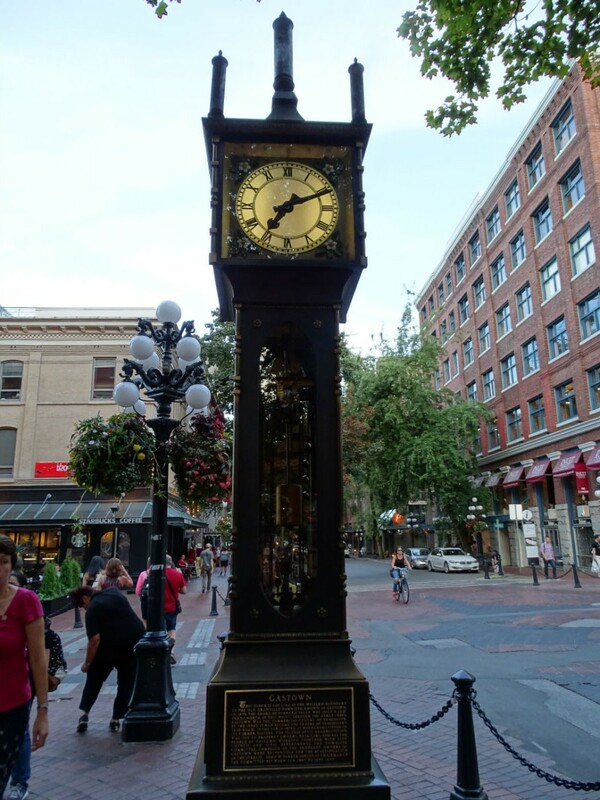 Over dinner at the “Black Frog”, in the alley Cambie Street, we have the Steam Clock in view and hear its whistling at every quarter-hour. 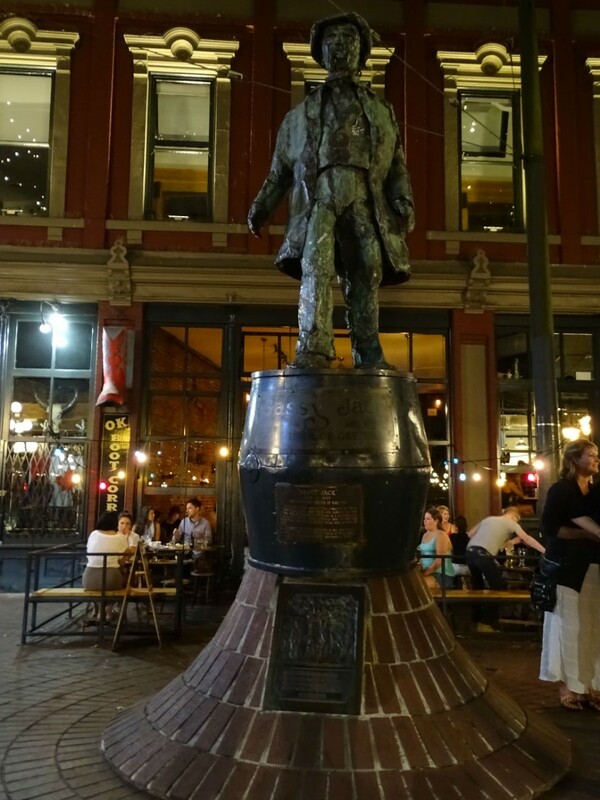 Then we walk on to Maple Tree Square, where Gassy Jack stands, the namesake of Gastown. 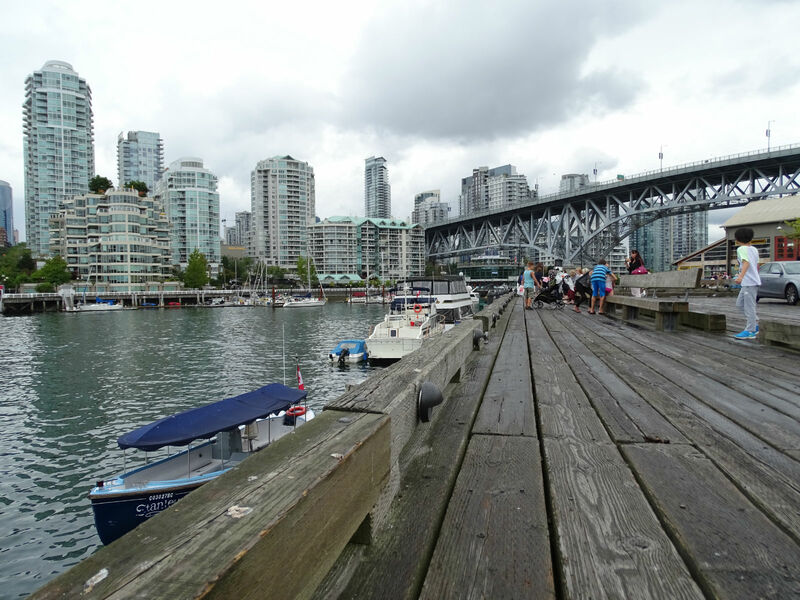 On a less beautiful side street, we go back to Harbour Centre and the Lookout. 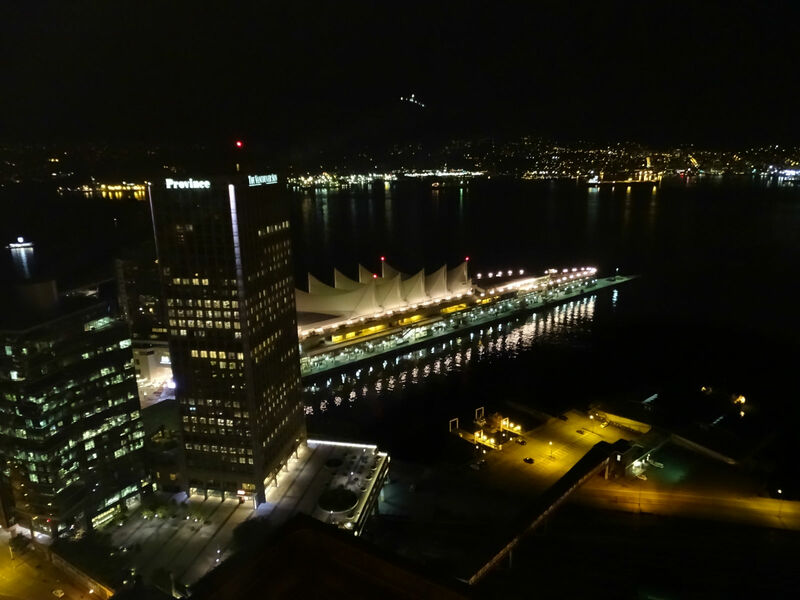 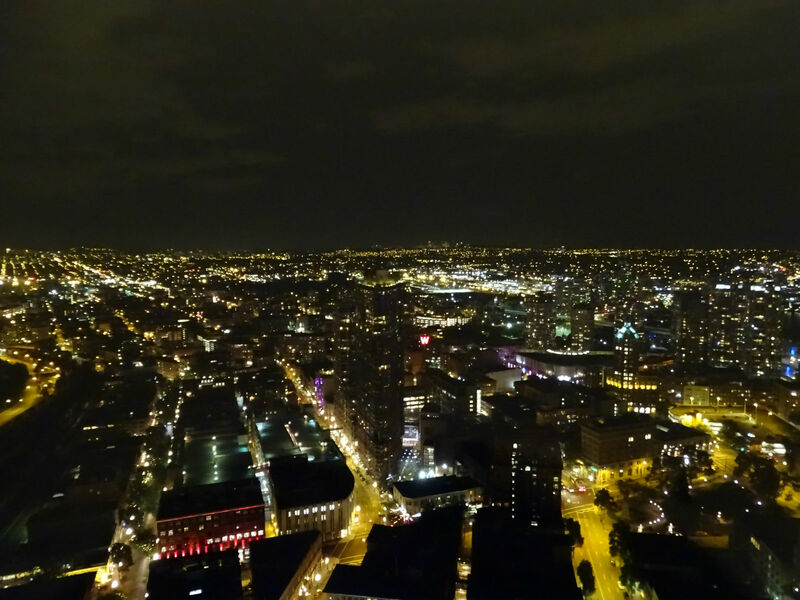 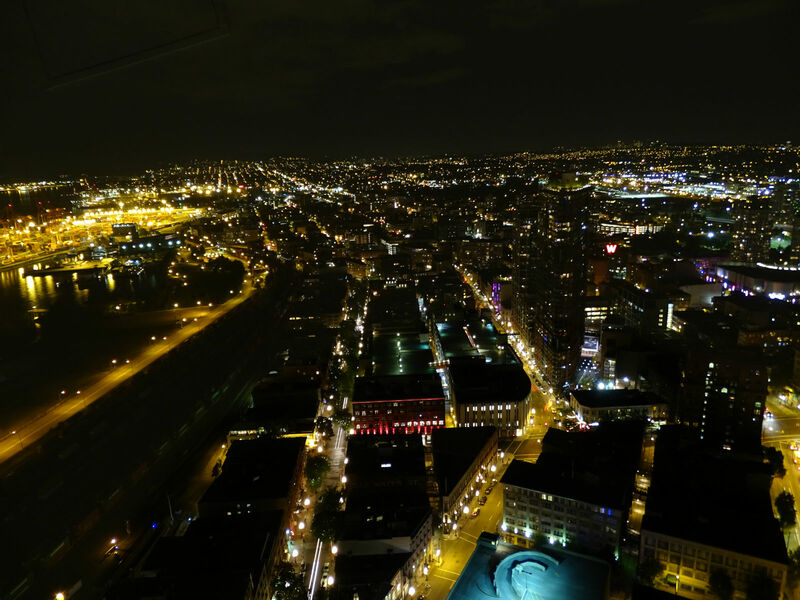 Now we look at Vancouver by night from above. 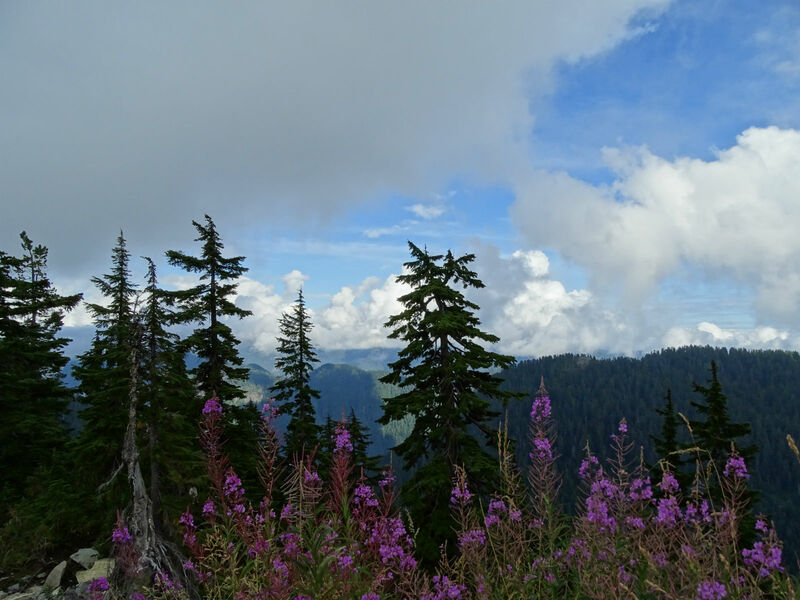 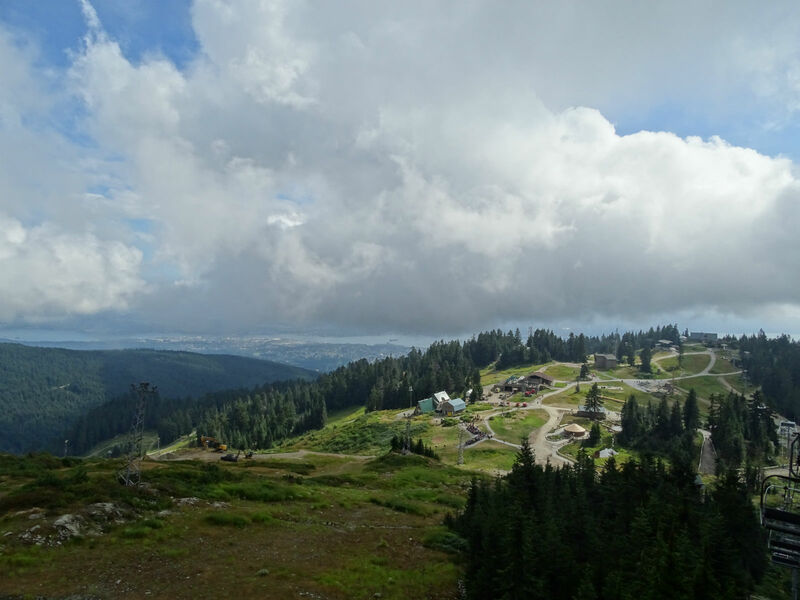 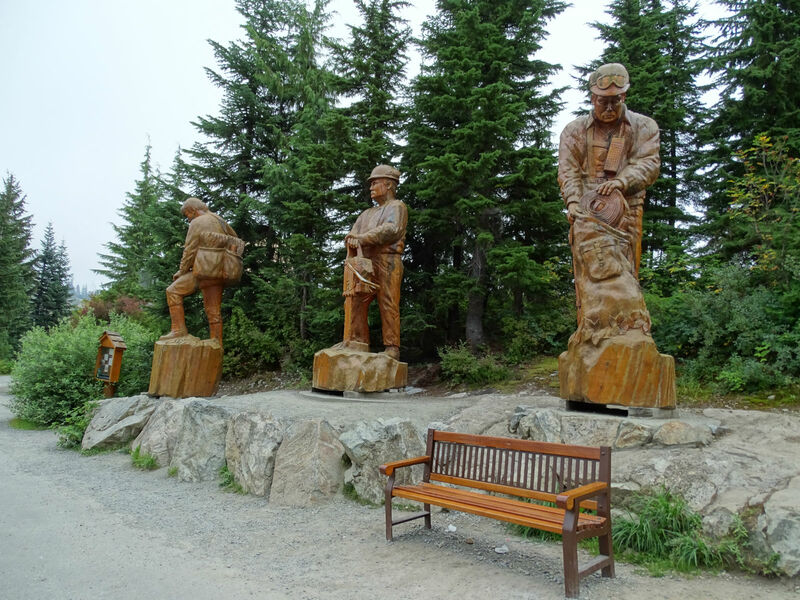 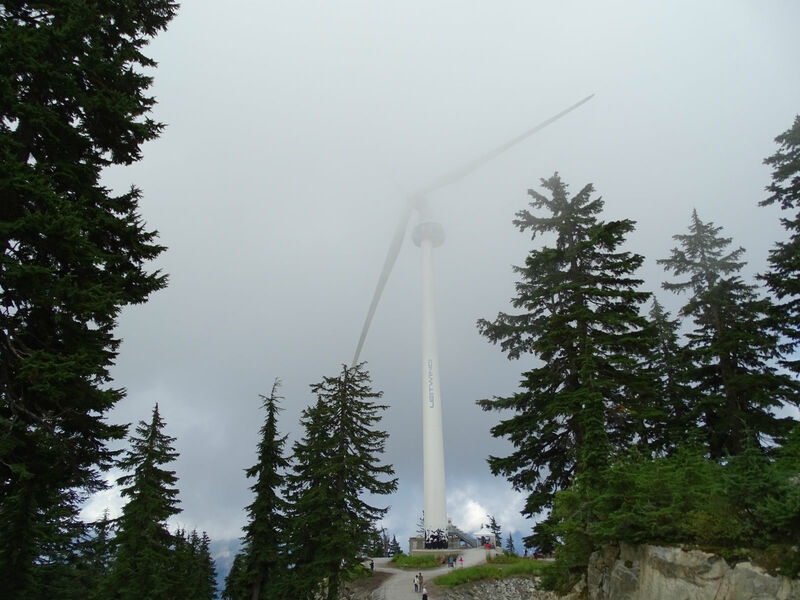 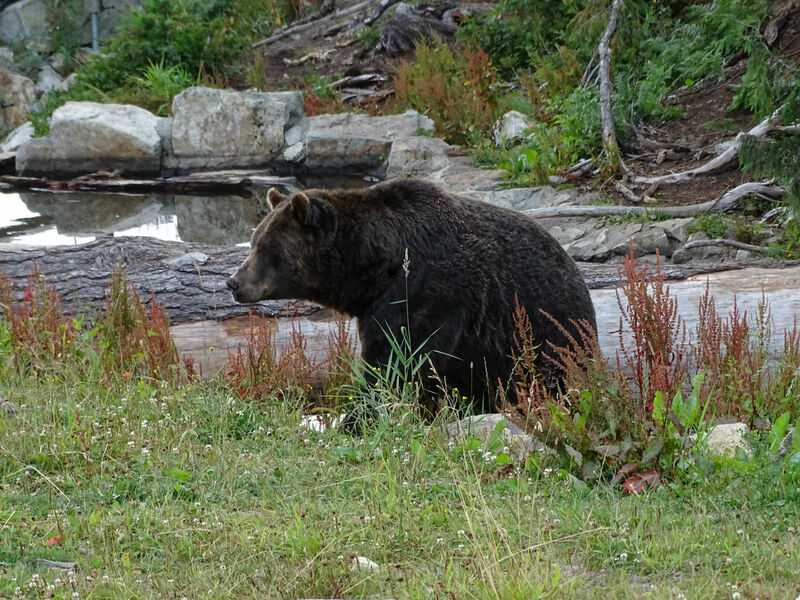 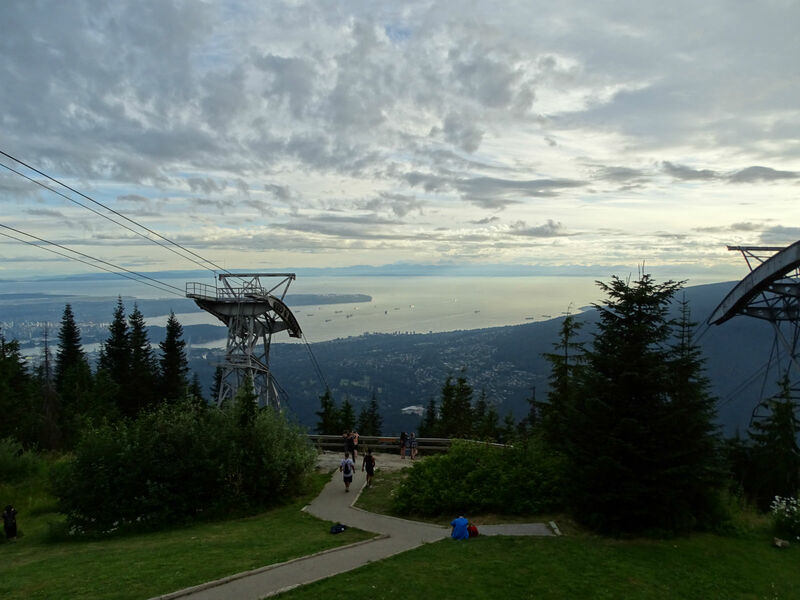 28 August, 2014 – Today we pay Vancouver’s’ Mountain – Grouse Mountain – a visit. 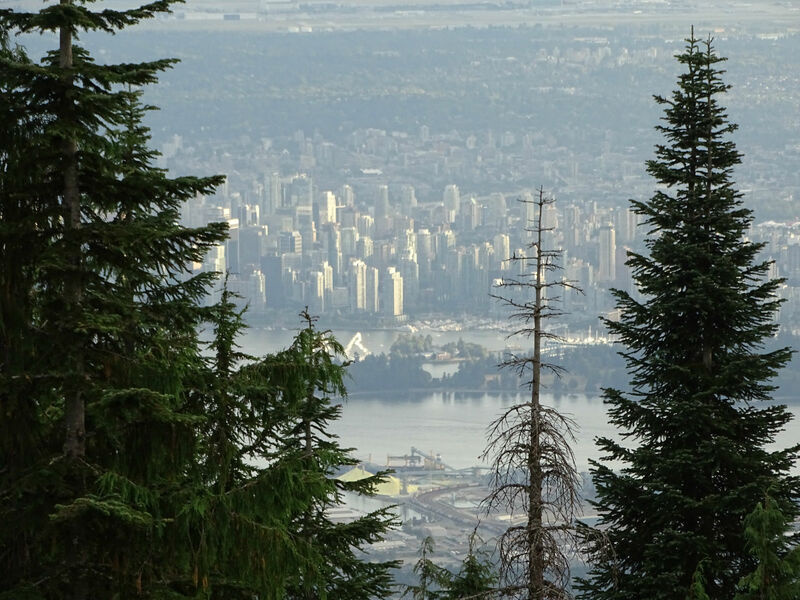 A free shuttle bus is offered which runs from Canada Place to Grouse Mountain. 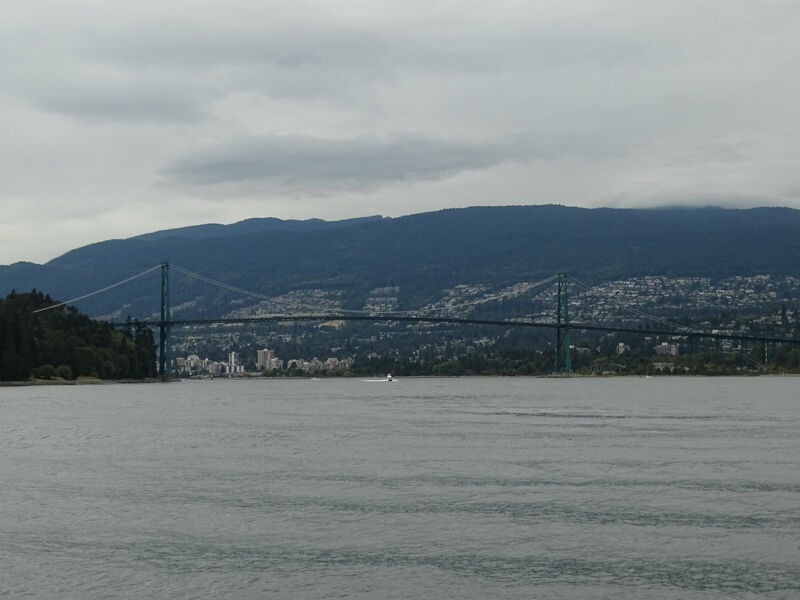 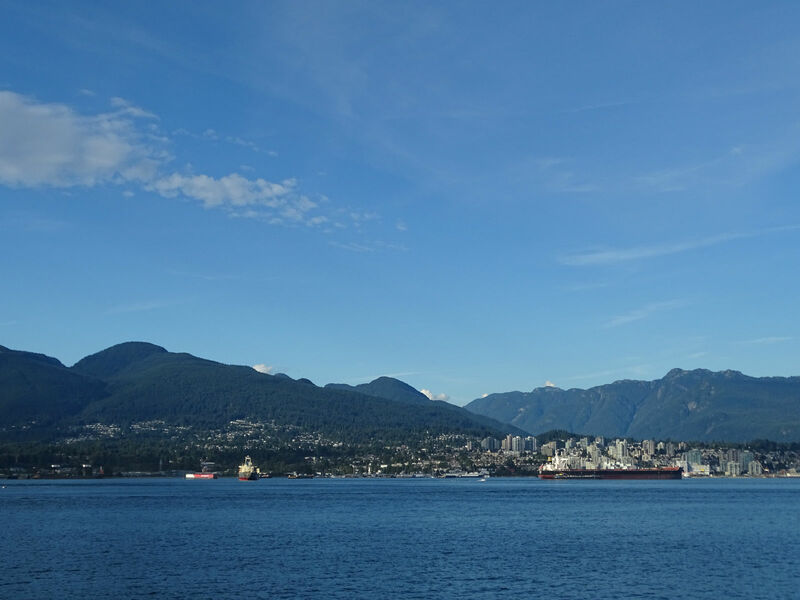 We decide against it, as we prefer taking the Seabus across Burrard Inlet to North Vancouver. 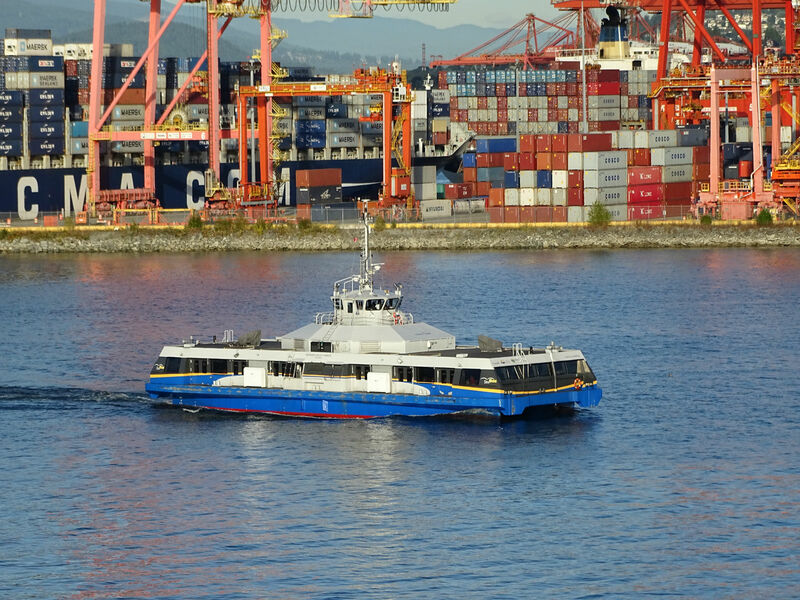 Seabus in this case, really means bus. 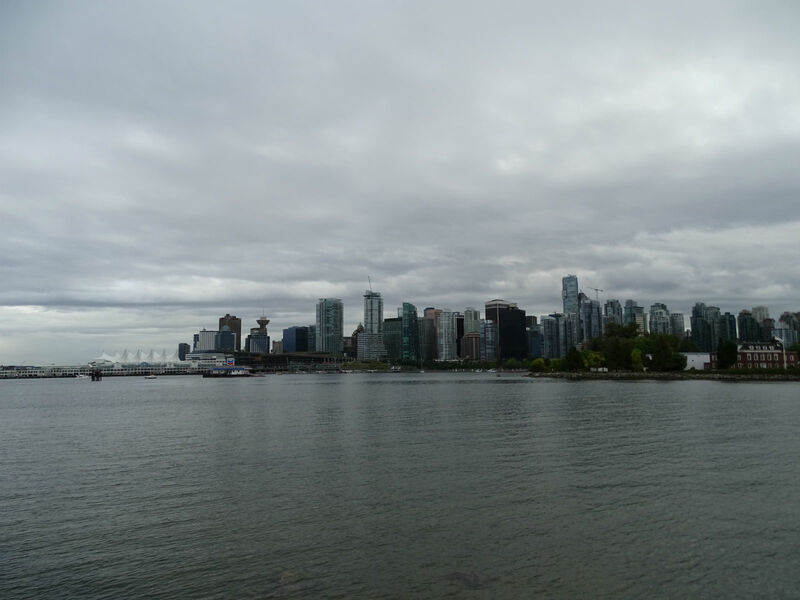 We are not talking about a nice ferry on which one can let the wind blow through their hair, as you enjoy the view of Vancouver. 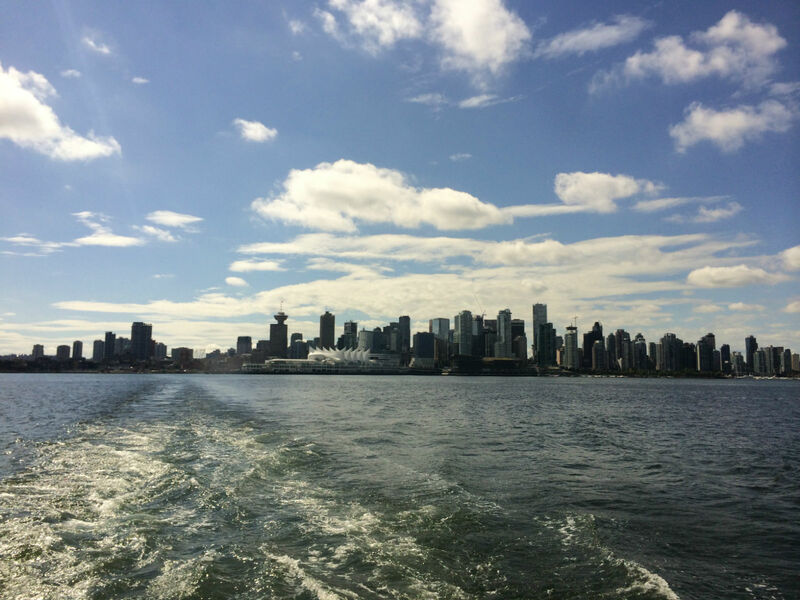 The Seabus is closed and you can, at most, look out the window. 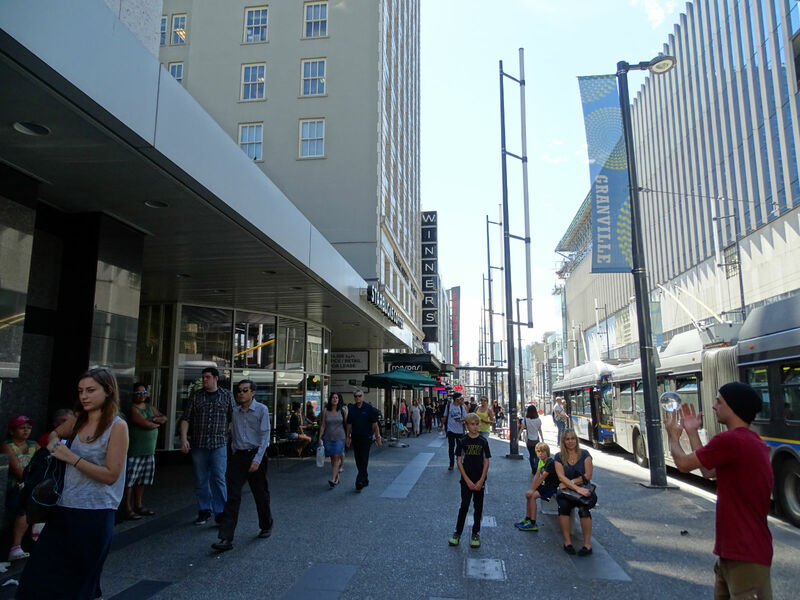 A day ticket for public transport costs $ 9.75. 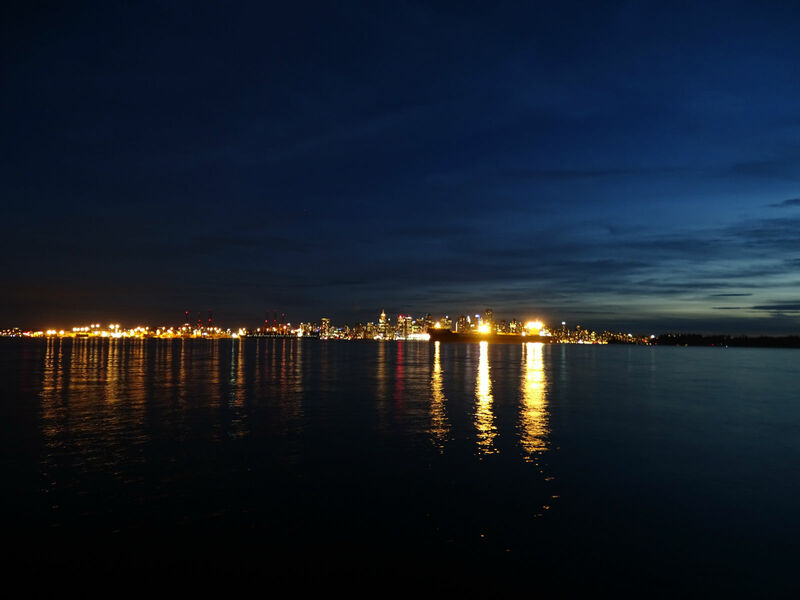 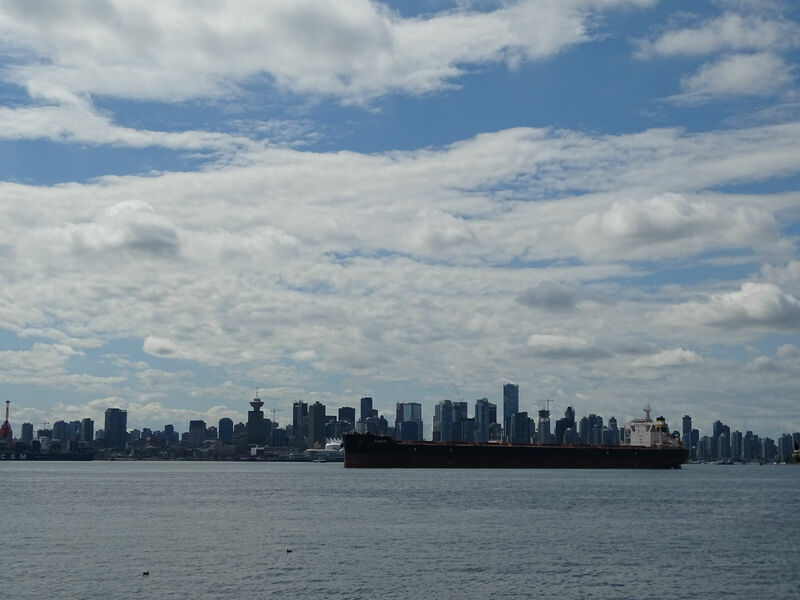 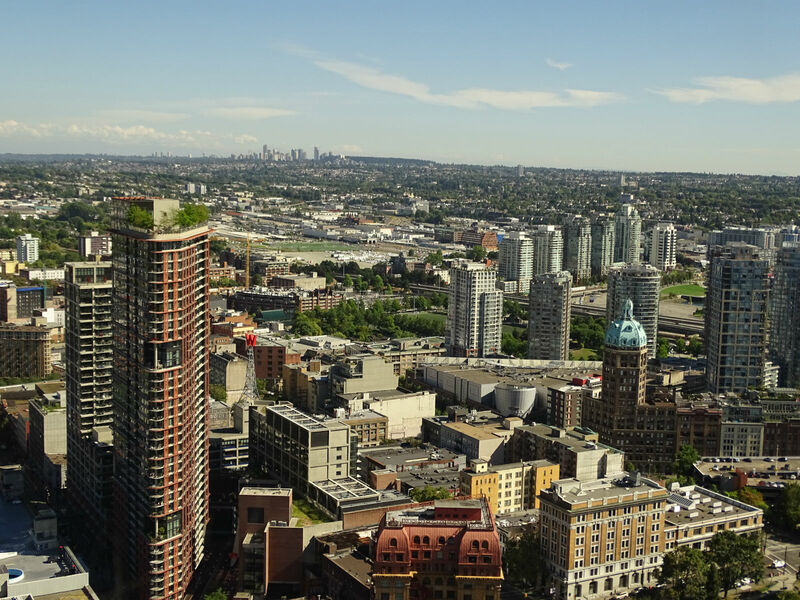 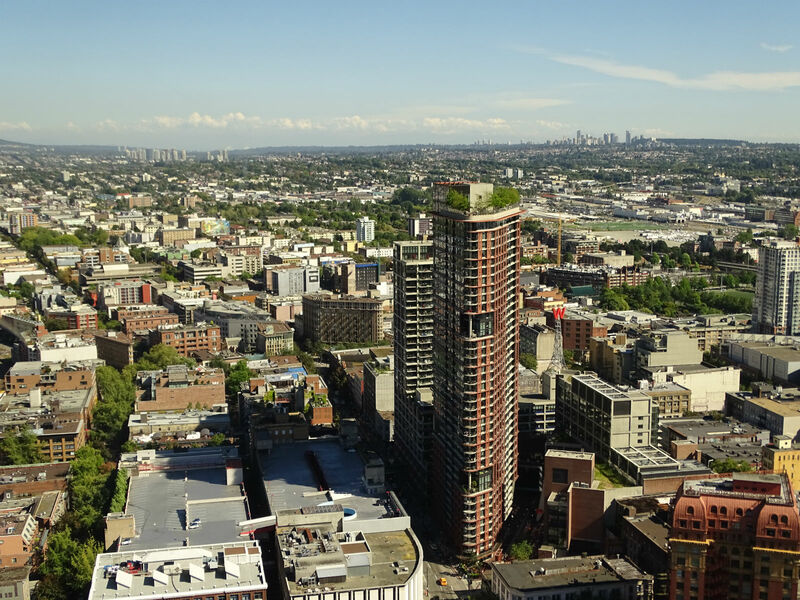 Once on the north side, we enjoy the view of the Vancouver skyline. 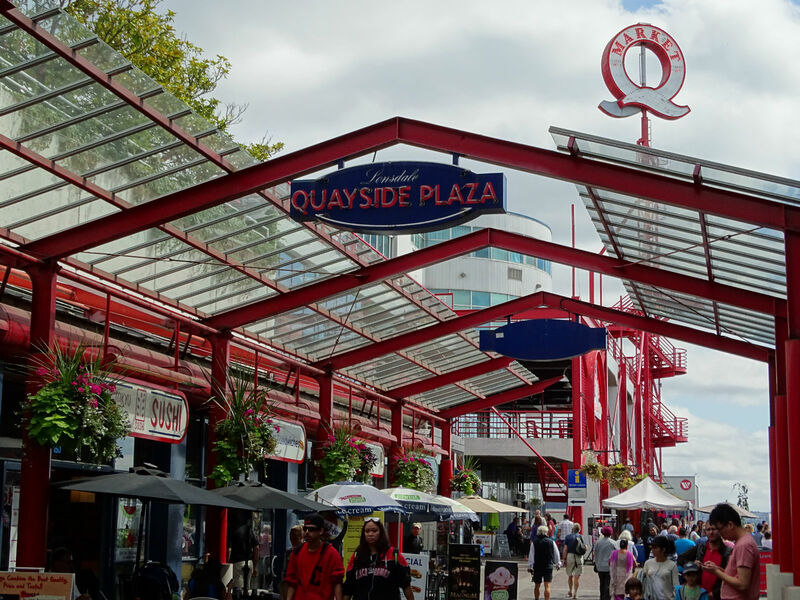 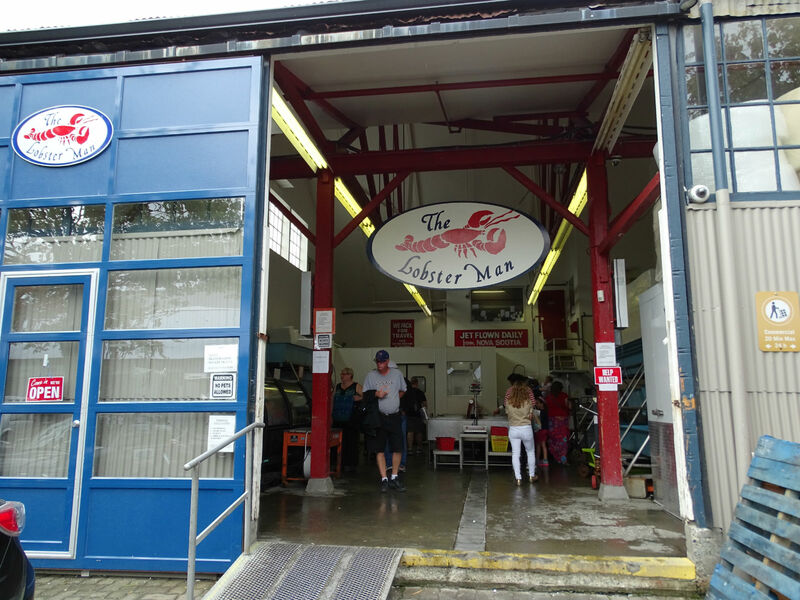 Then we visit the Lonsdale Quay Market. 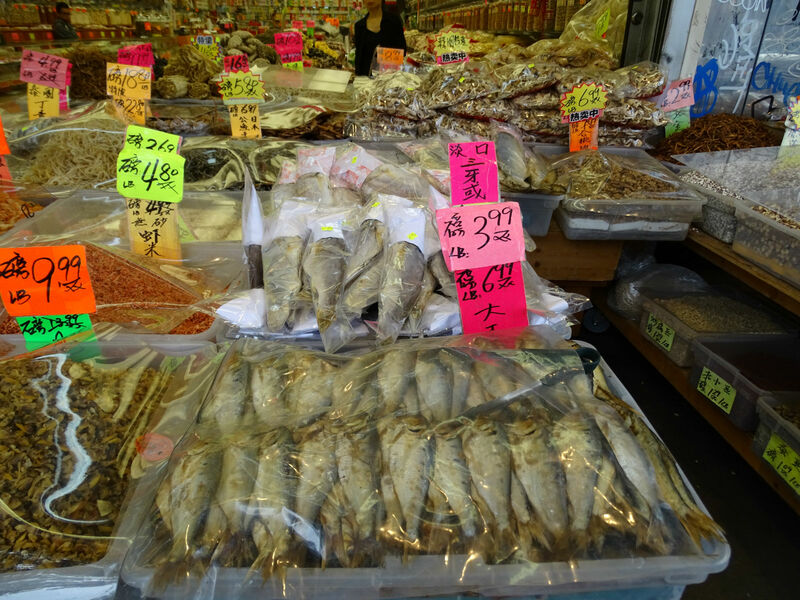 A typical market hall in which food is sold. 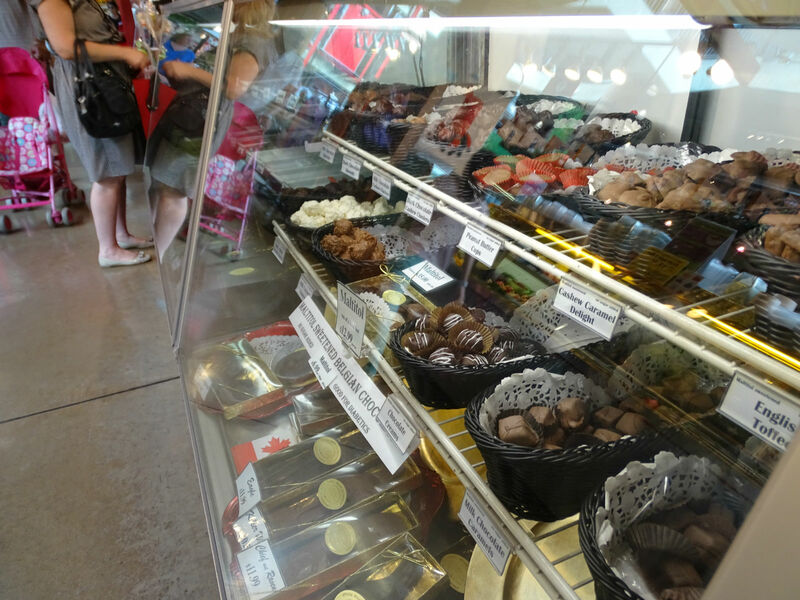 Other than that, there are also several shops, restaurants, snack bars and bakery stands. 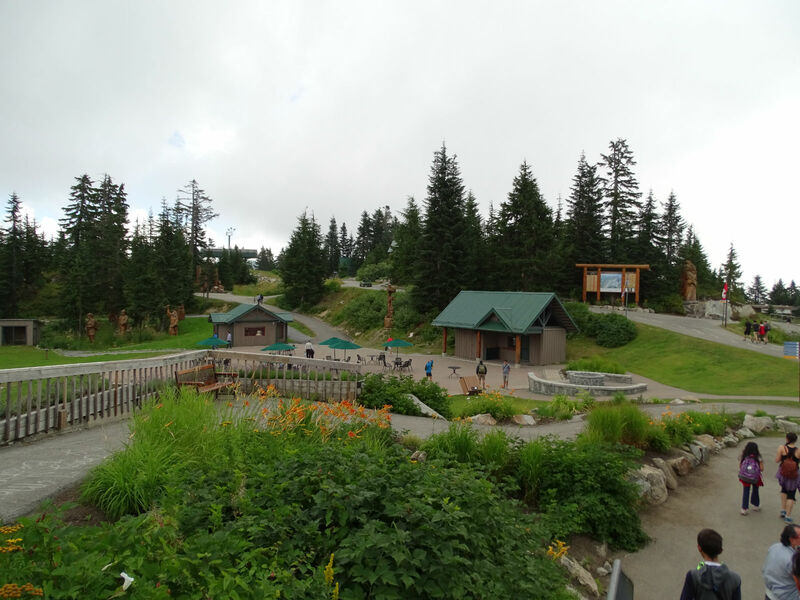 Bus line 236 takes us, with an approximately 20-minute drive, to the valley station of Grouse Mountain. 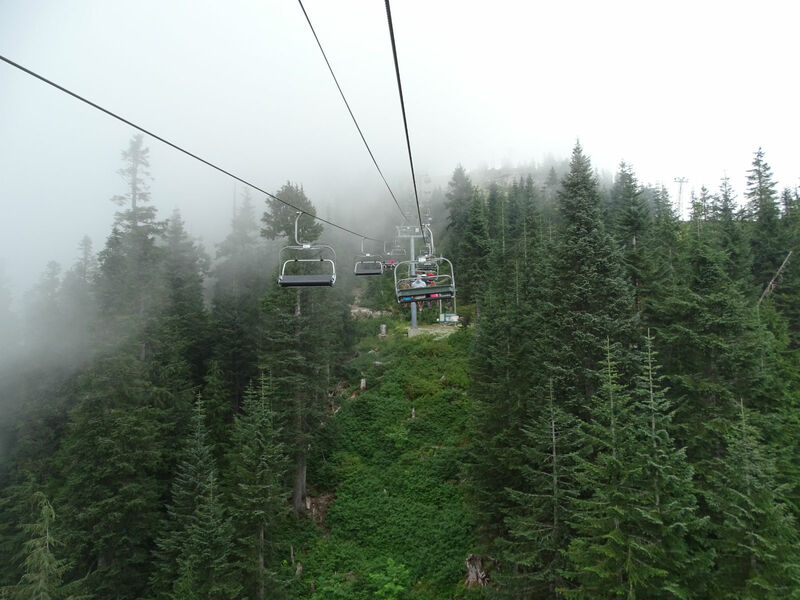 At $42, the cable car is not exactly cheap. 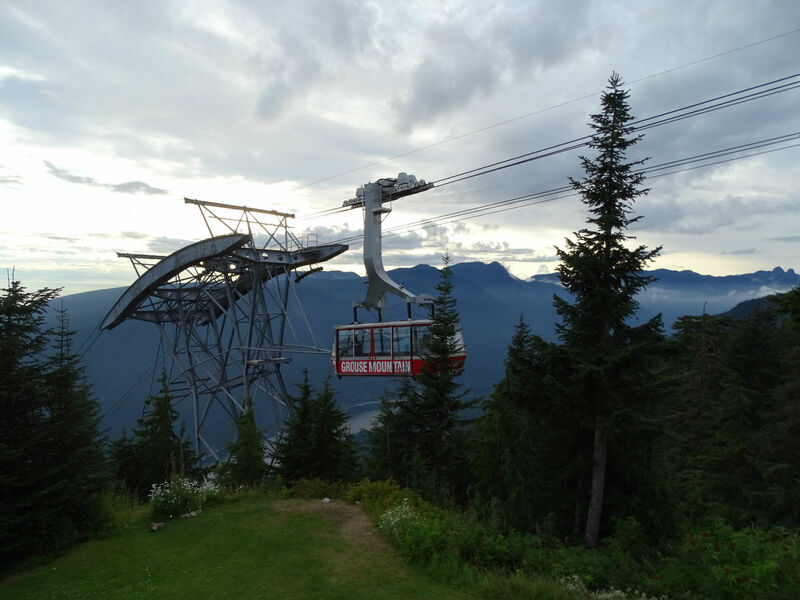 If you then still want to take the chair lift to the top, you pay a total of $46. 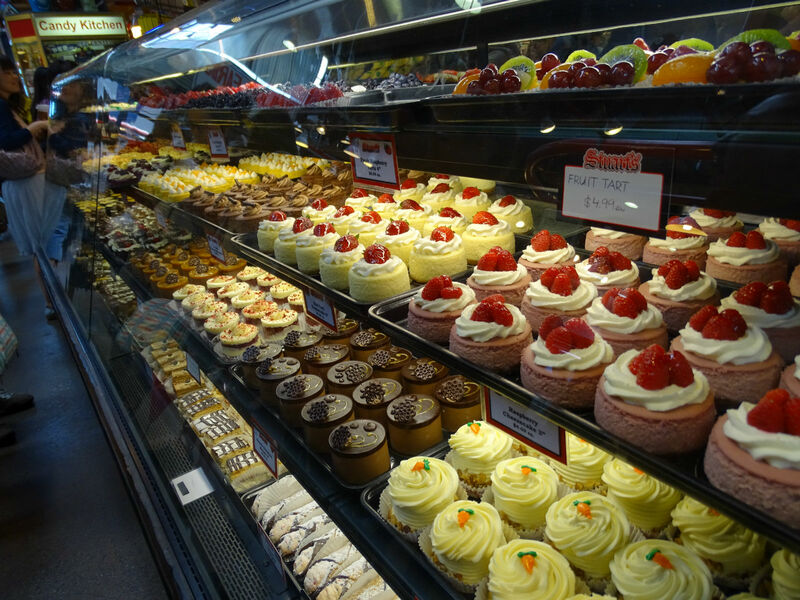 However, for that there is also a lot on offer. 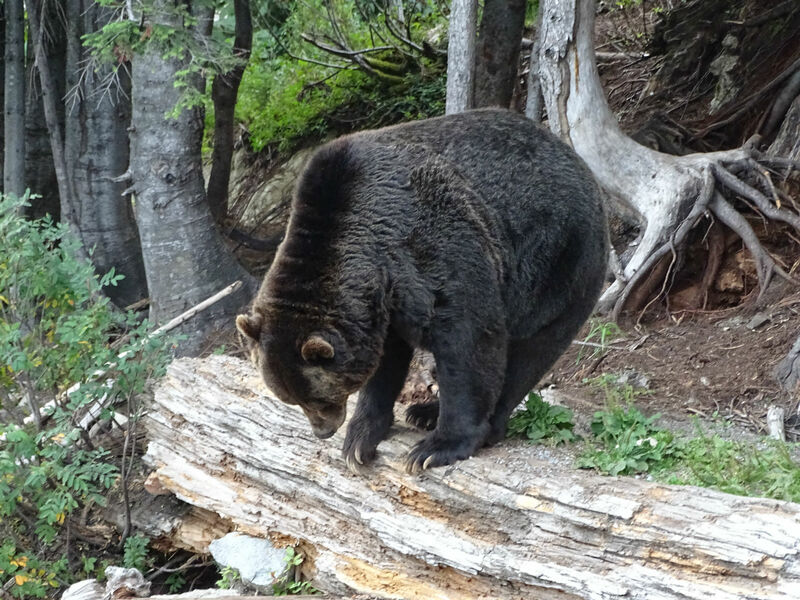 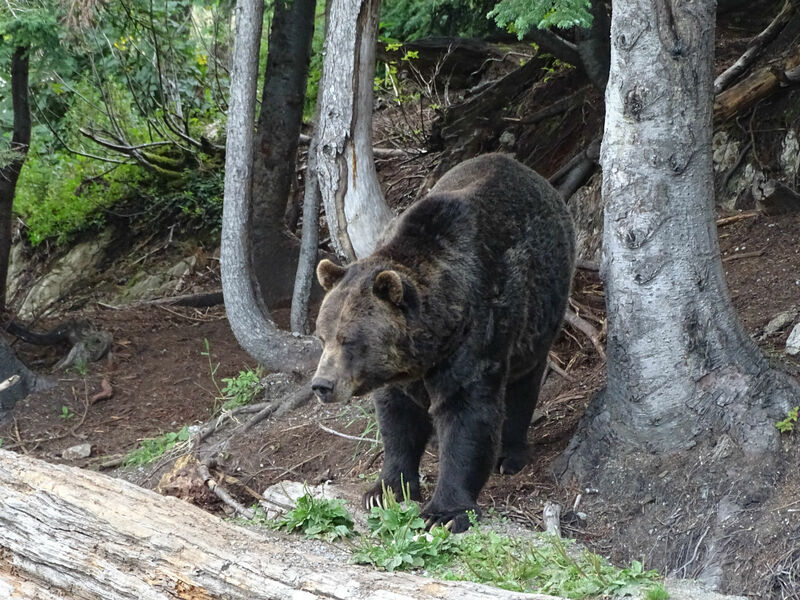 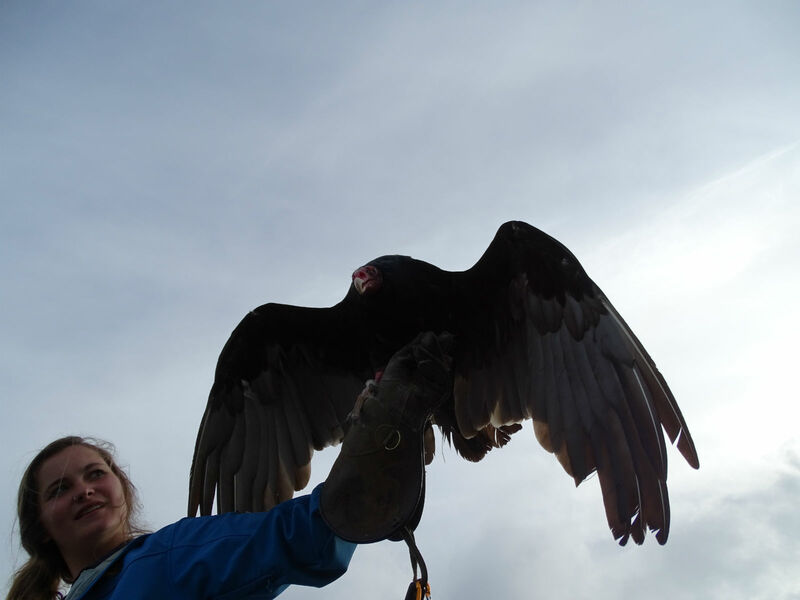 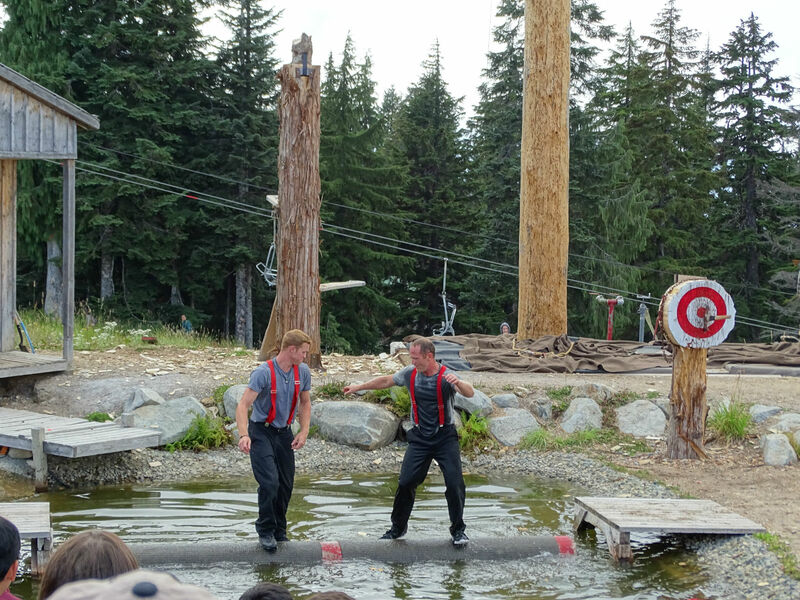 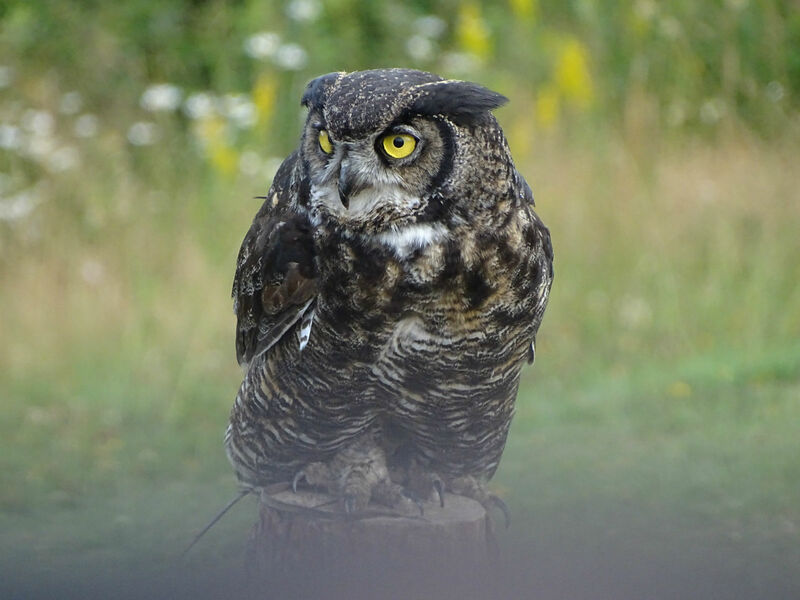 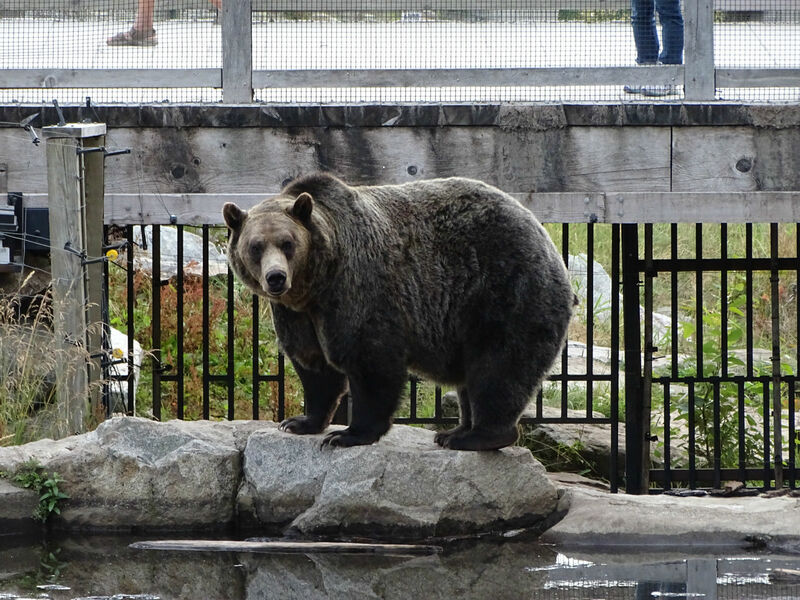 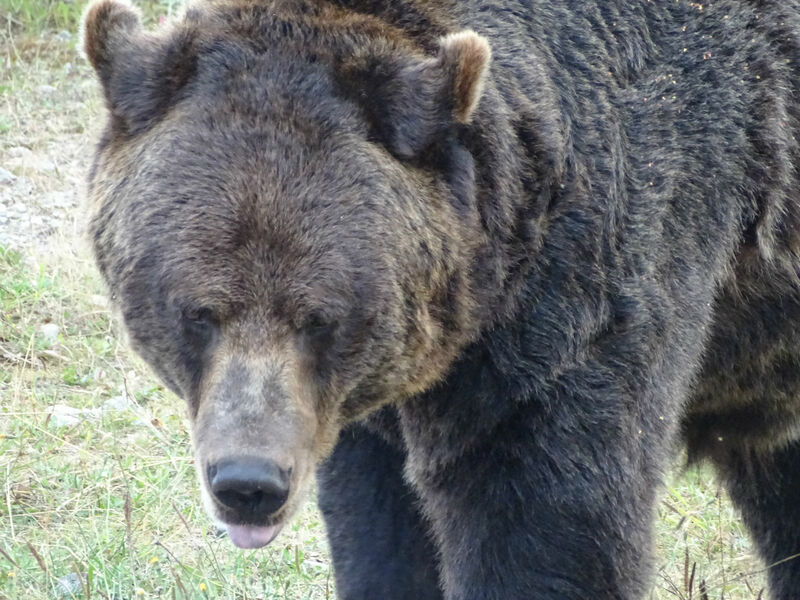 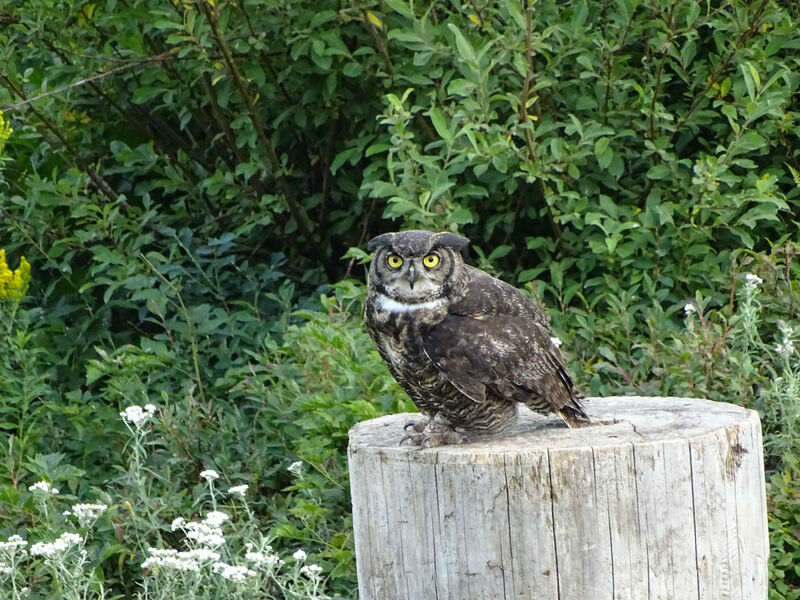 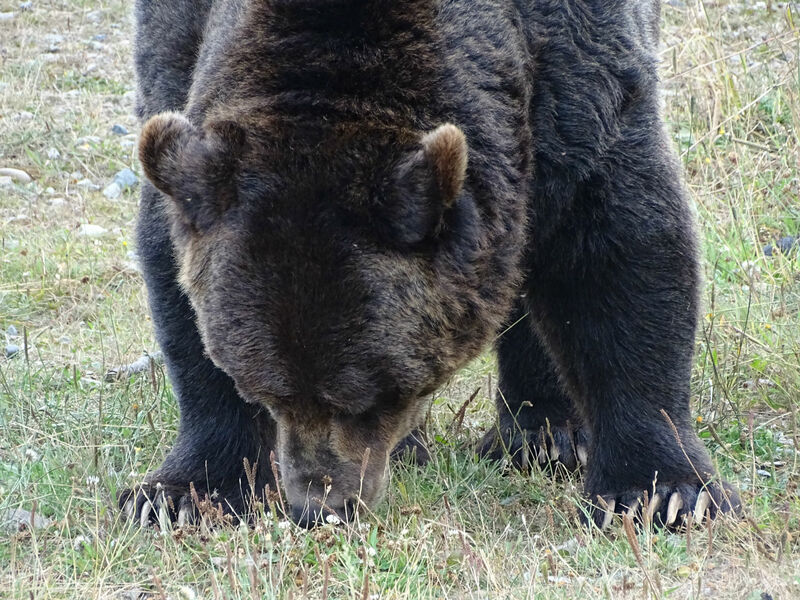 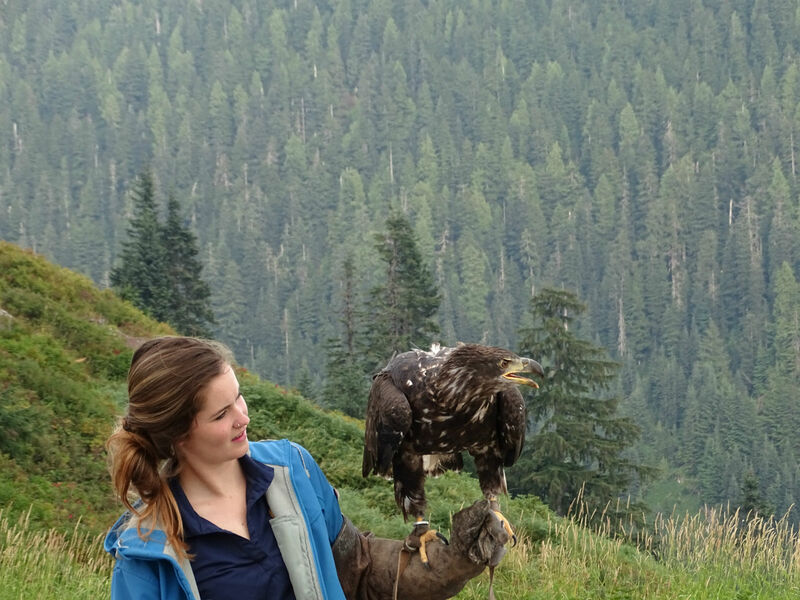 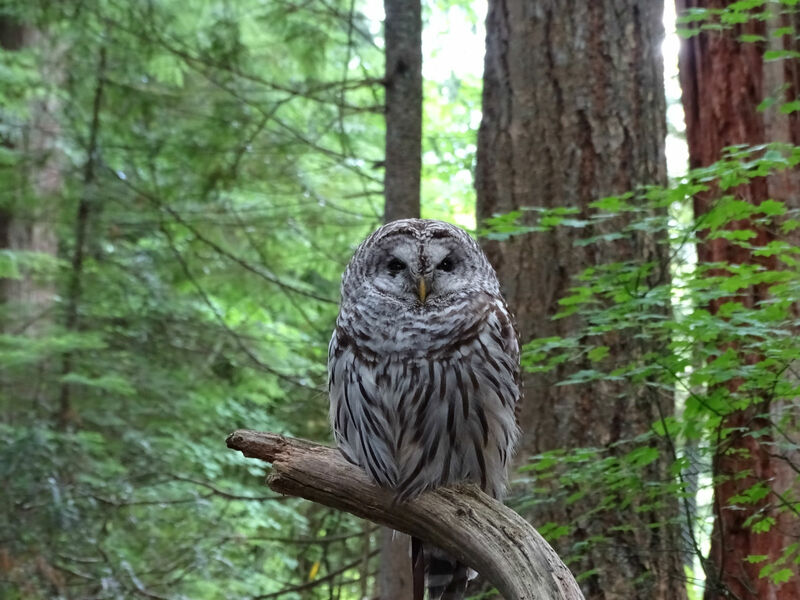 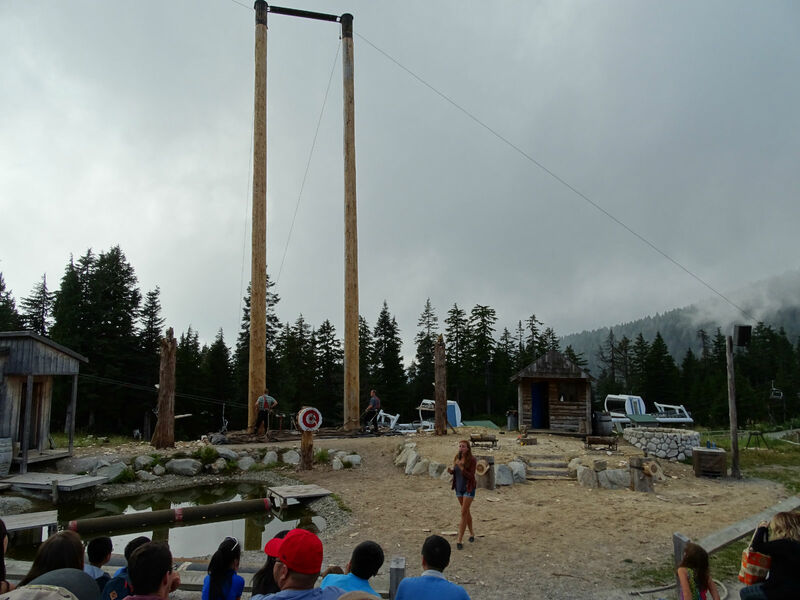 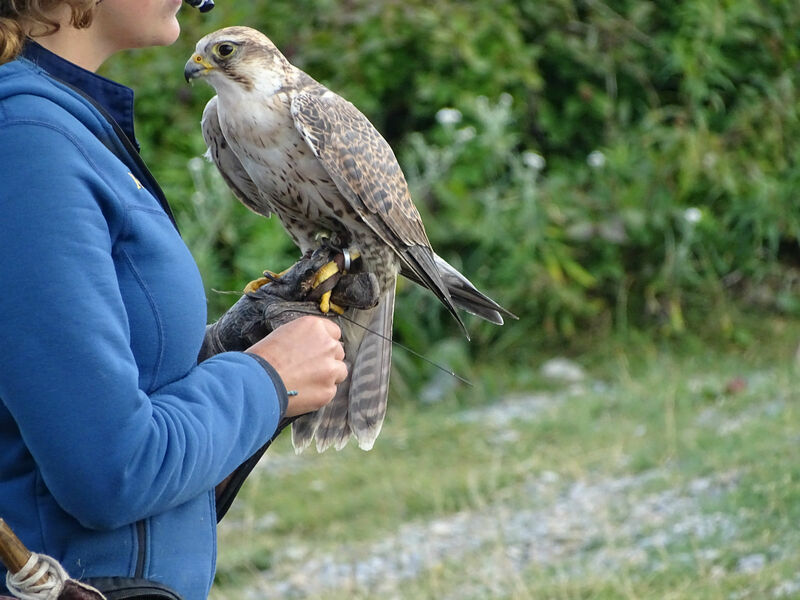 There is an animal care facility for orphaned grizzly bears, guided walks with the Rangers, a really humorous Lumberjack show, a birds of prey show and great views. 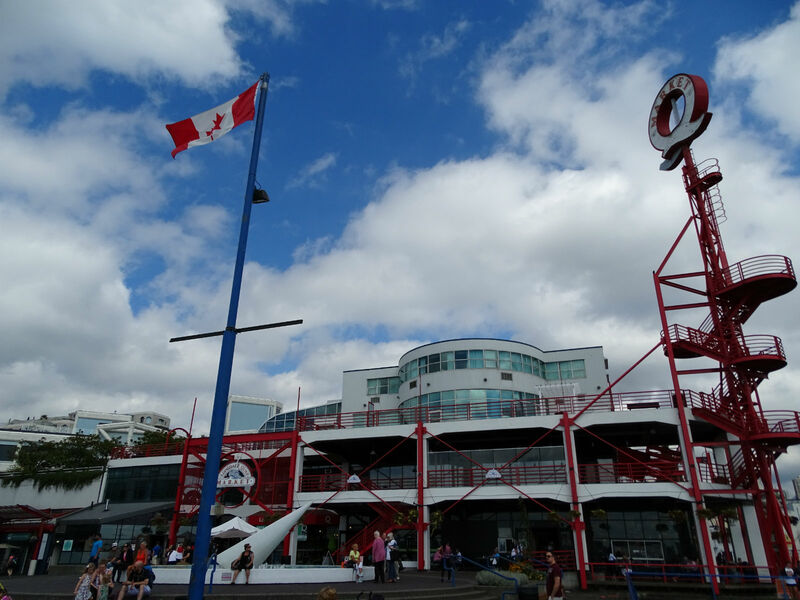 It is of course quite touristically laid out, nevertheless, is still a good option to explore a little of the Canadian nature, when you’re really just on a city trip. 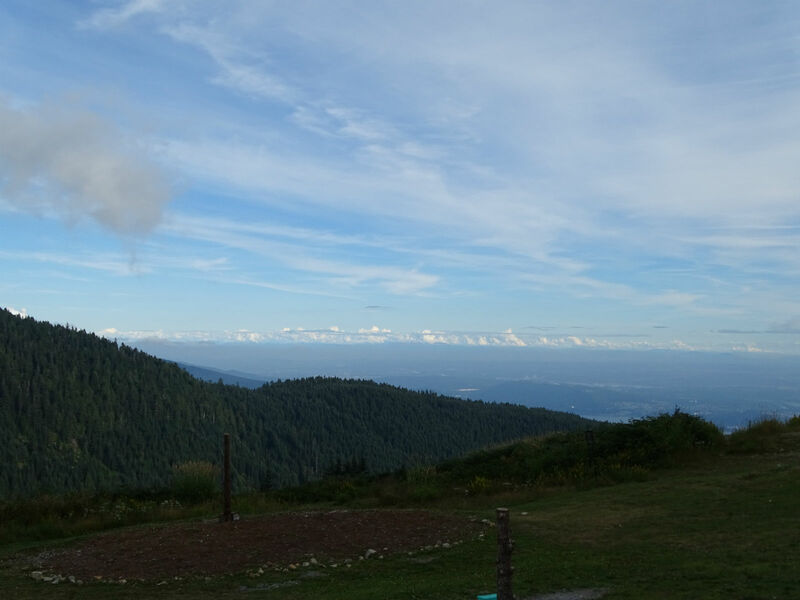 We spent a good 5 hours on the mountain and thus the admission price was worth it. 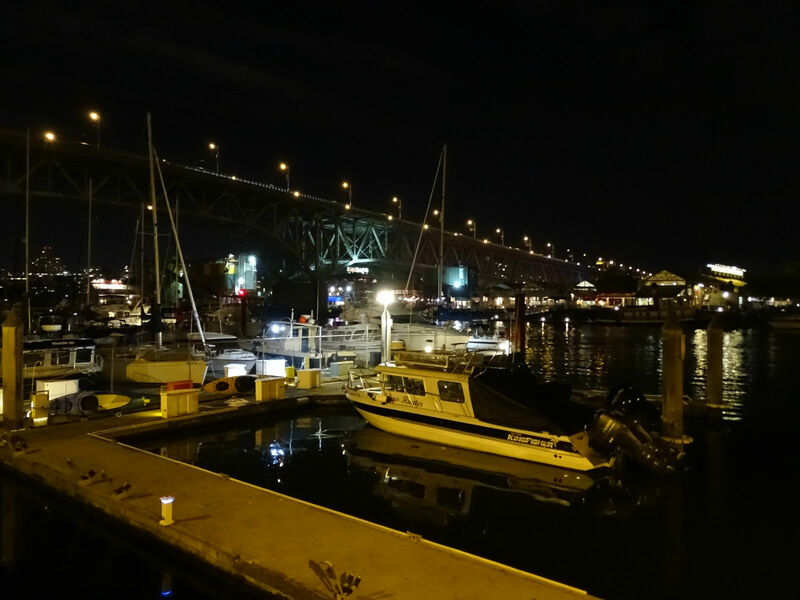 From Lonsdale Quay we have a great view of Vancouver at night, before returning with the Seabus. 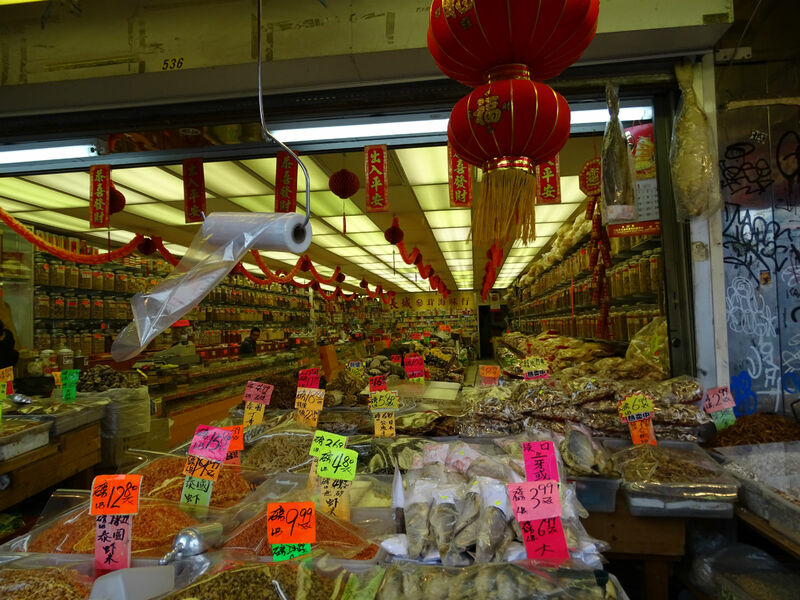 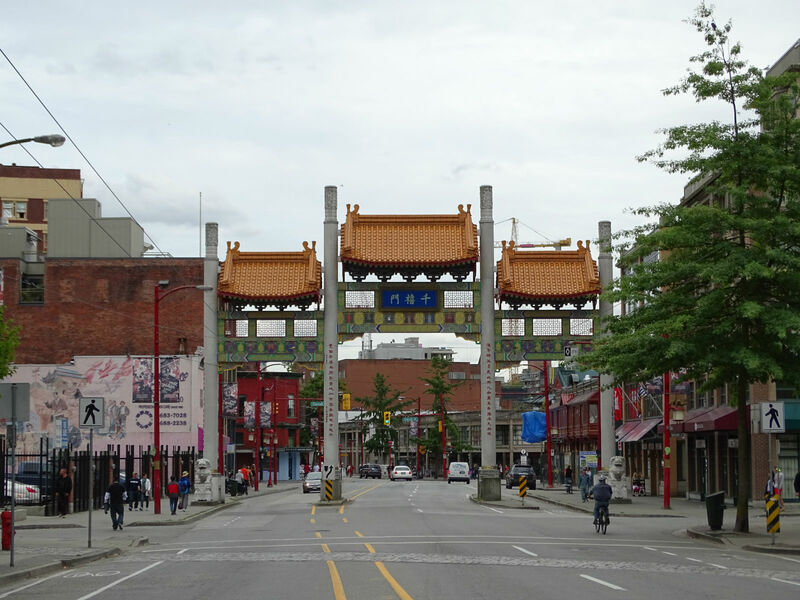 The next day, Chinatown, Robson Street and Stanley Park are on the program. 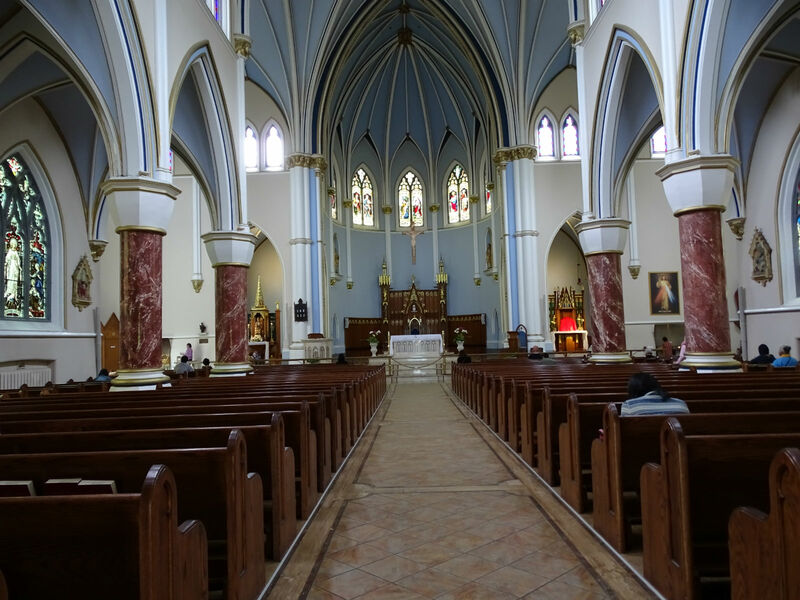 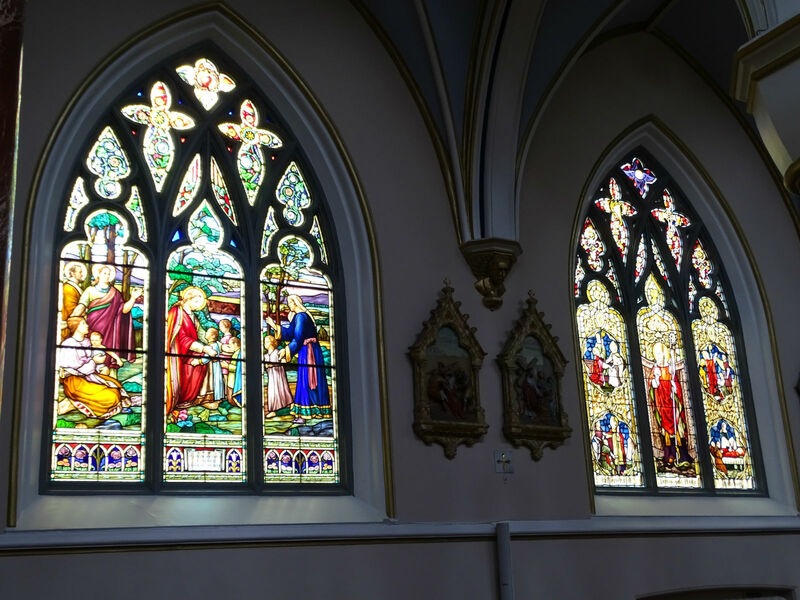 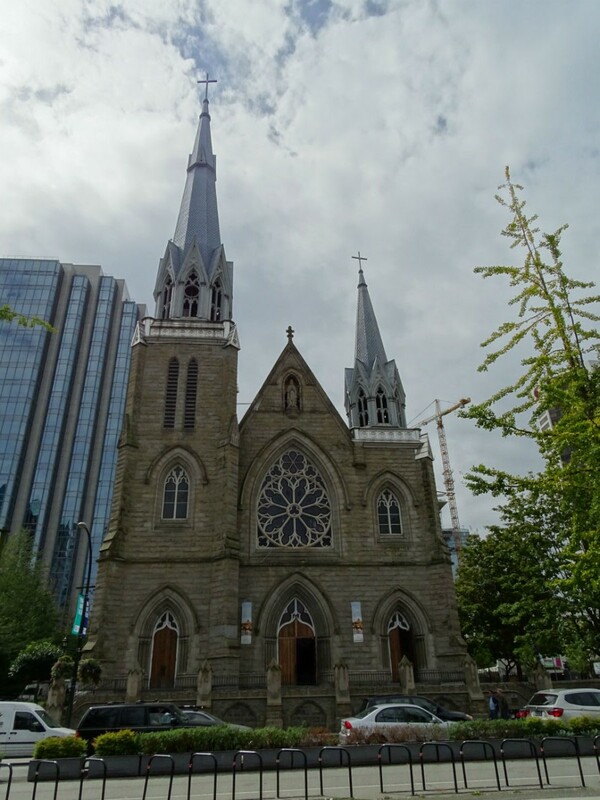 The route to Chinatown takes us past the Holy Rosary Cathedral and the Public Library. 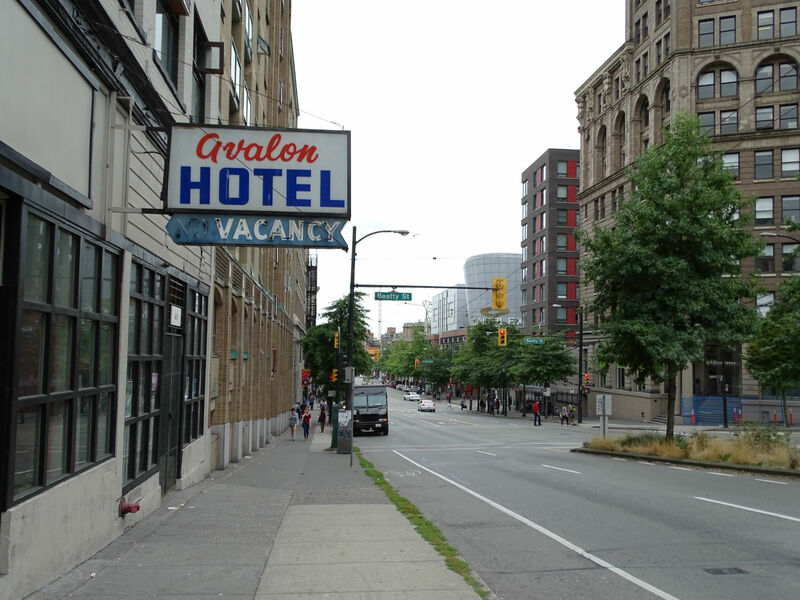 On our walk we notice that Vancouver is not really that nice, sometimes very dirty and a bit rundown. 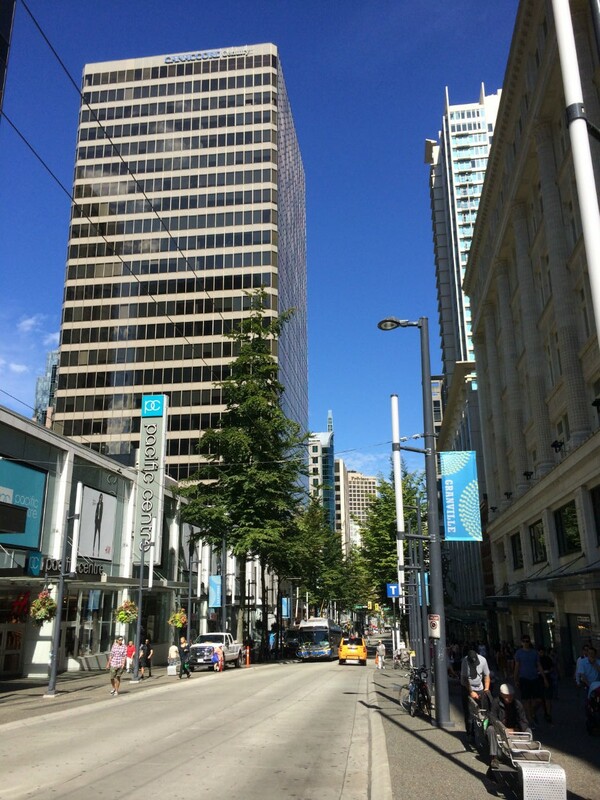 Also, I have not yet, in any other city, seen so many “strange” people. 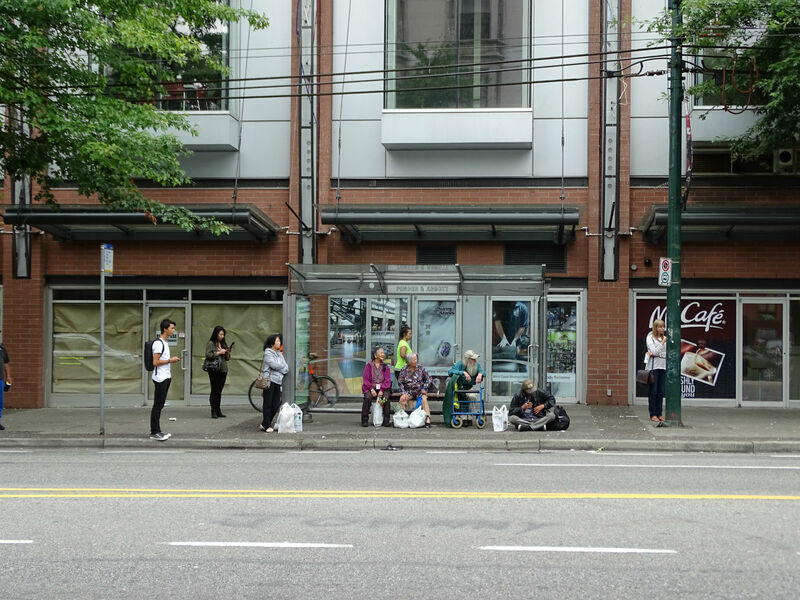 And the proportion of homeless and beggars is strikingly high. 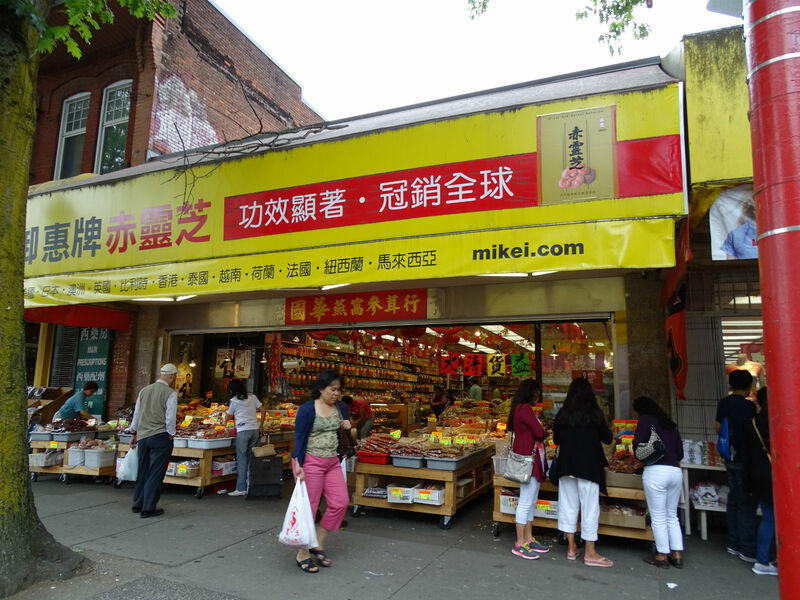 Unfortunately, this is no different in Chinatown. 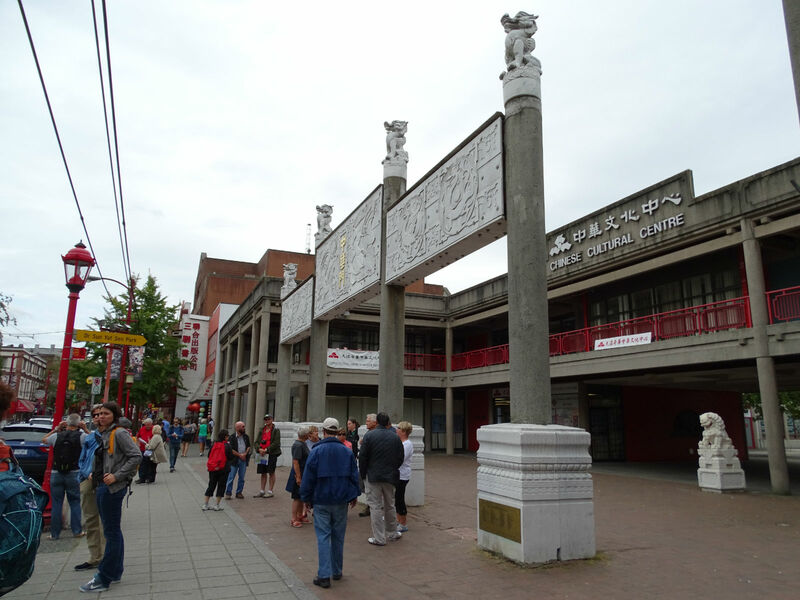 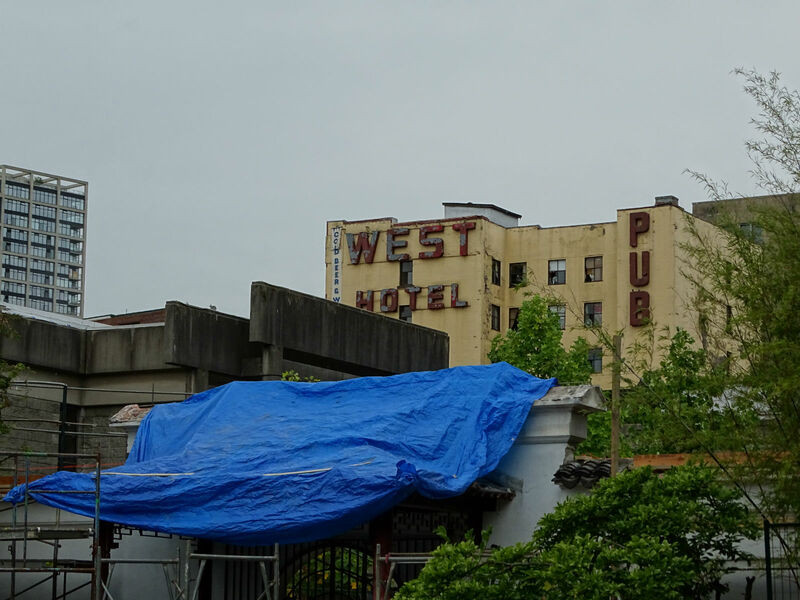 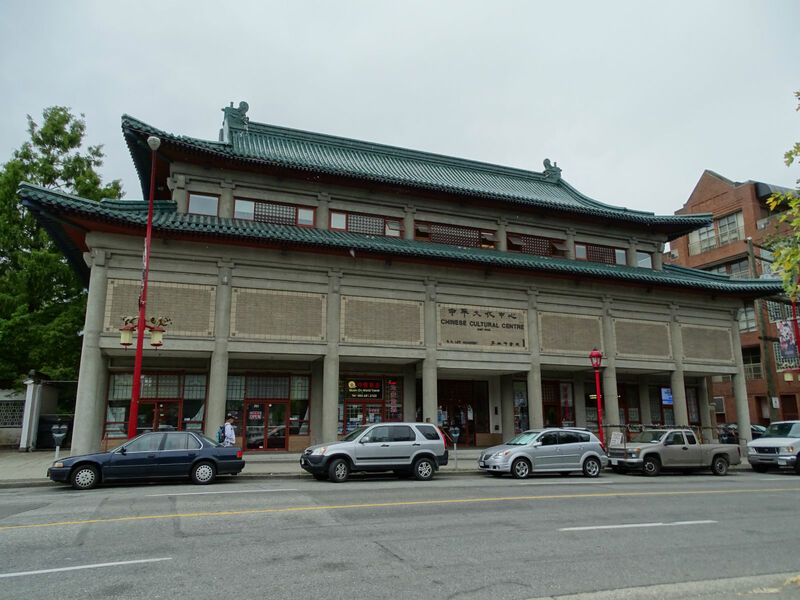 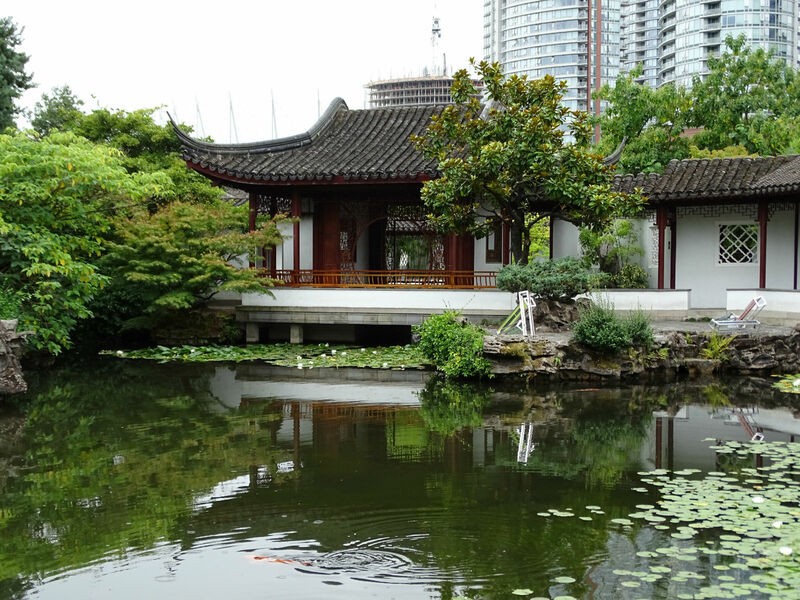 We make our round – also going through the Dr. Sun Yat-Sen Park – but the spark isn’t really lit. 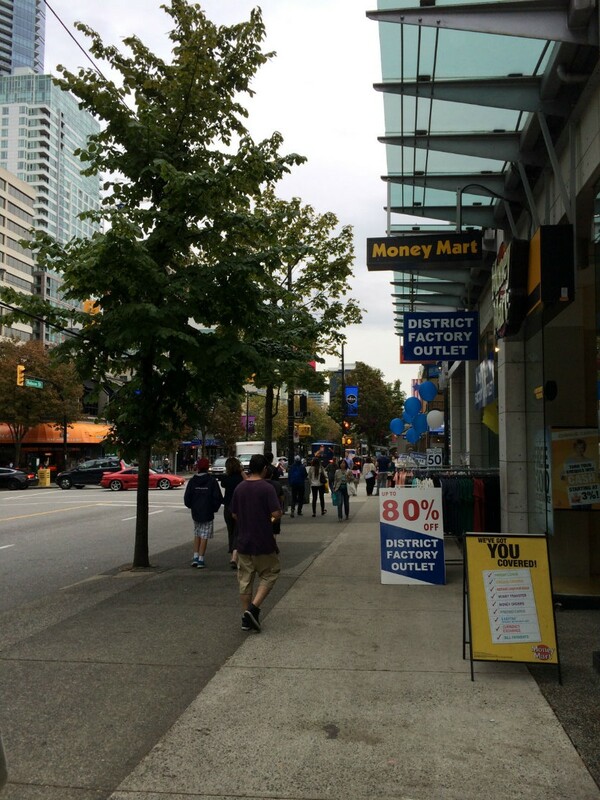 Boulevard Robson Street offers a welcome change, which we then follow to Stanley Park. 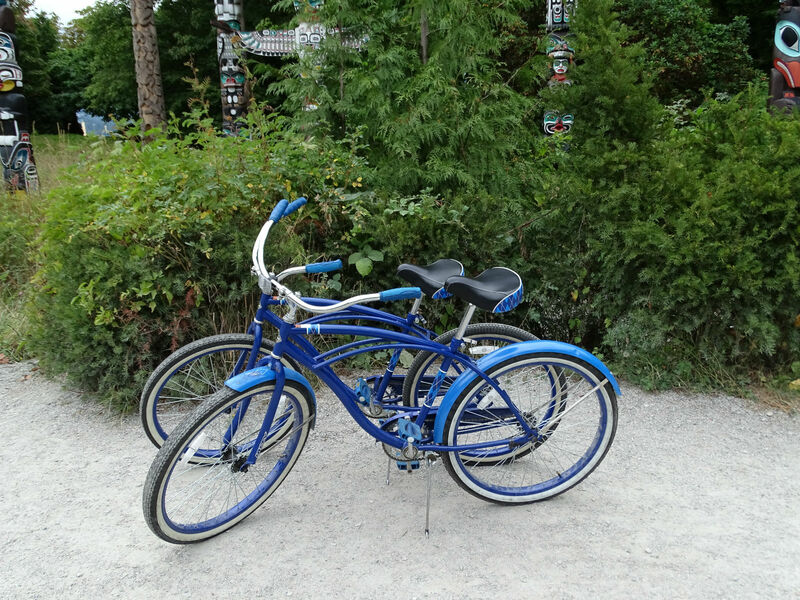 Just before the entrance to Stanley Park, we hire bicycles and start my, till now, highlight of our Vancouver stay. 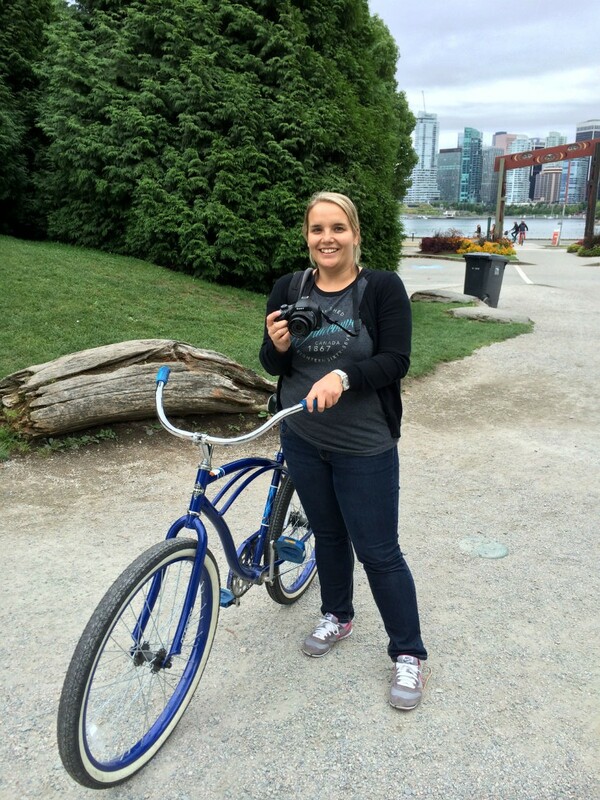 Biking in Stanley Park is an absolute must! 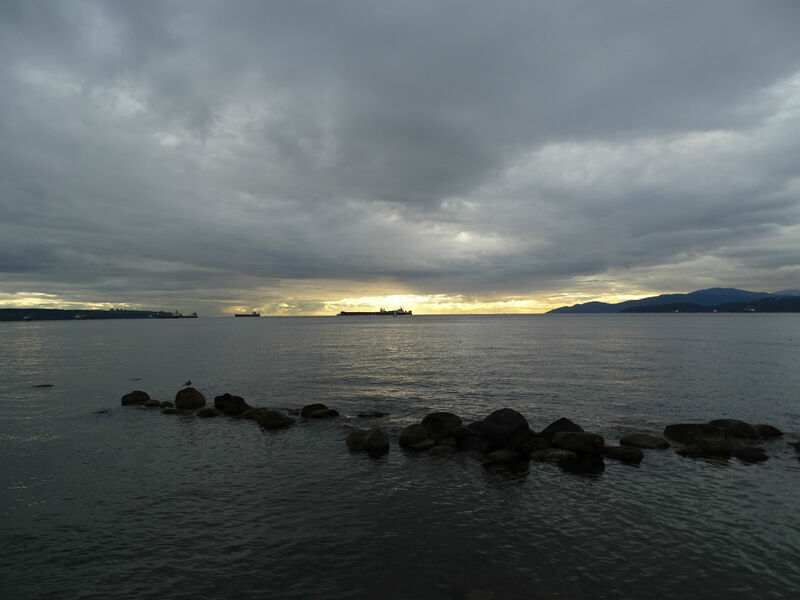 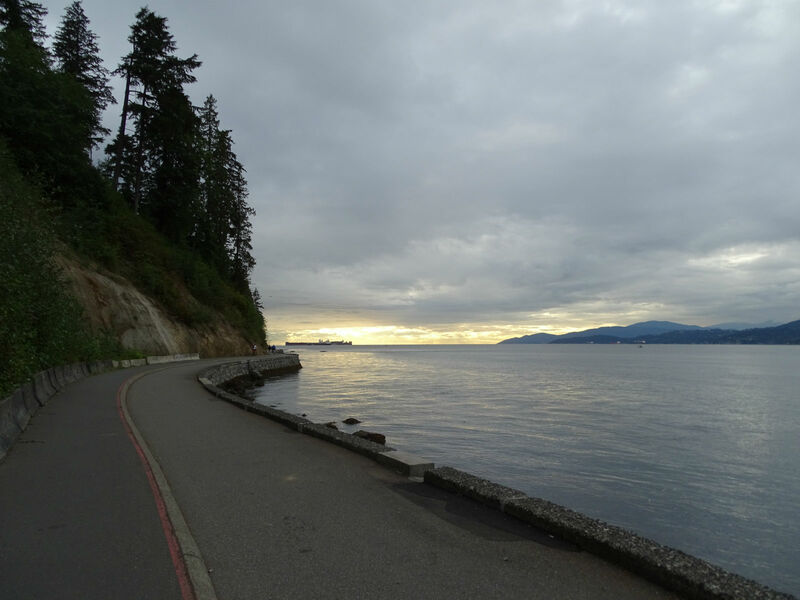 We drive all along Seawall Promenade to English Bay and need, with photo stops, about 2 hours. 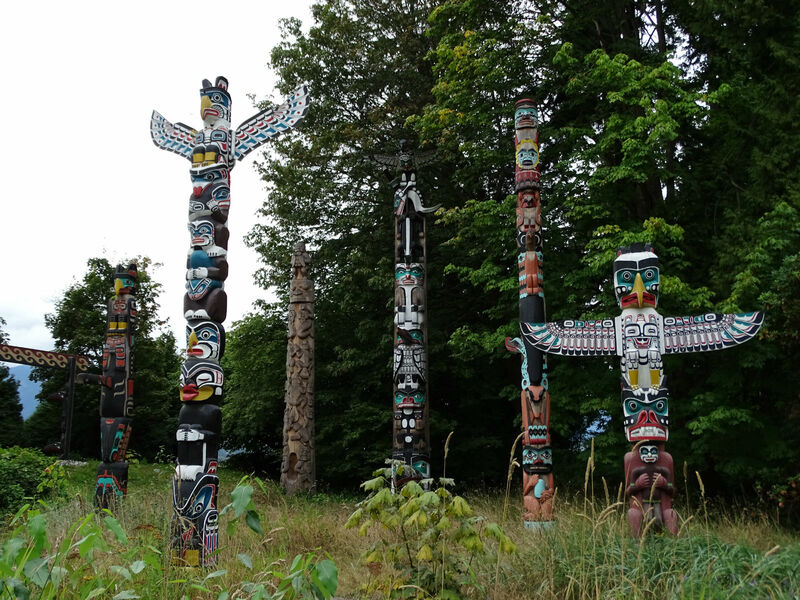 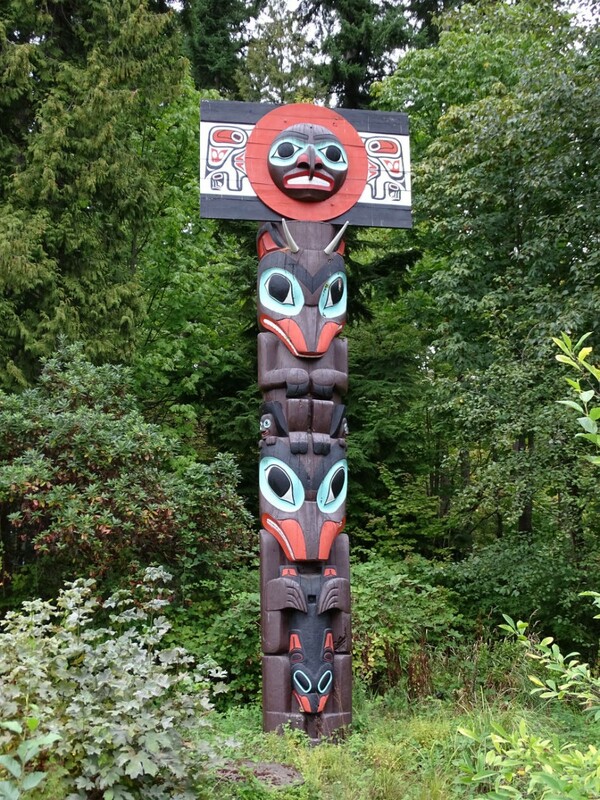 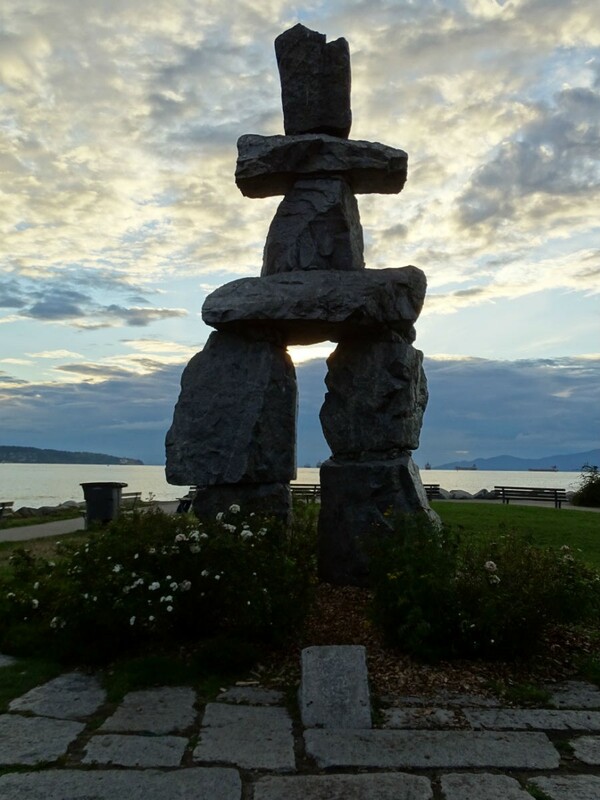 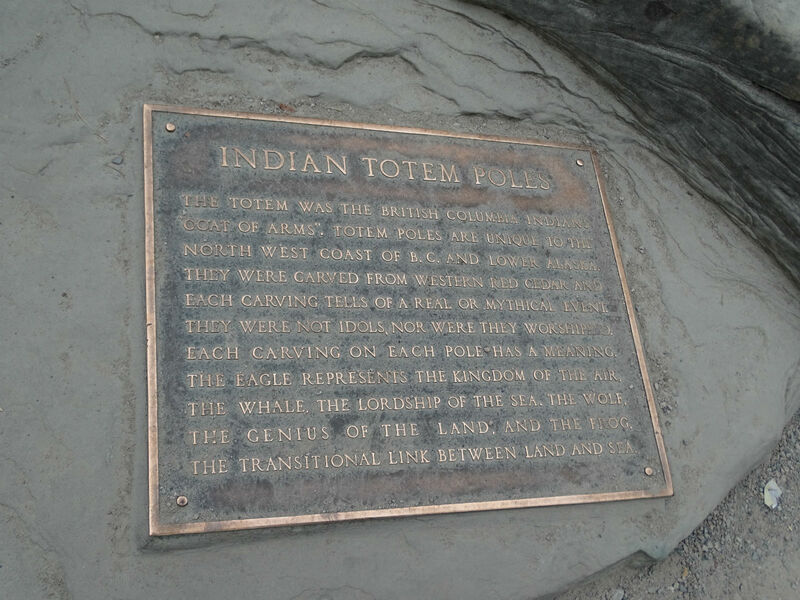 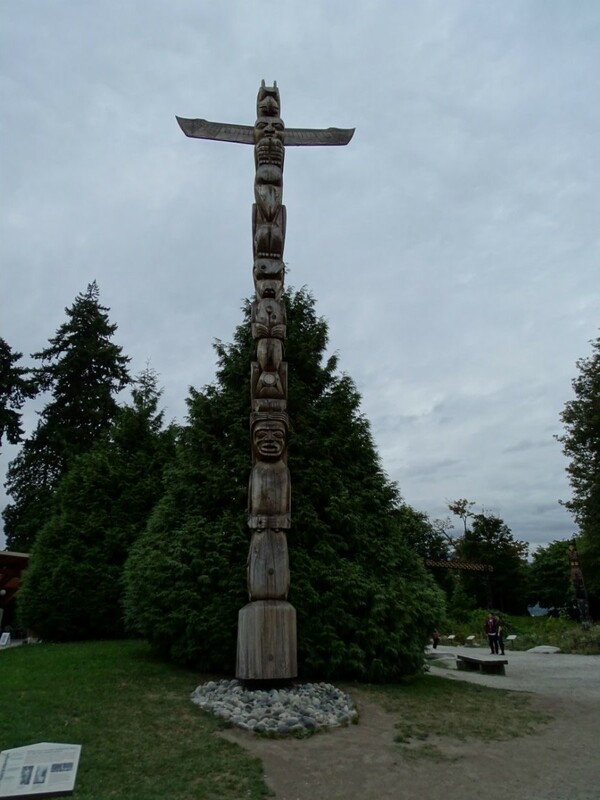 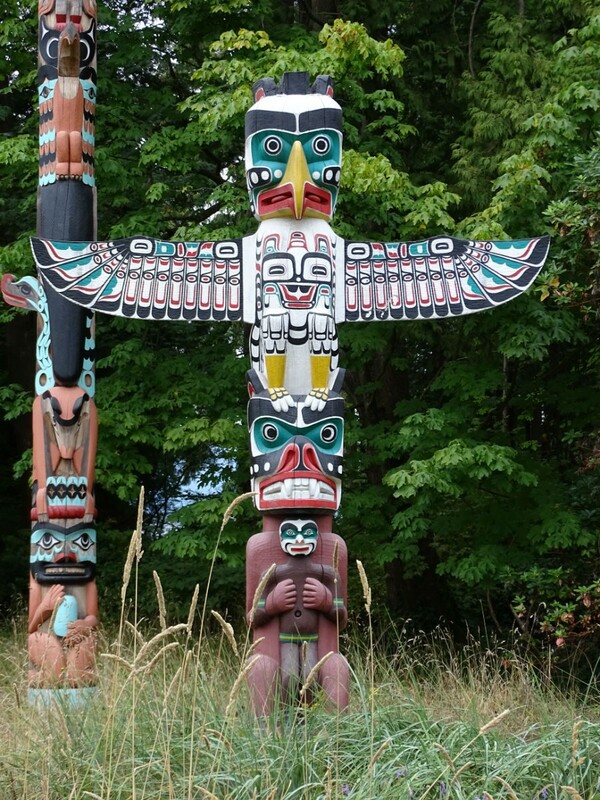 On the way we pass the totem poles and Lions Gate Bridge and enjoy the great views of the harbour, the city skyline and the beautiful nature. 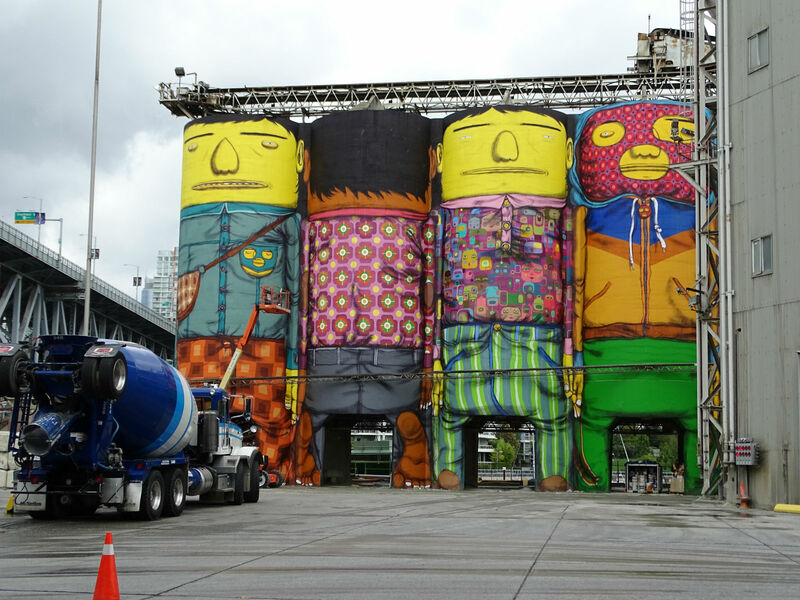 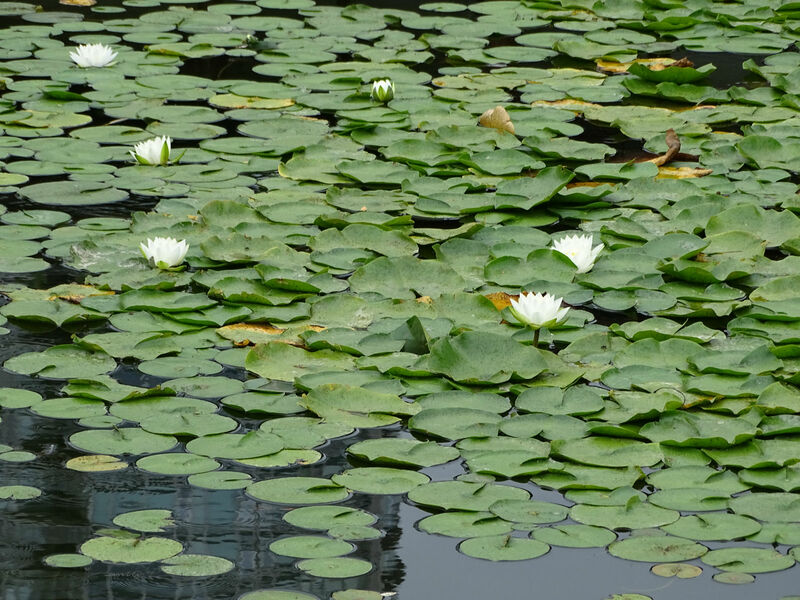 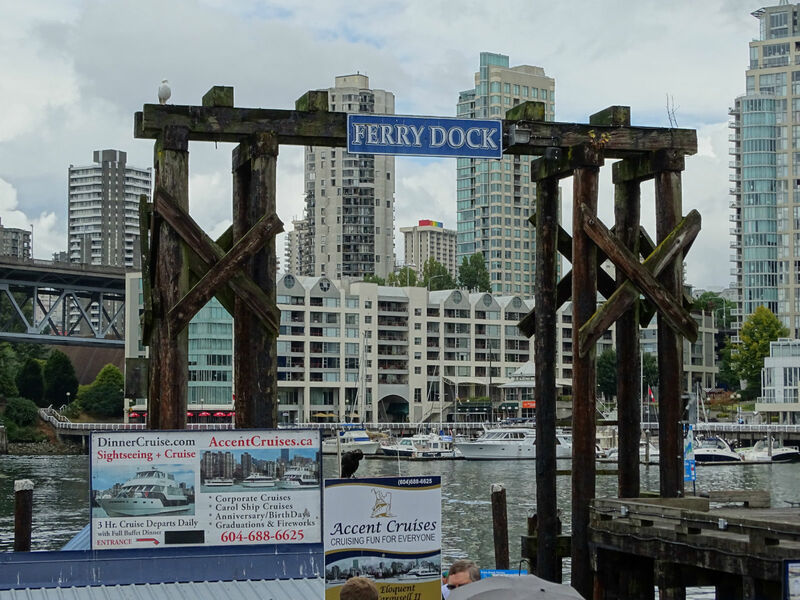 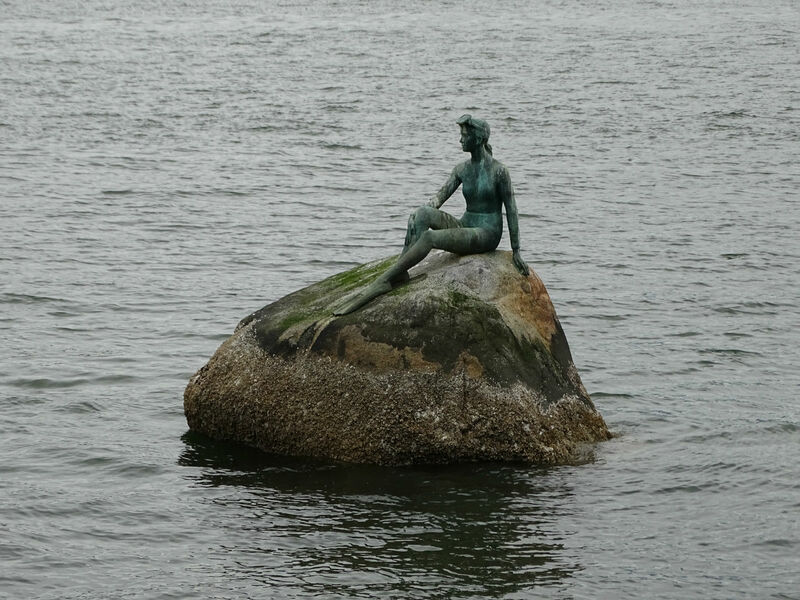 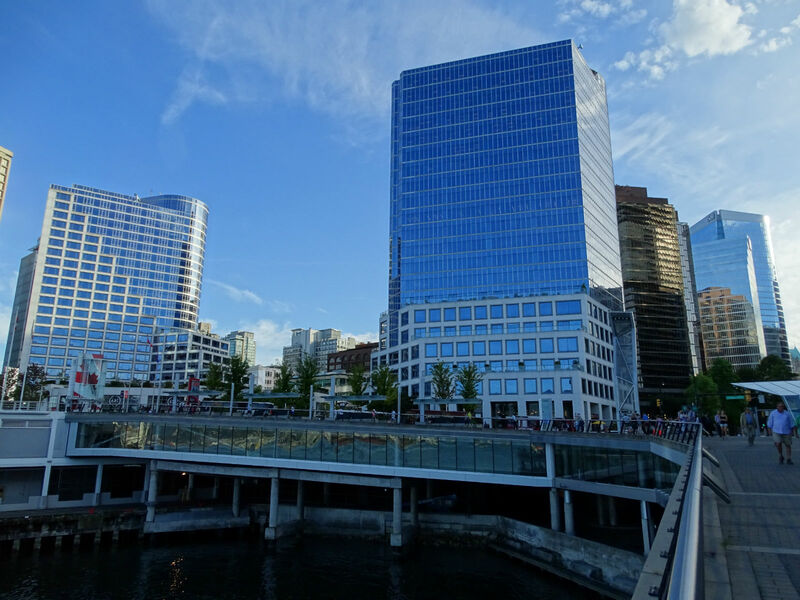 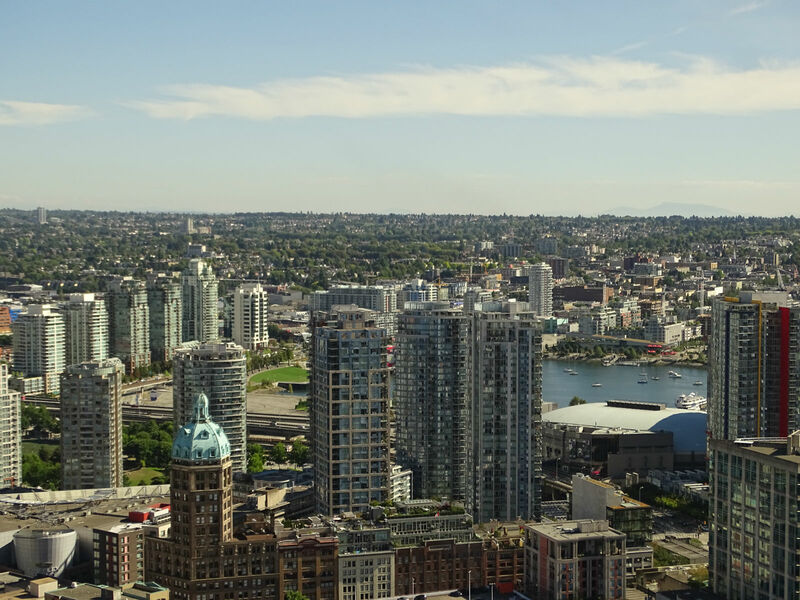 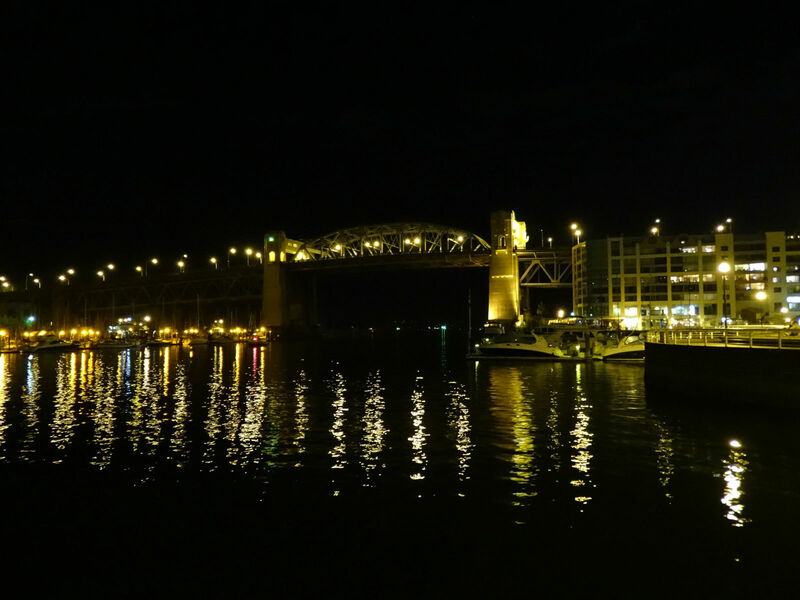 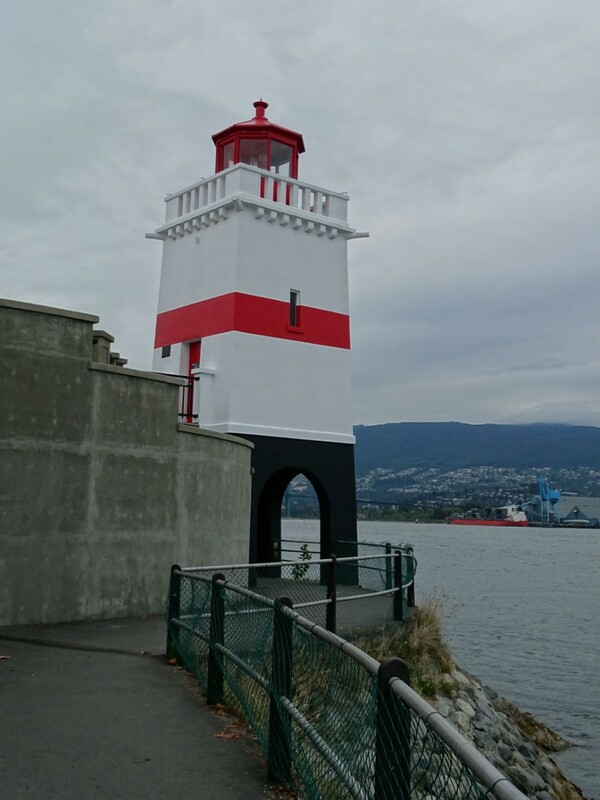 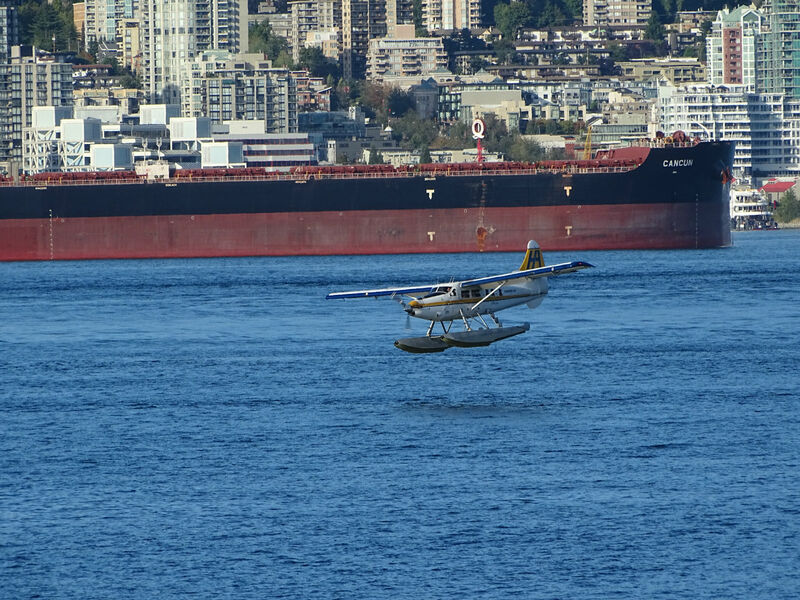 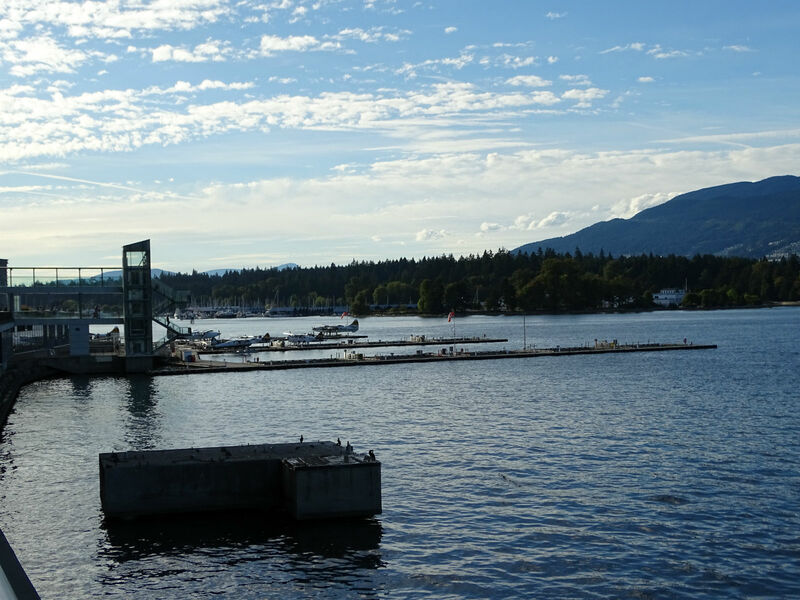 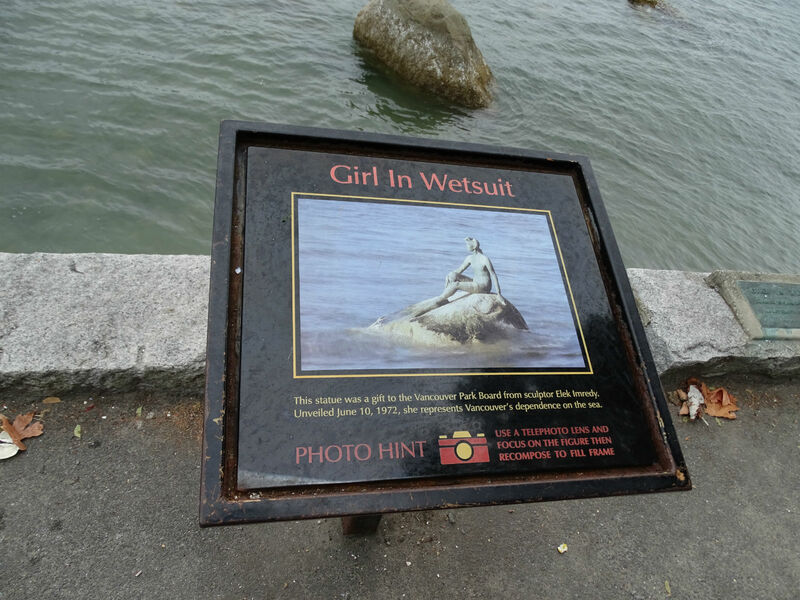 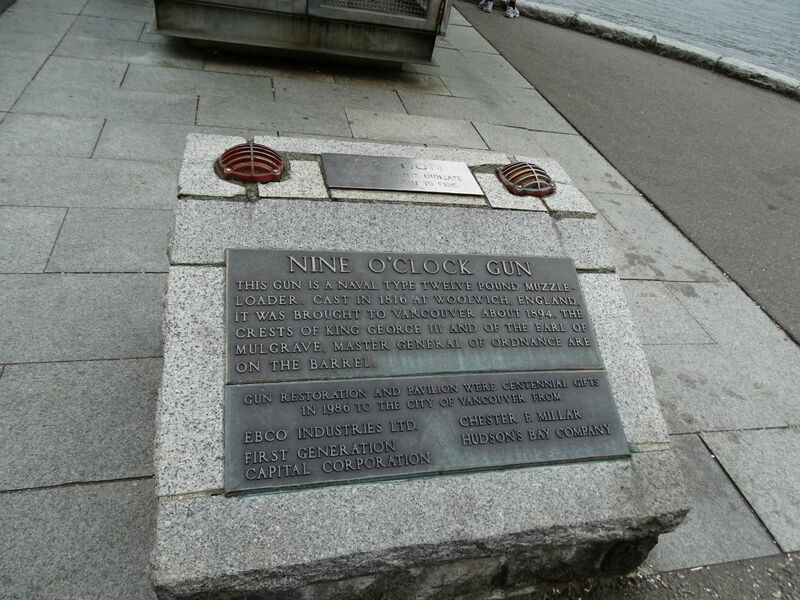 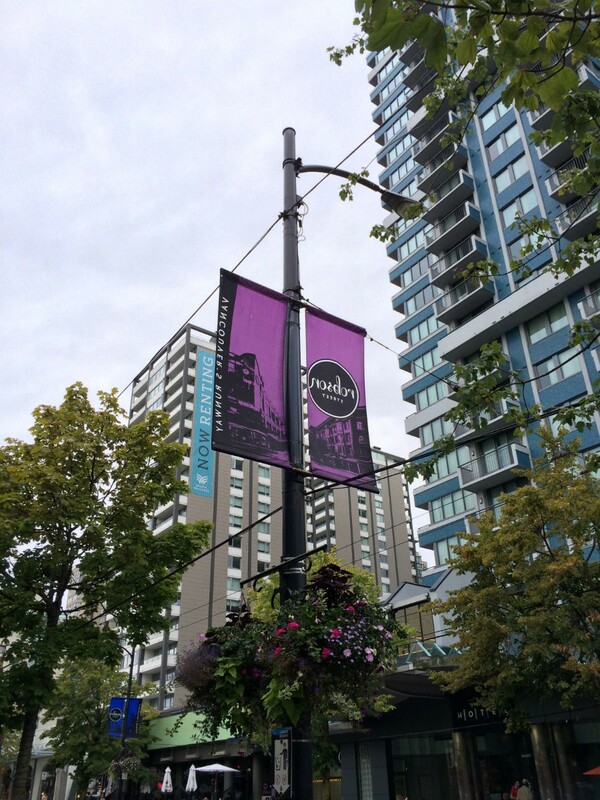 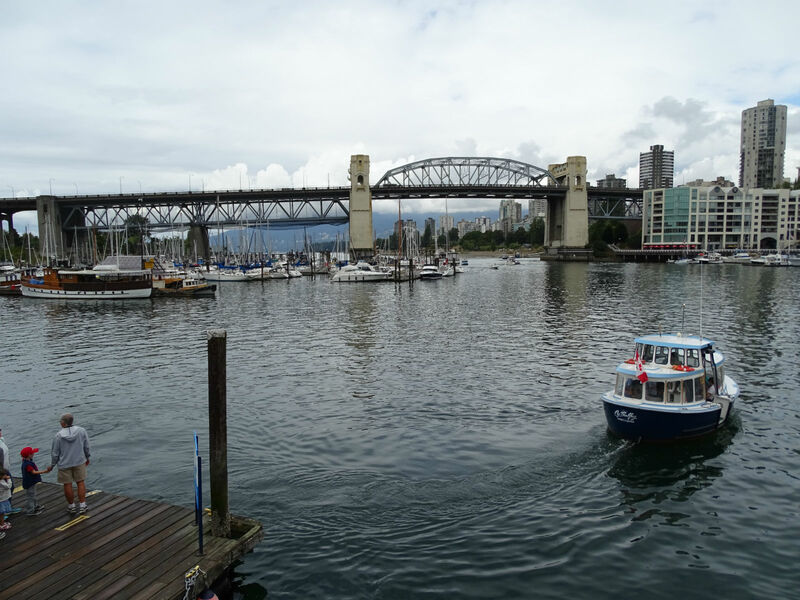 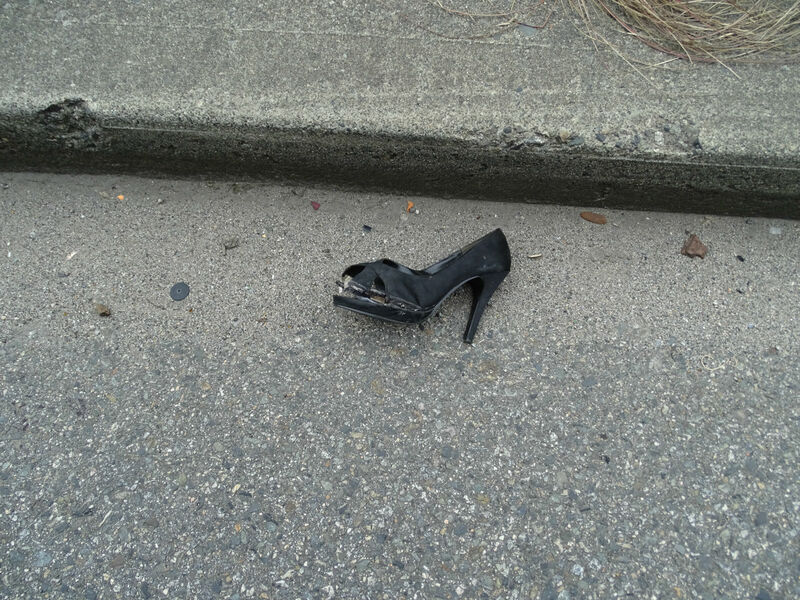 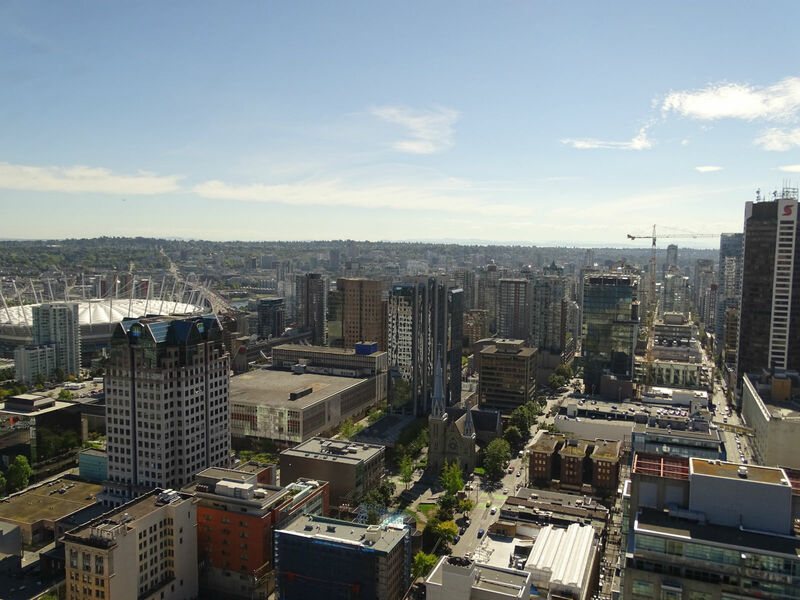 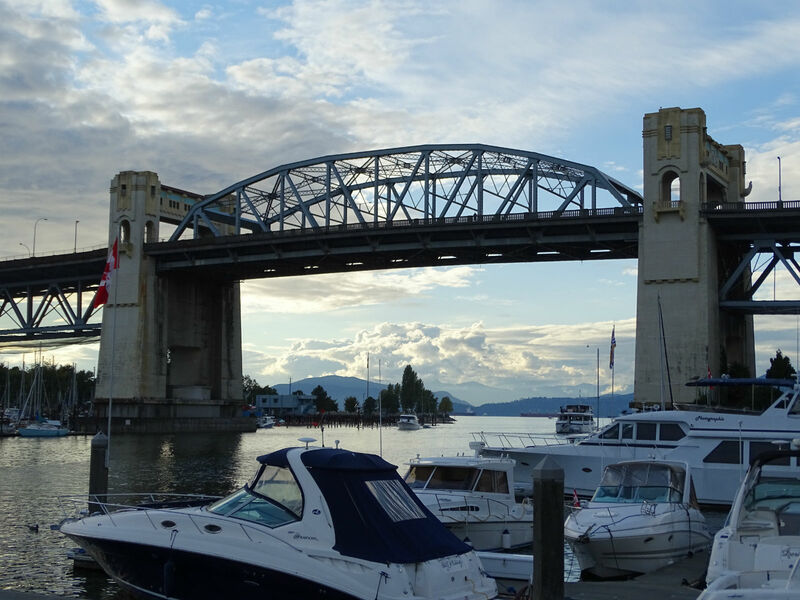 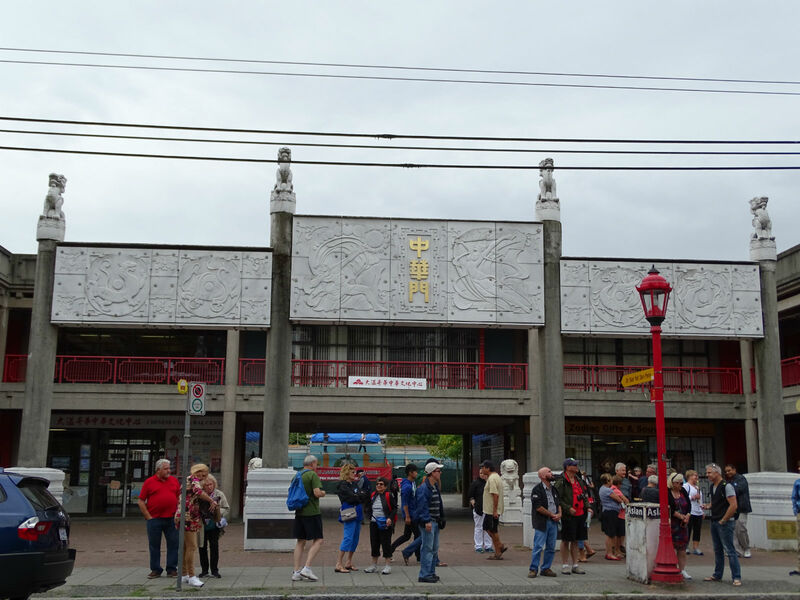 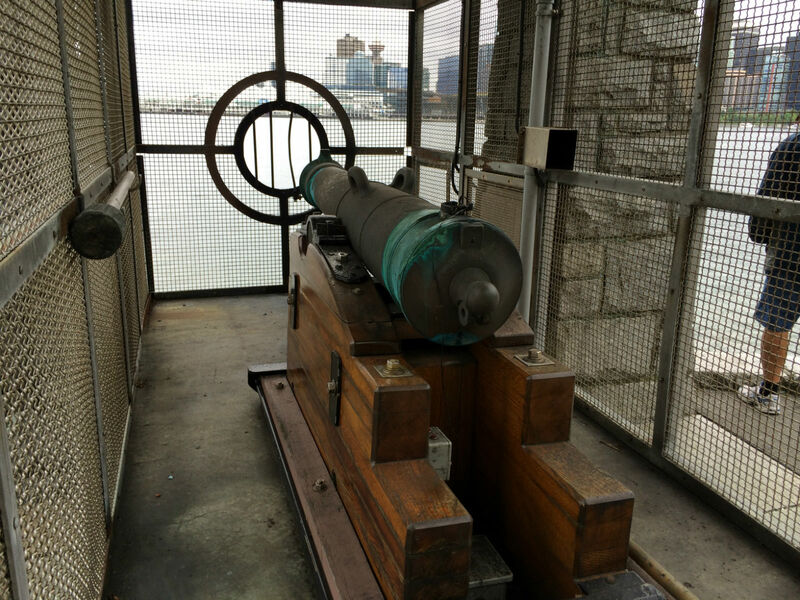 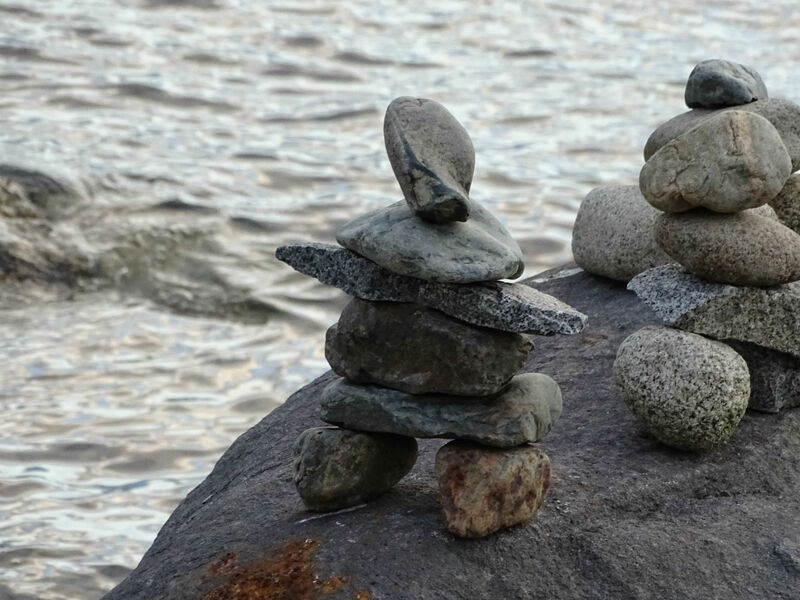 30 August, 2014 – Today we explore the area around the inlet, False Creek. 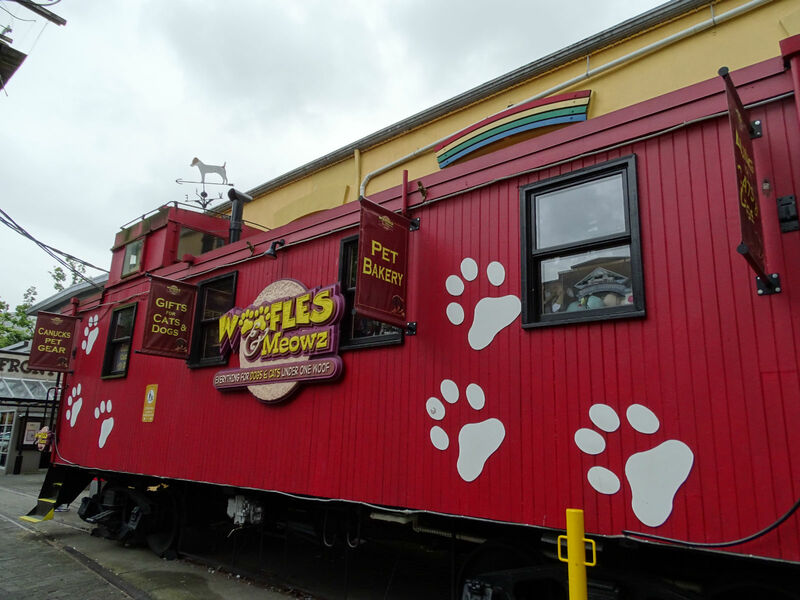 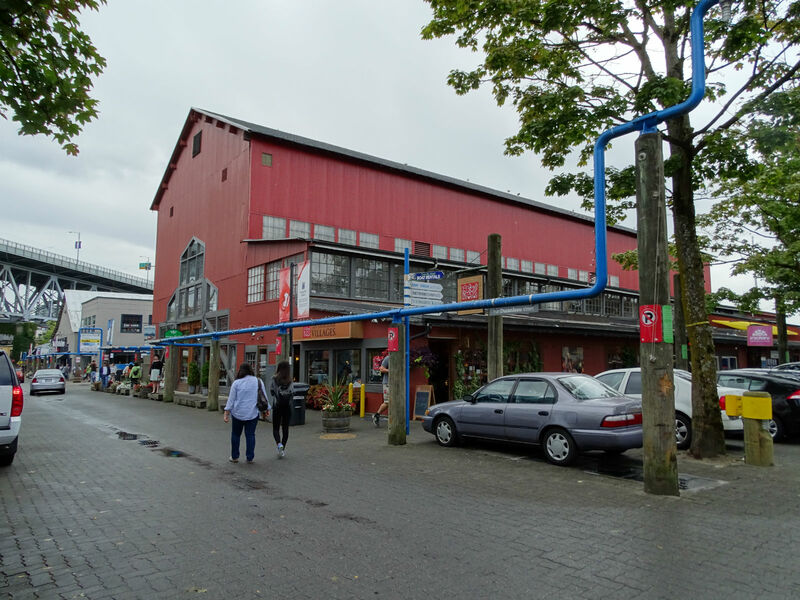 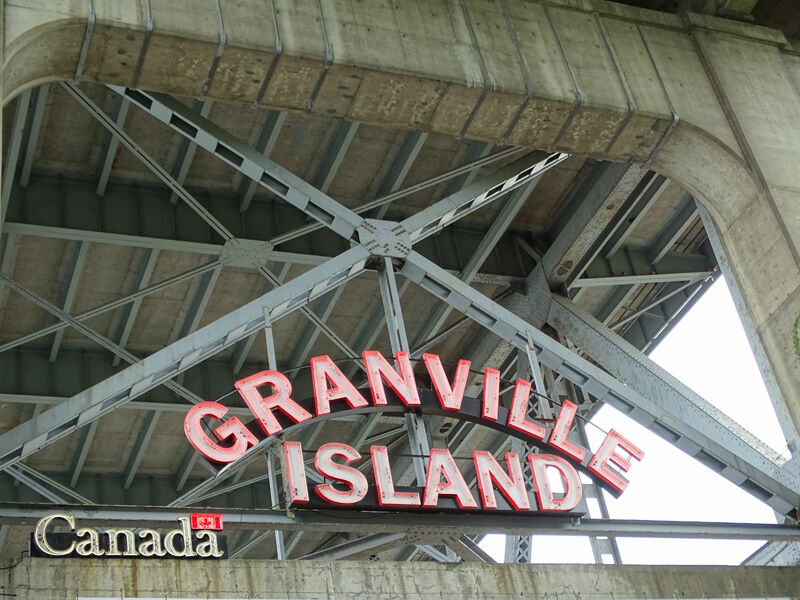 We buy, for $ 15 per person, a day pass for the Aquabus – a mini ferry – and sail to the peninsula of Granville Island. 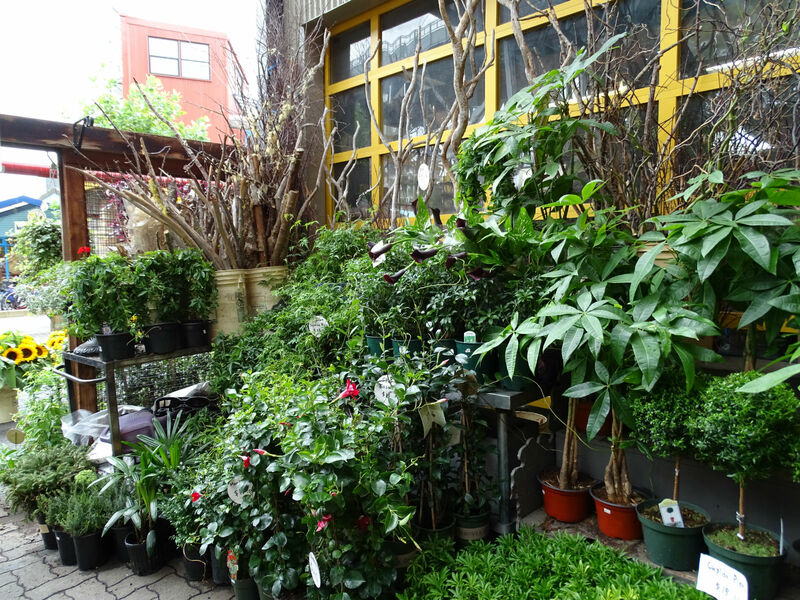 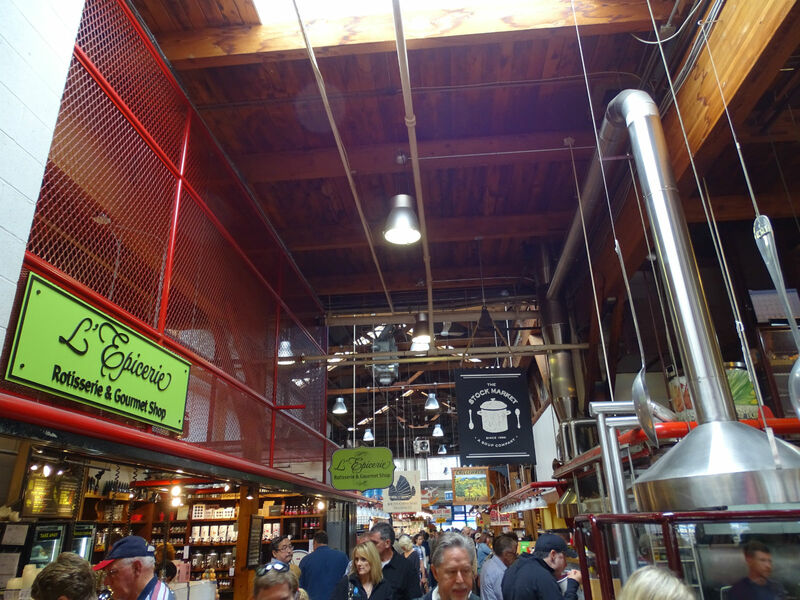 An old industrial site which has been restored and converted into a shopping, cultural and strolling area. 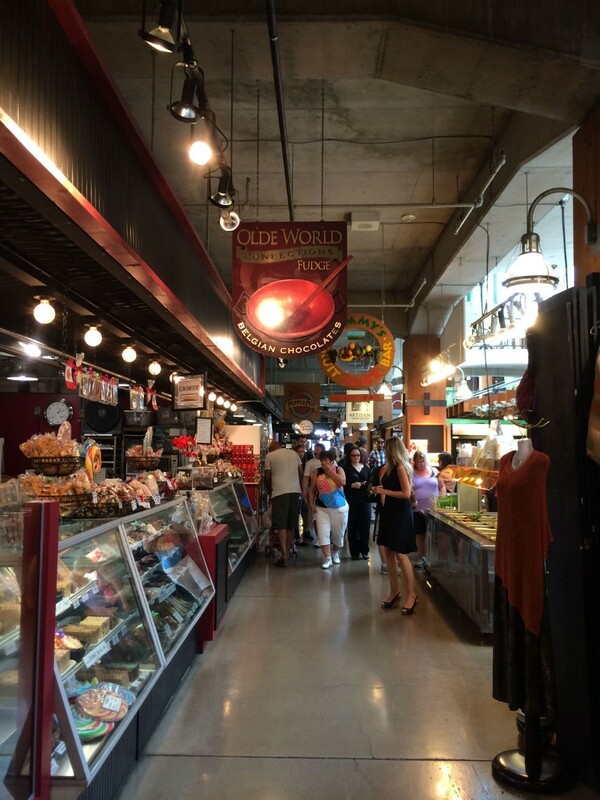 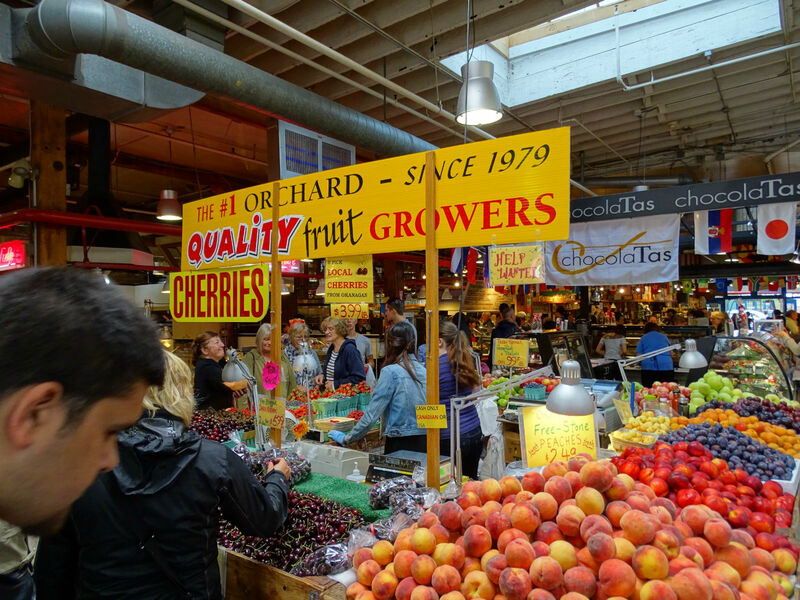 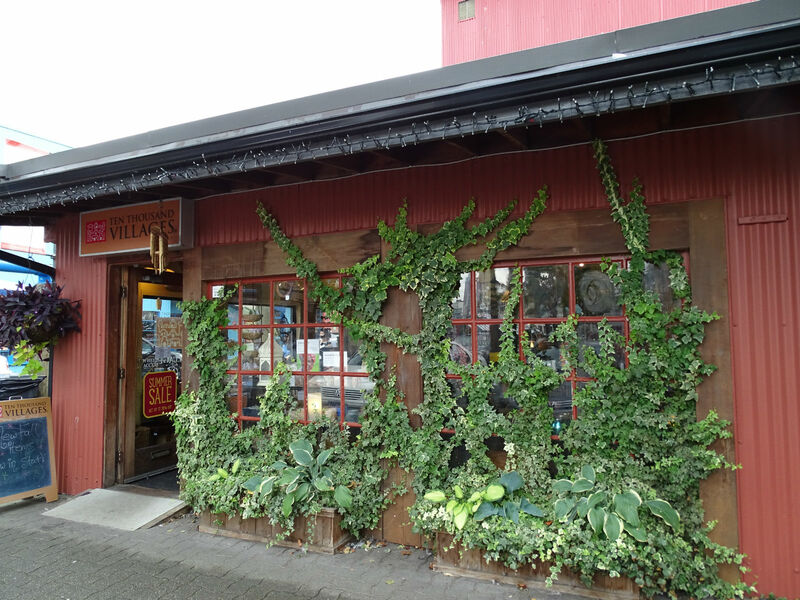 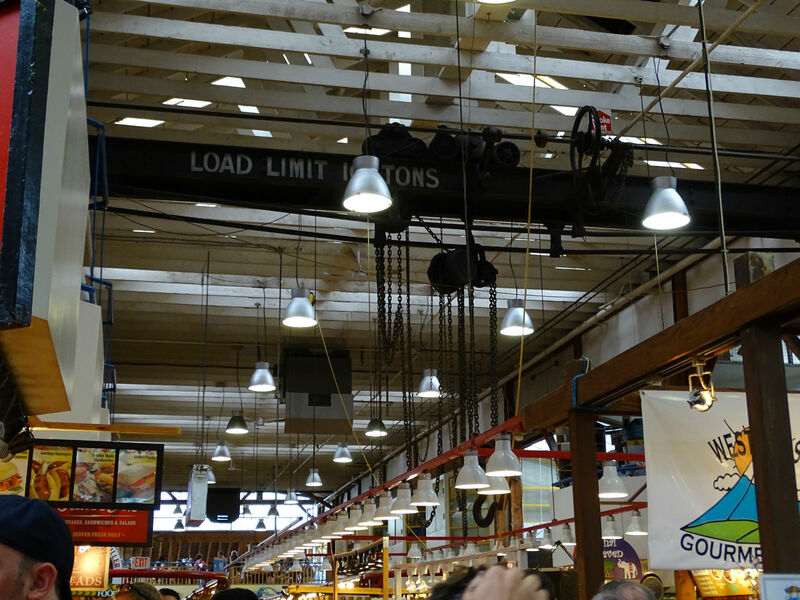 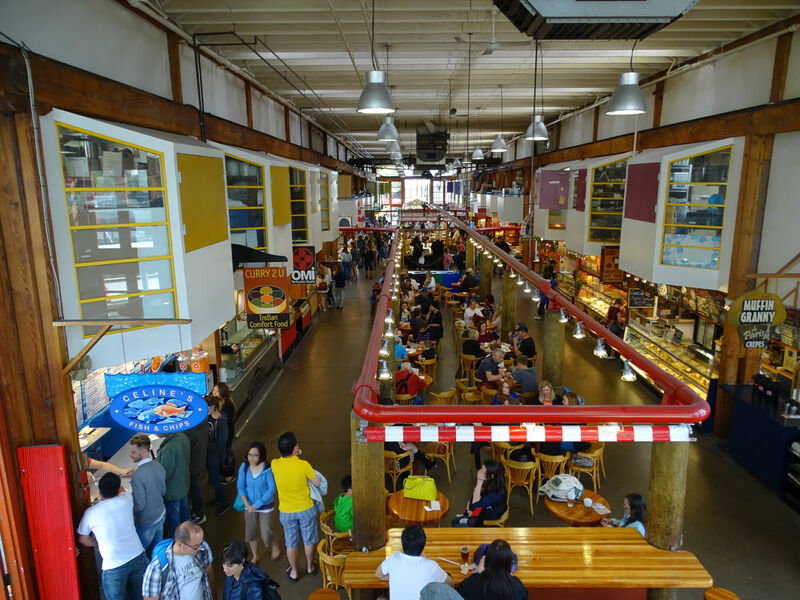 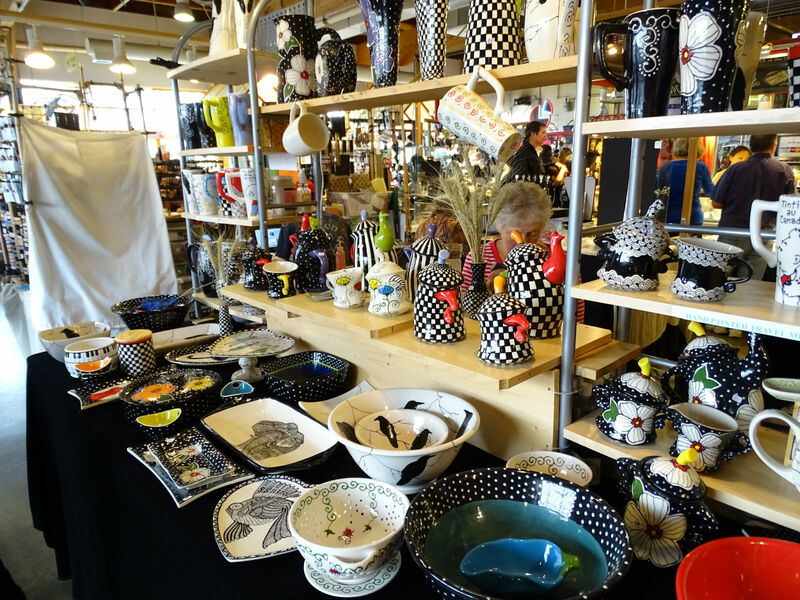 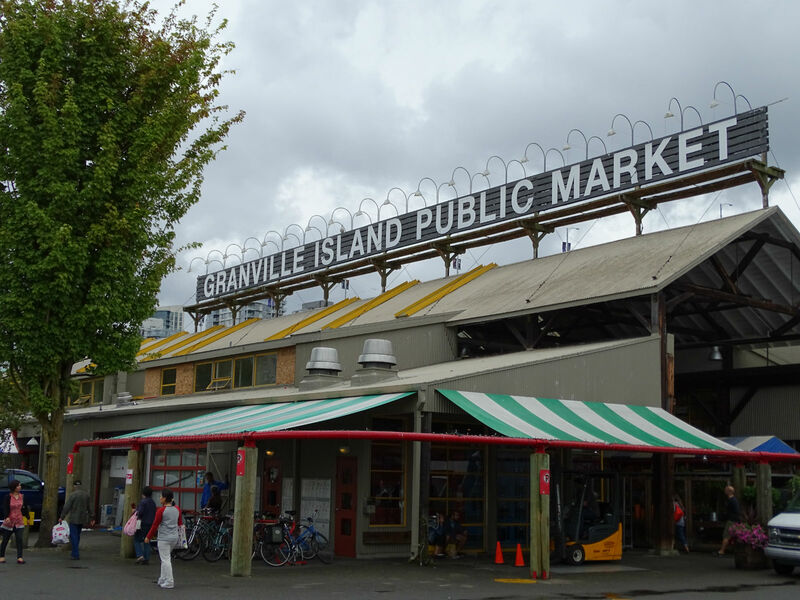 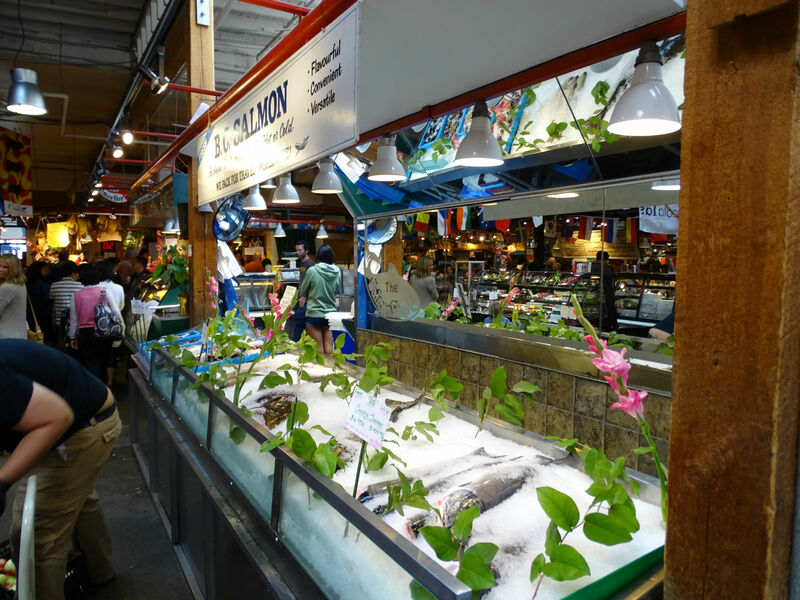 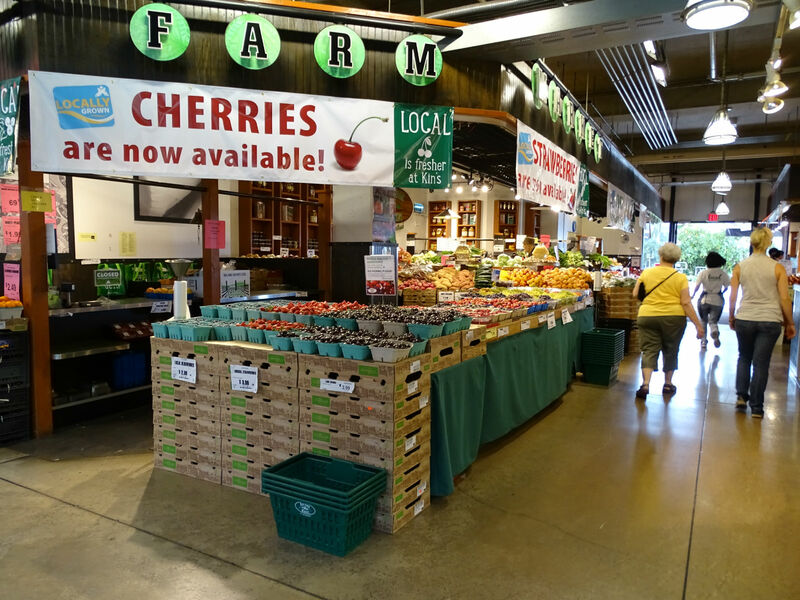 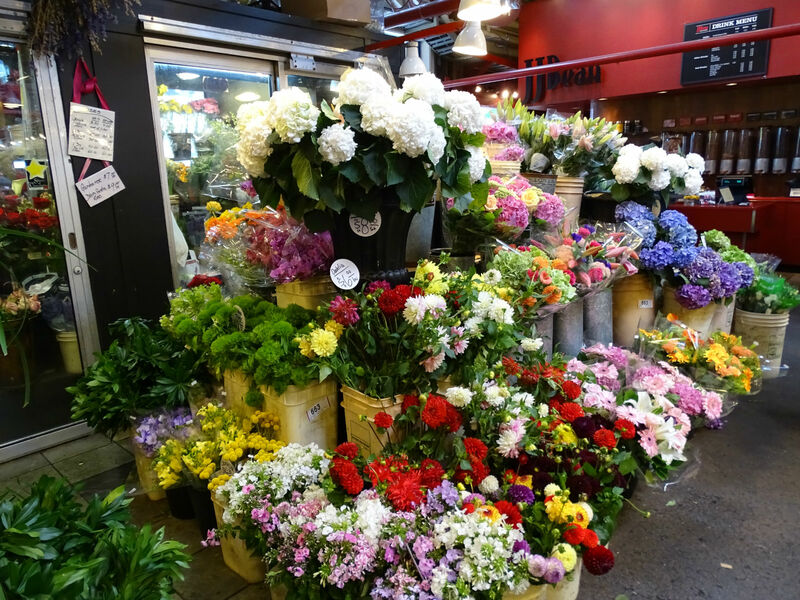 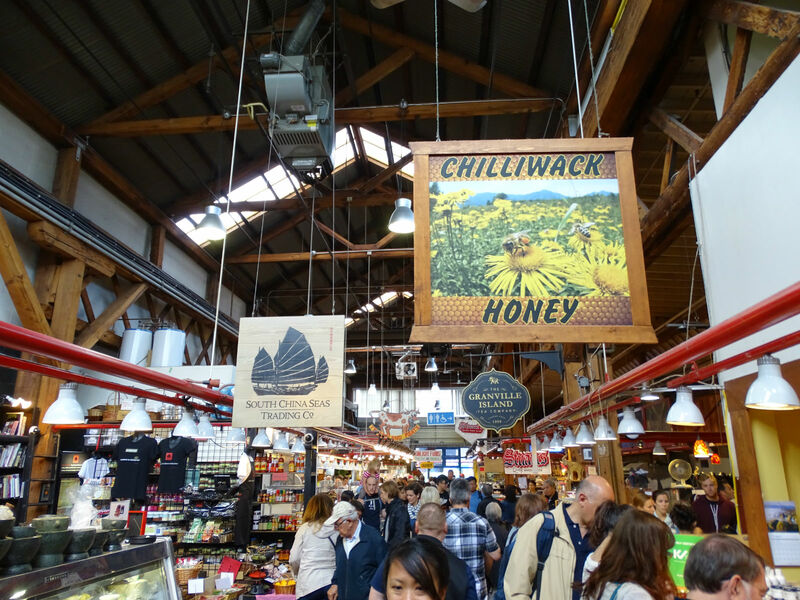 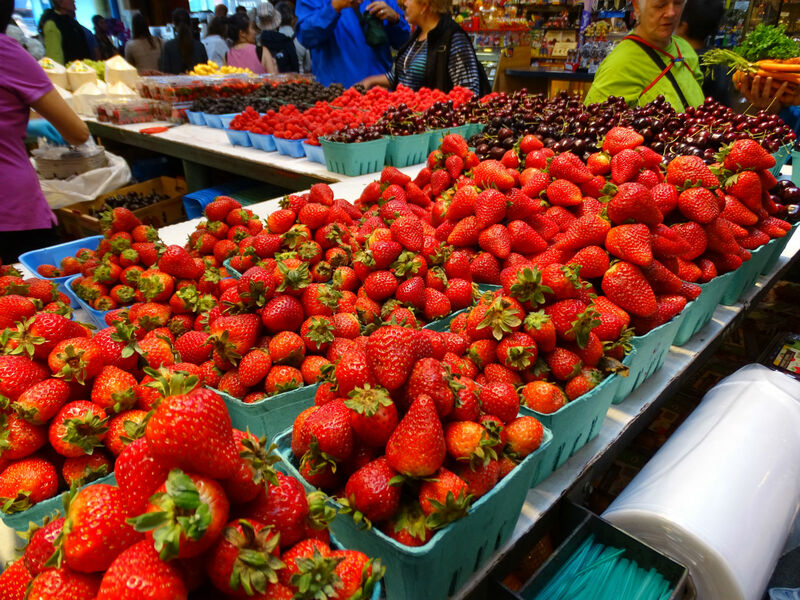 The Granville Island Public Market must not be missed on a Vancouver-visit! 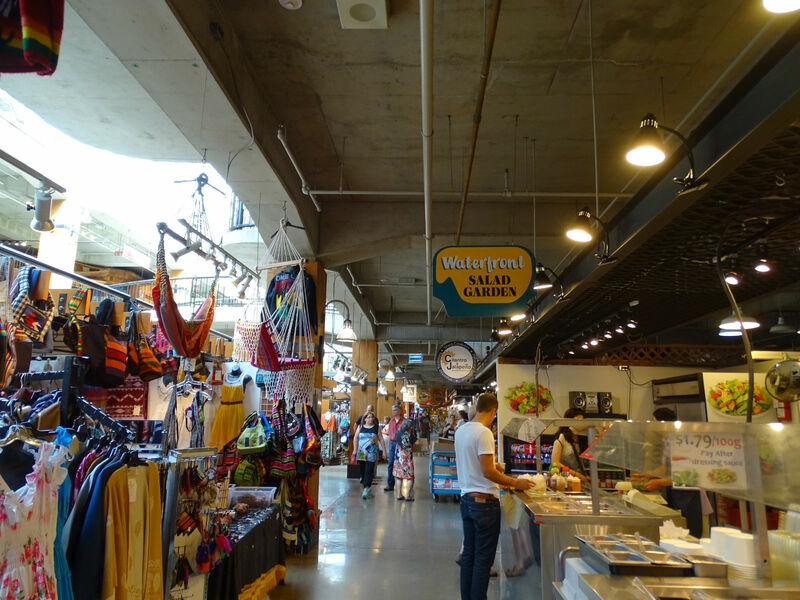 Afterwards we still wander through the remaining area, in which, in old warehouses are housed, among others, restaurants, shops and galleries. 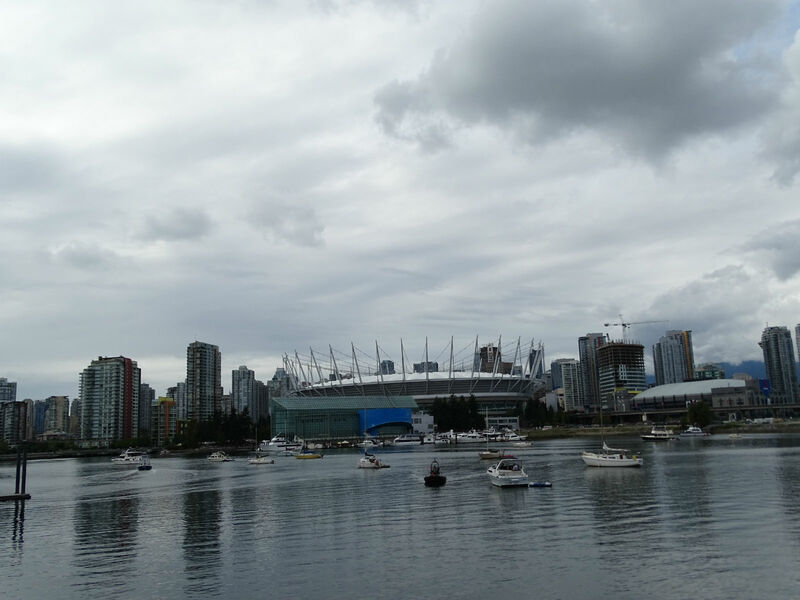 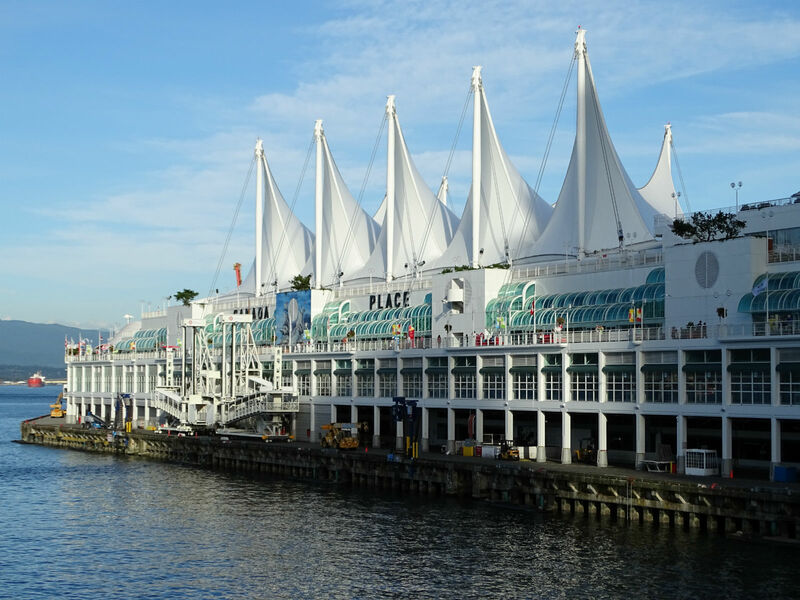 Then we take the Aquabus on to BC Place Stadium, getting out there is only really worth it if you want to take a tour of the stadium or want to visit the casino. 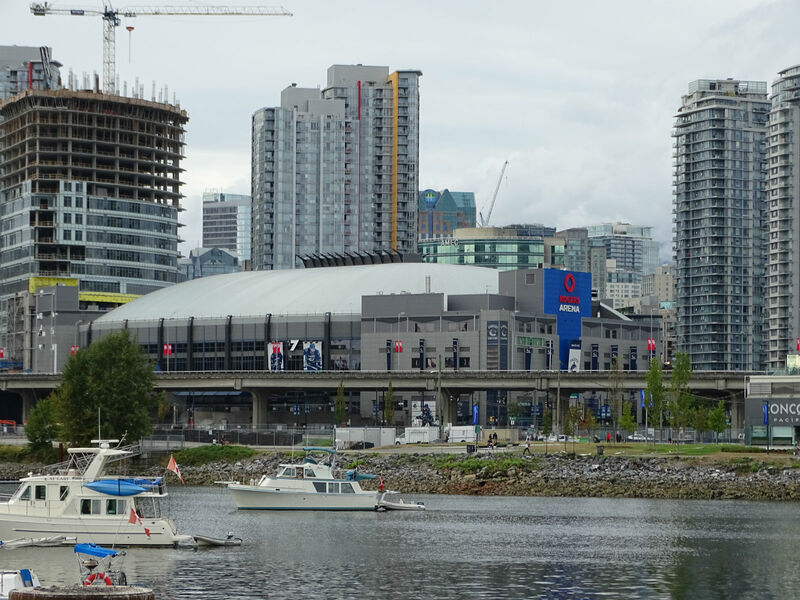 Otherwise, the place is pretty dead, which is why we immediately continue with the next boat to BC Place. 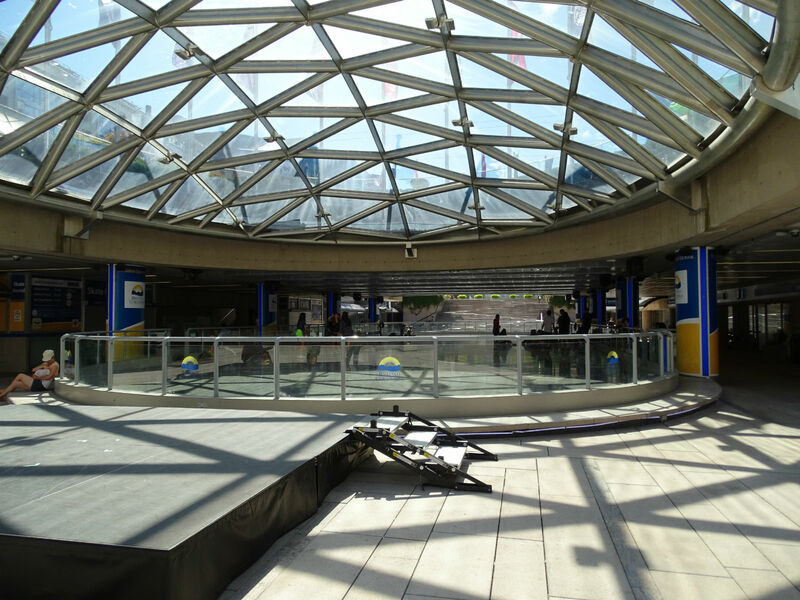 Even this place, also developed as part of the Expo of 1986, is unfortunately not very busy. 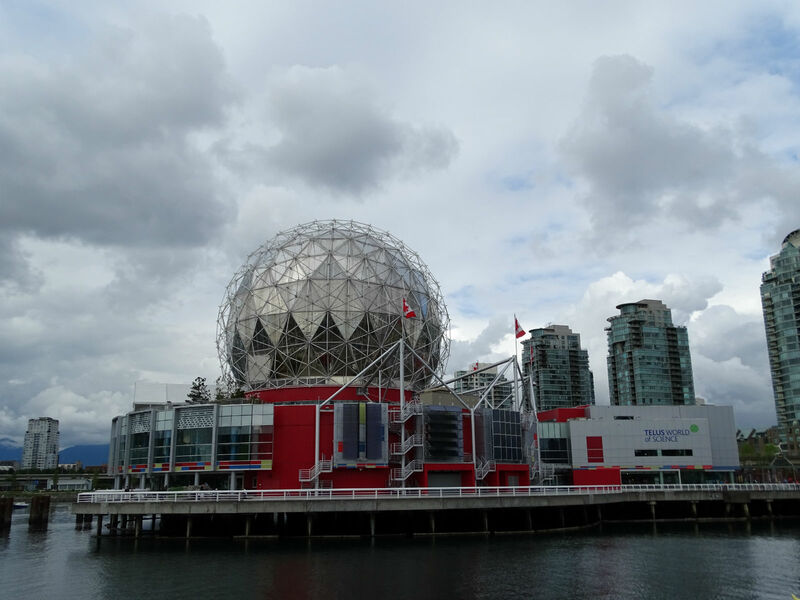 There is the TELUS World of Science Museum, which certainly offers loads of fun for children, but nice waterfront cafes are non-existent. 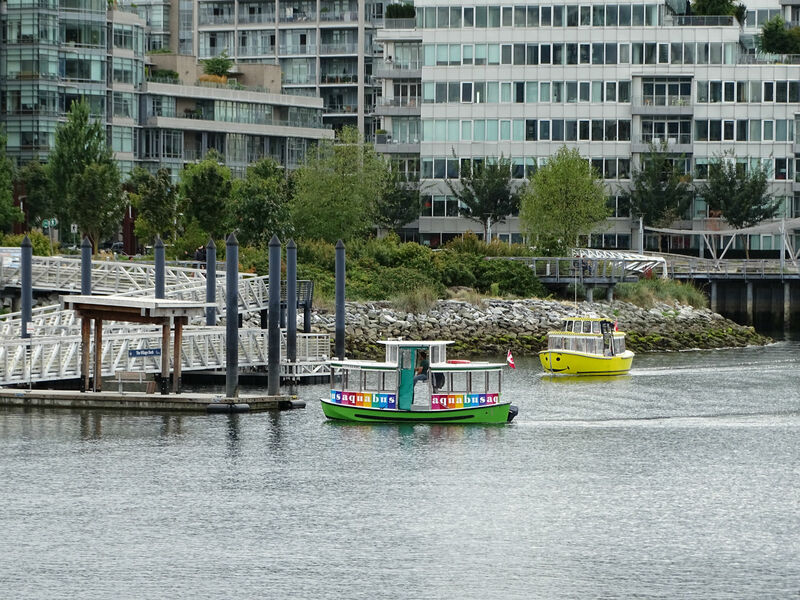 Only in “The Village”, are there some restaurants, but unfortunately, without a False Creek view. 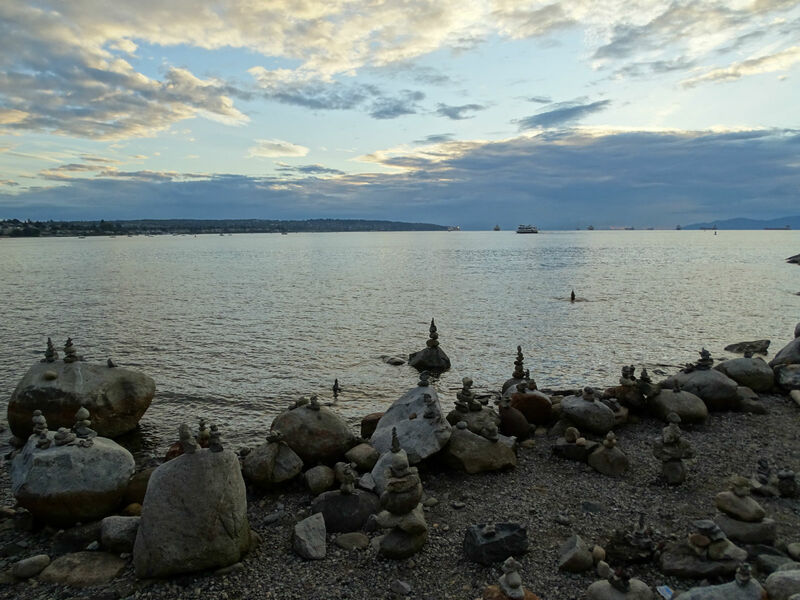 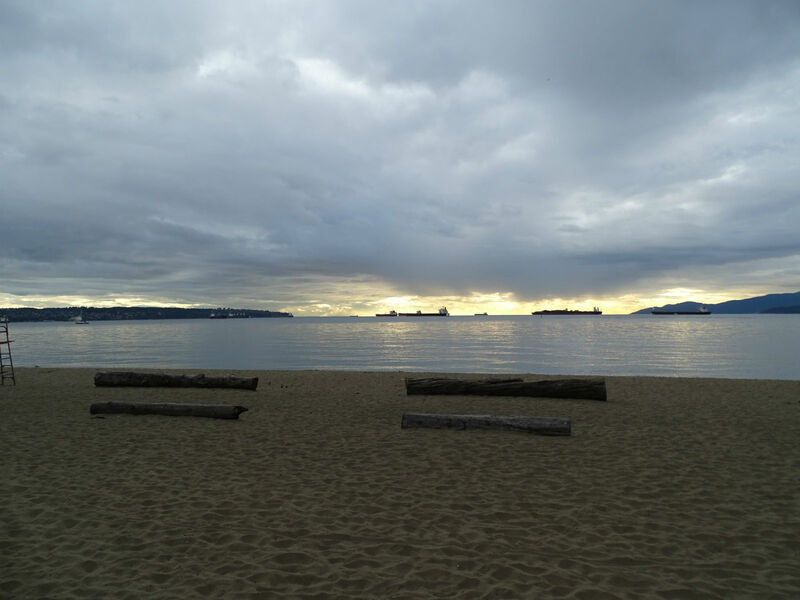 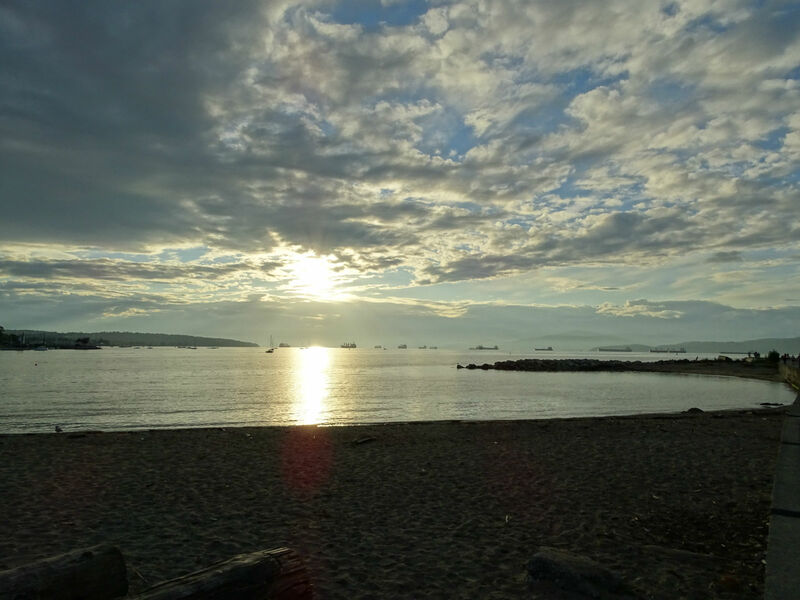 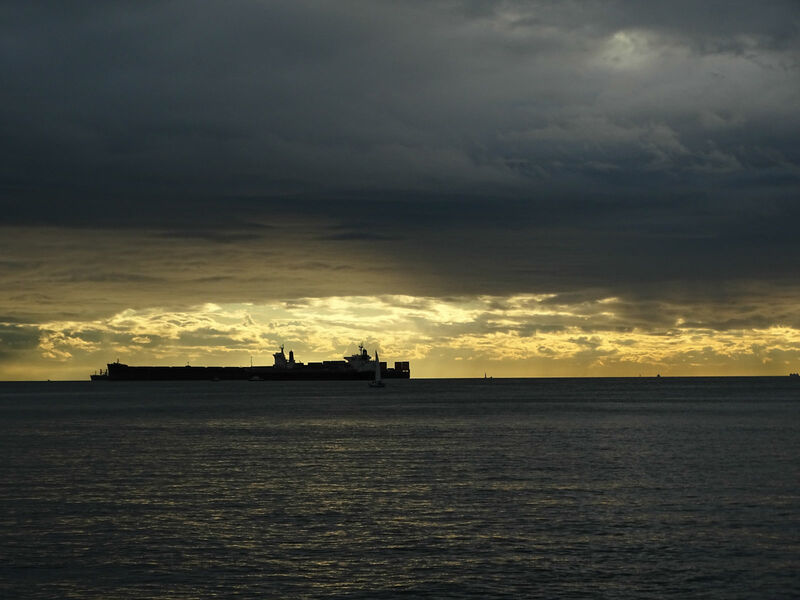 At sunset, we then still walk along English Bay. 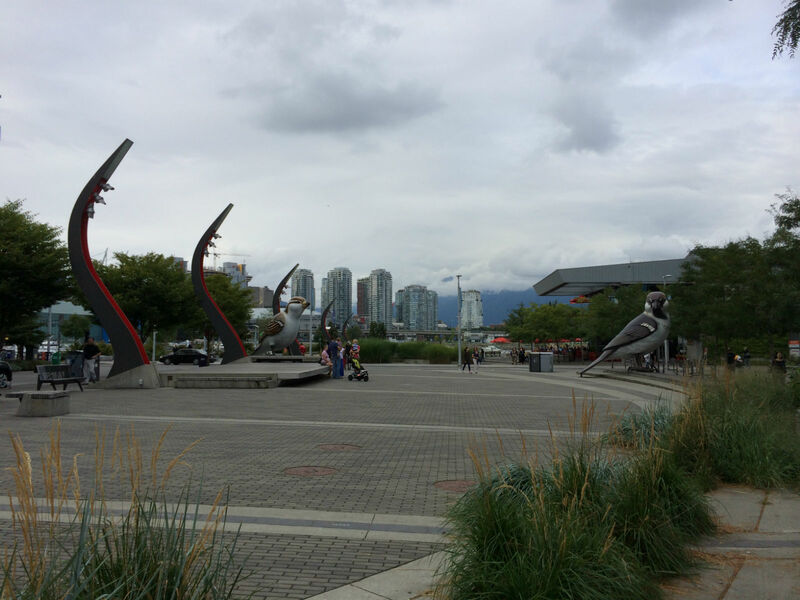 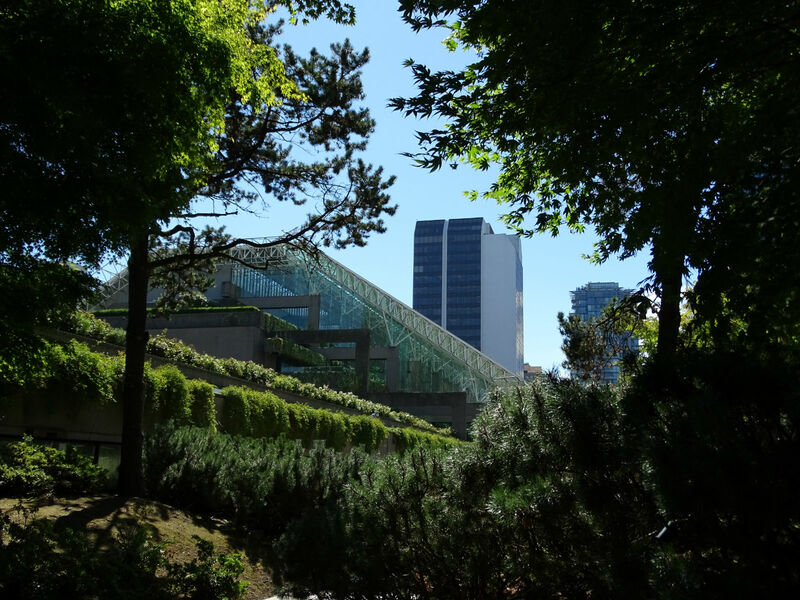 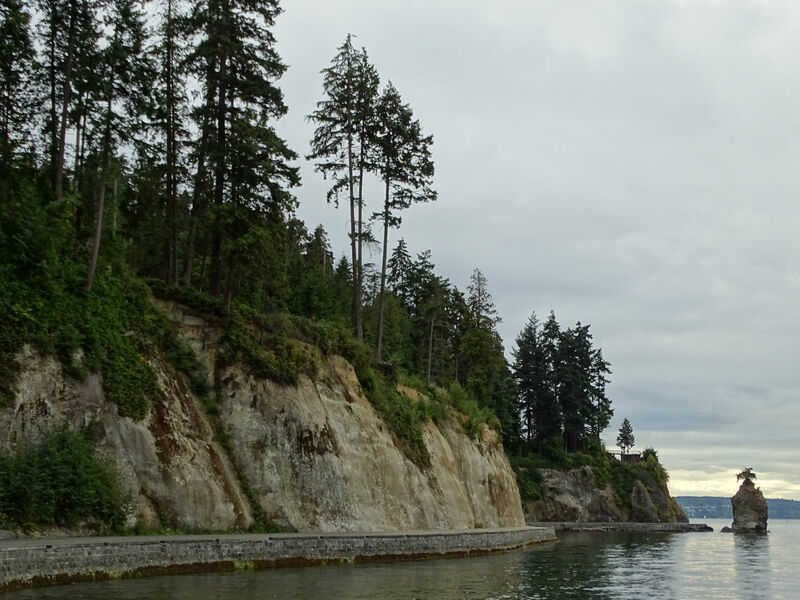 31 August, 2014 – On our last full day in Vancouver we go, once again, into nature. 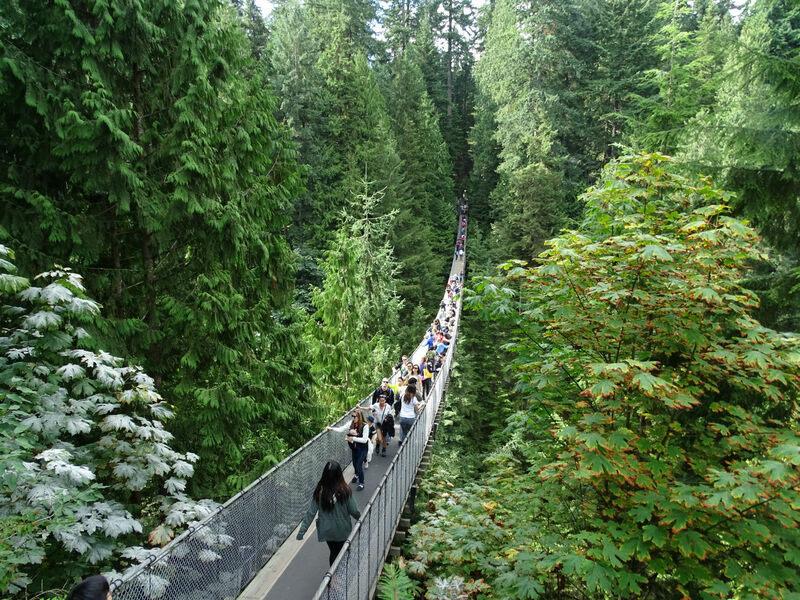 Namely to, Capilano Suspension Bridge, a 70-meter-high and 137-meter-long suspension bridge taut over the Capilano River. 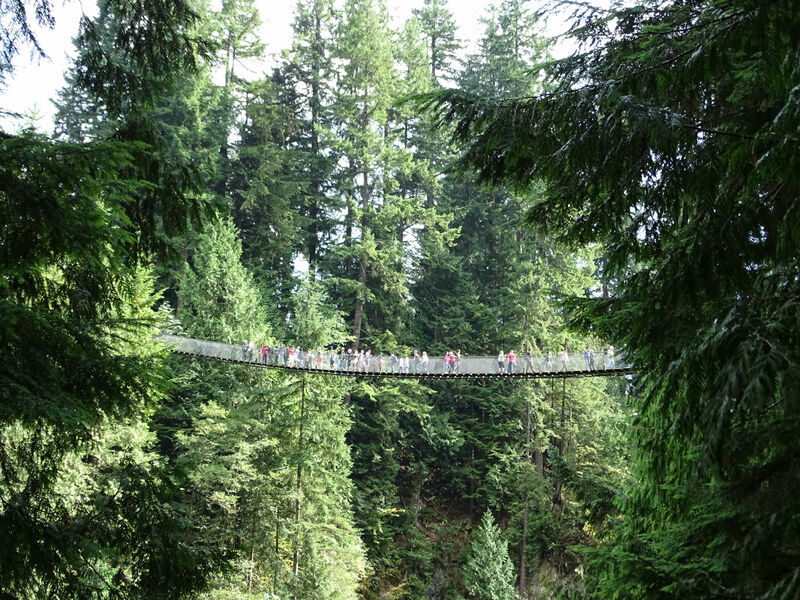 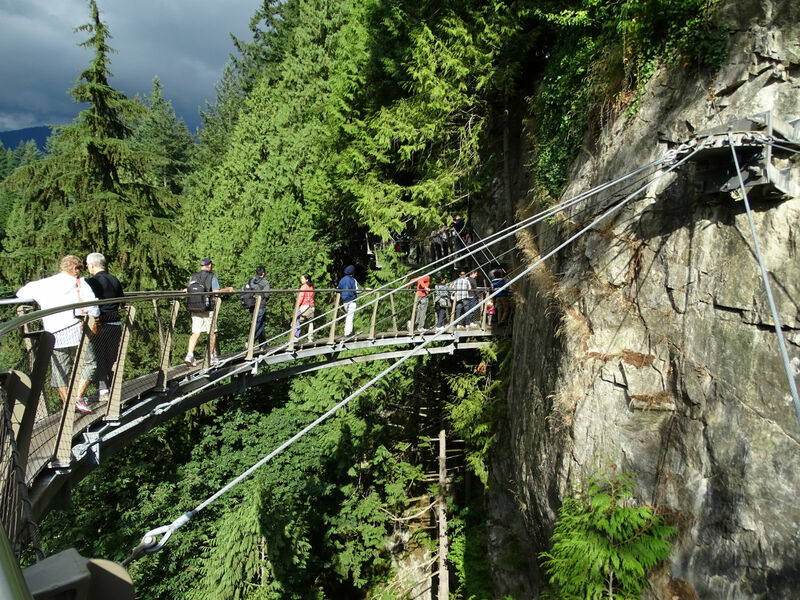 The Capilano Suspension Bridge Park is located, like Grouse Mountain, in North Vancouver. 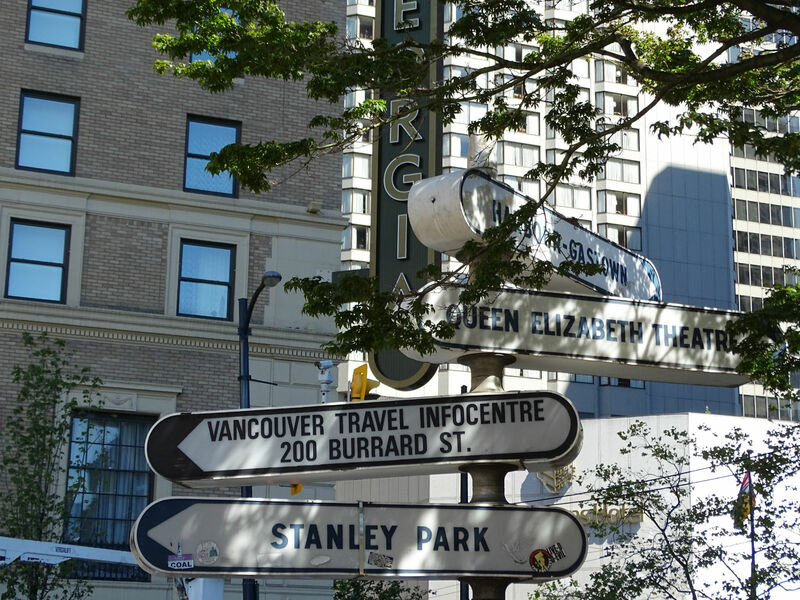 We use the free shuttle bus service and are pleased by the information on the city, which the bus driver provides, during the 20-minute drive. 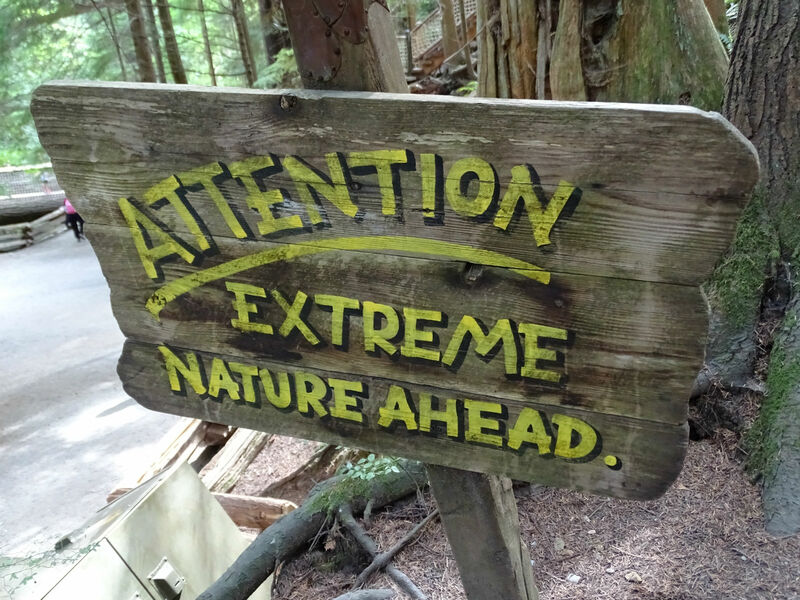 Admission costs $35. 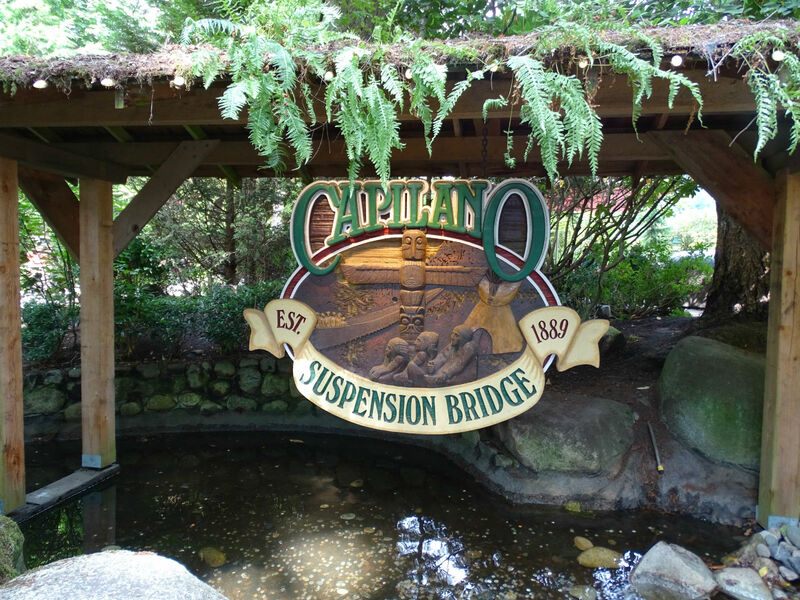 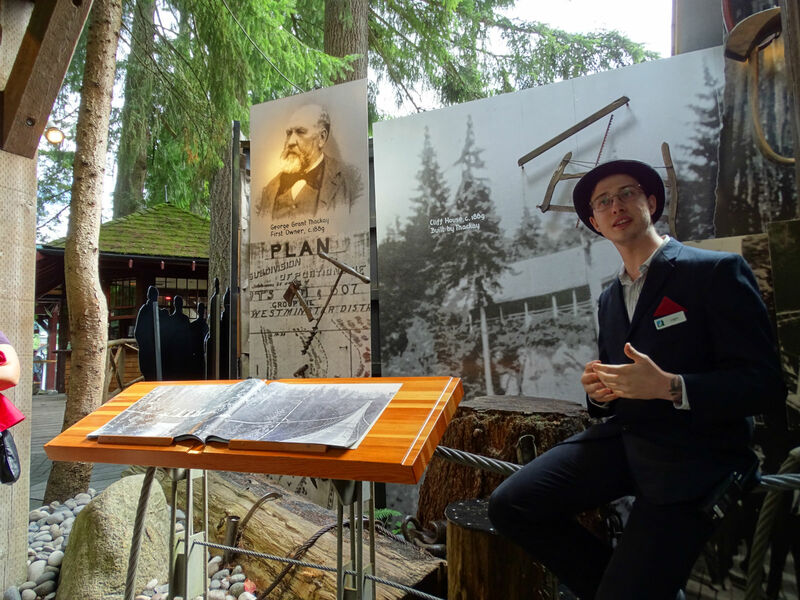 Once we arrive in the Park, the History Tour is just starting, in which we learn about the rise of the bridge and the development of Capilano Suspension Bridge Park. 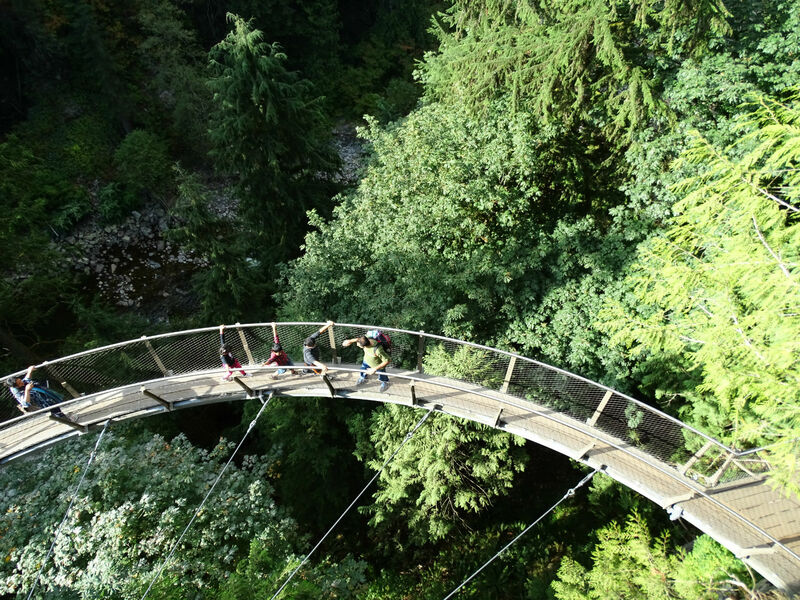 Then we go across the powerful swaying suspension bridge into the rainforest, where already, the next guide is waiting. 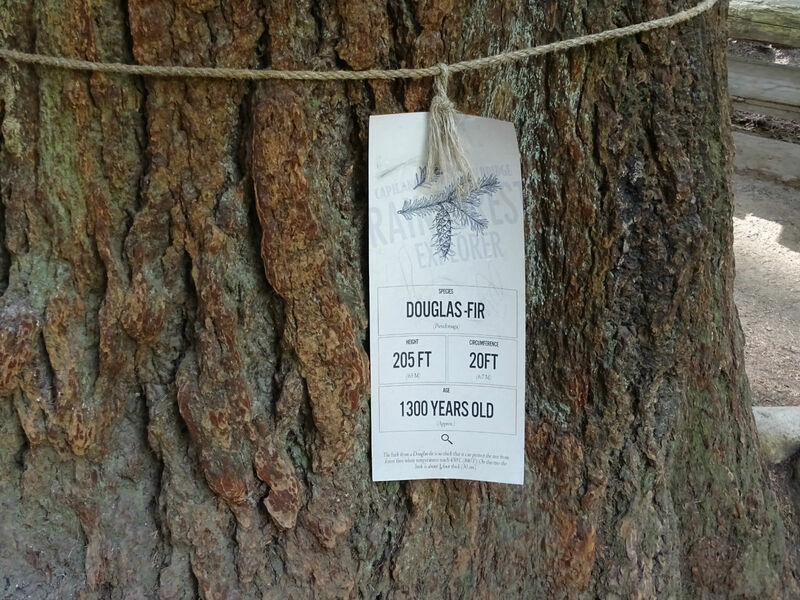 On the Nature Tour we get information on spruce and maple trees. 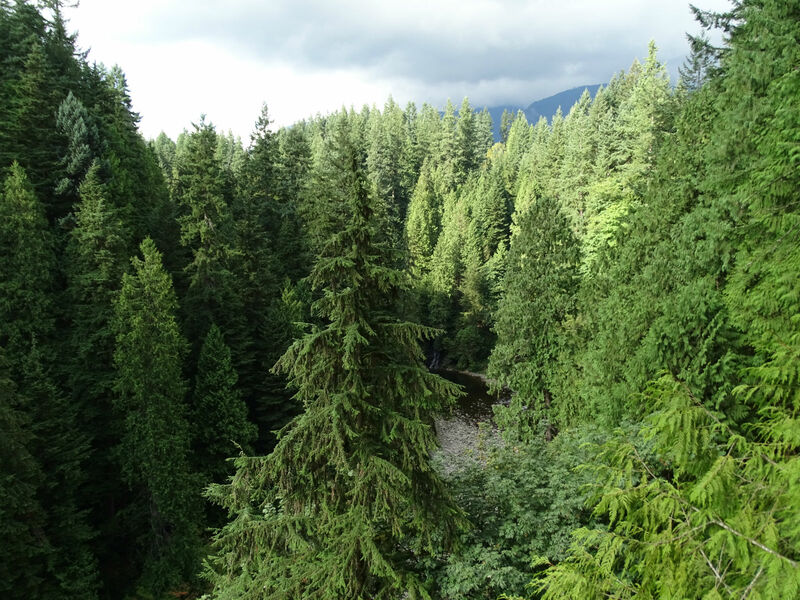 We could even try spruce needles. 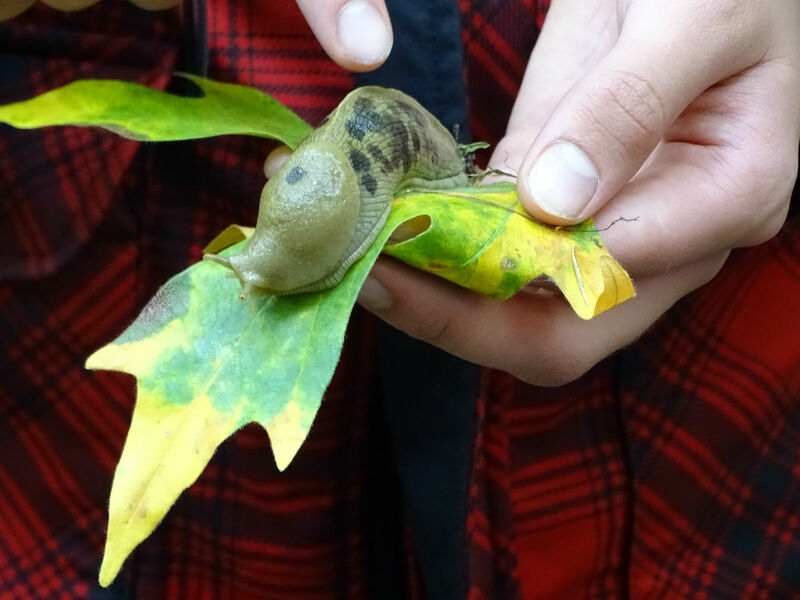 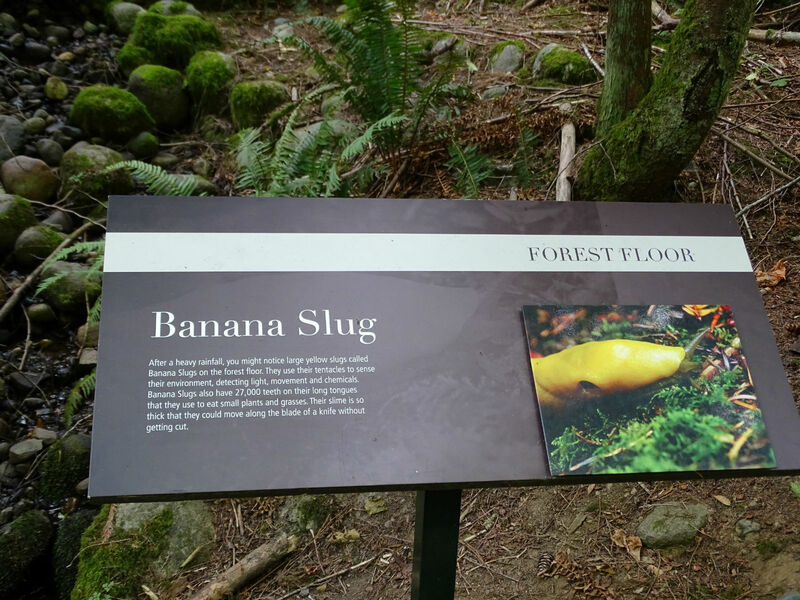 😉 Other than that, we also get to know the banana slug. 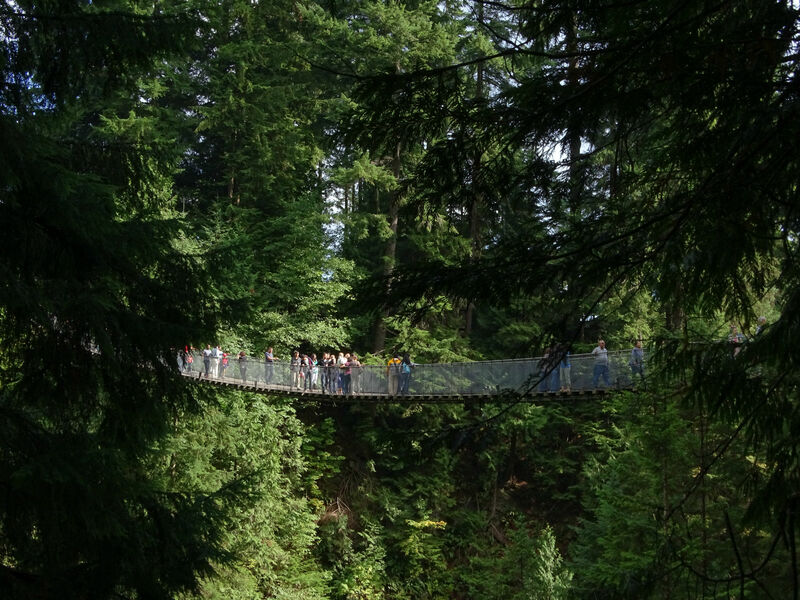 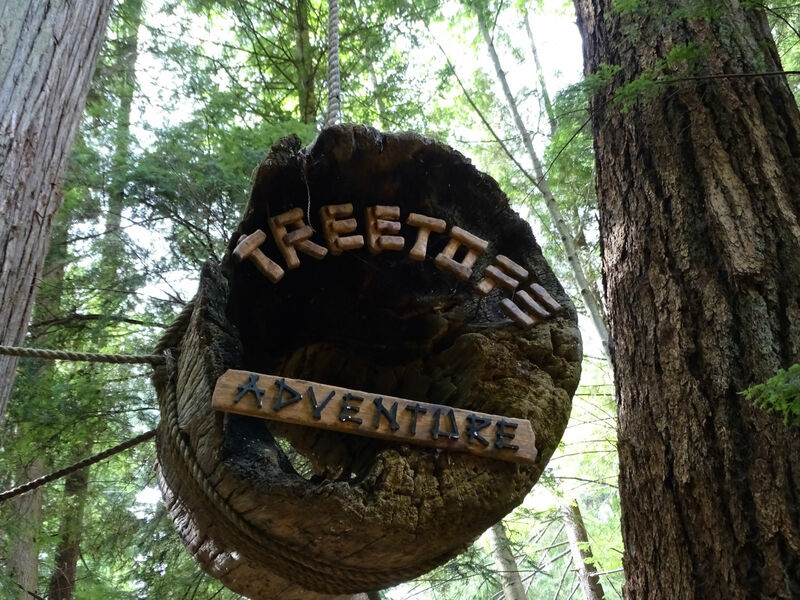 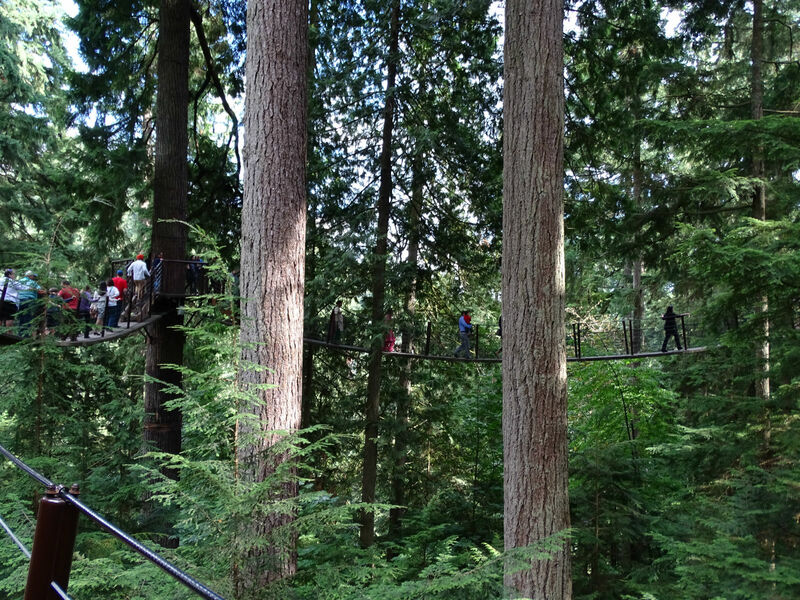 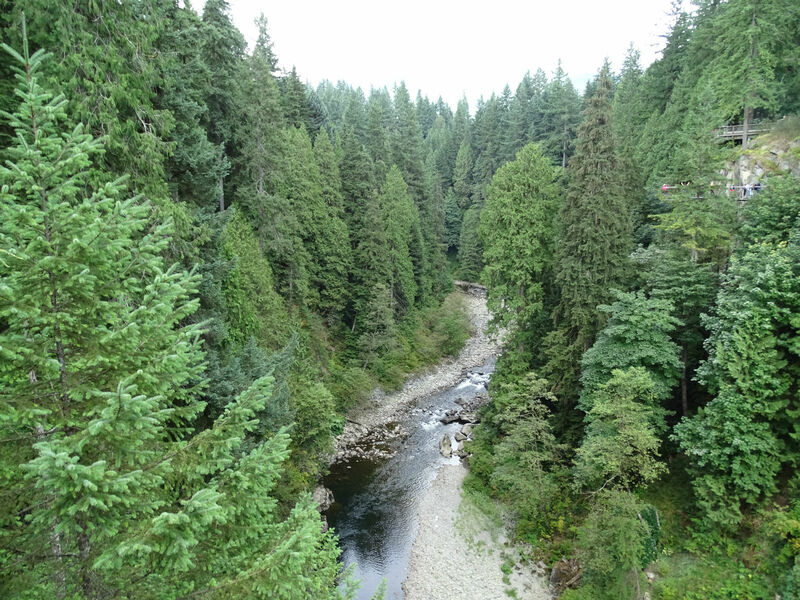 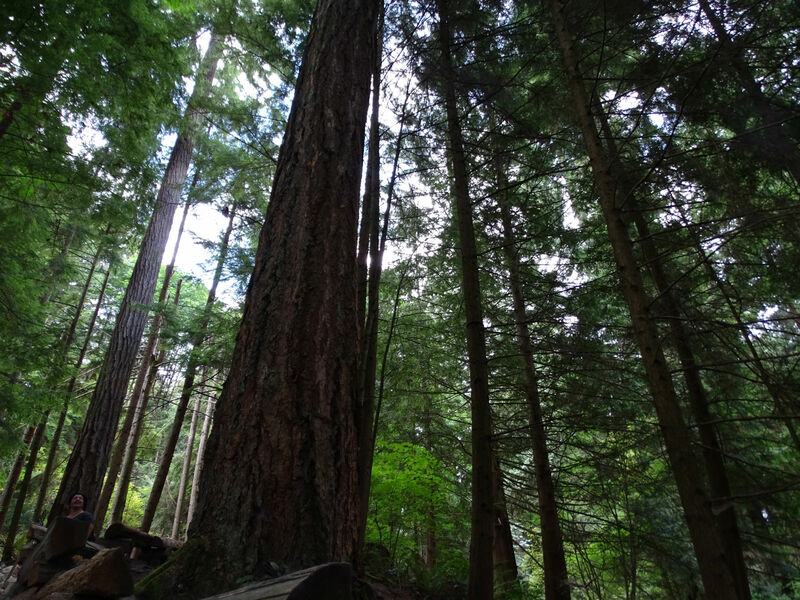 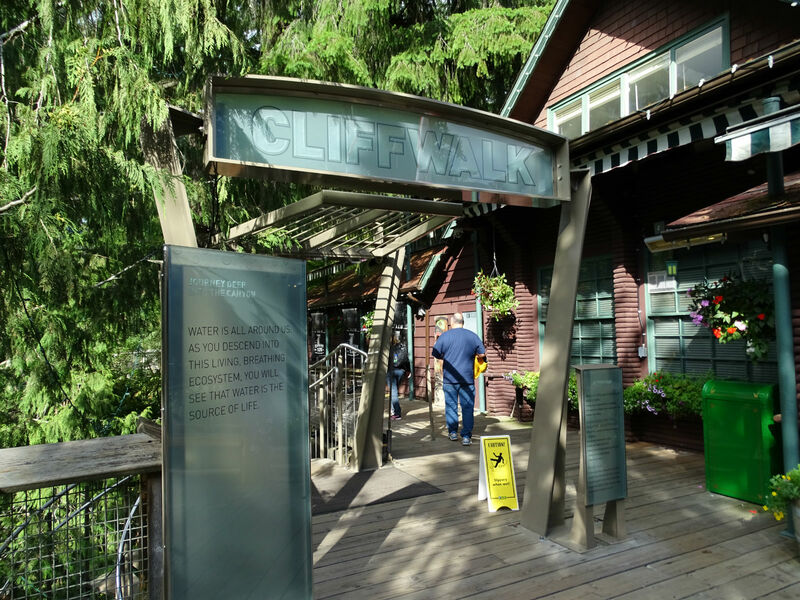 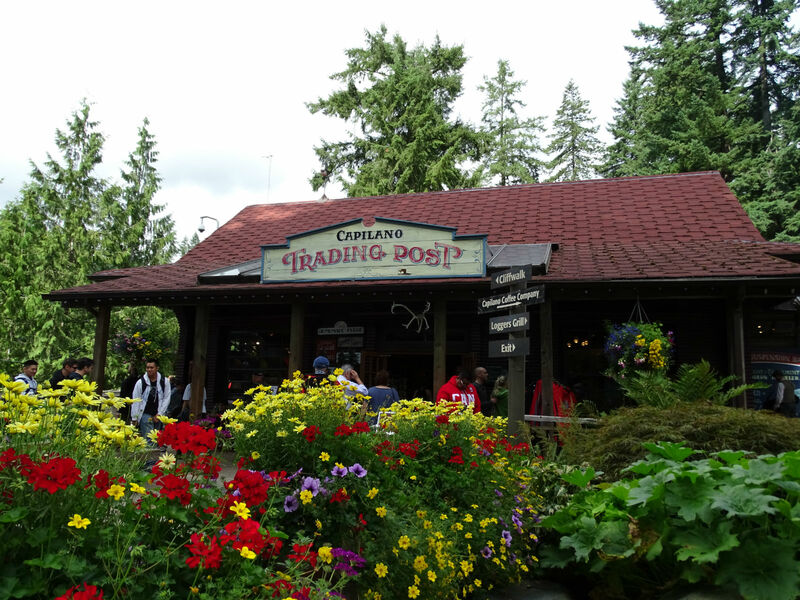 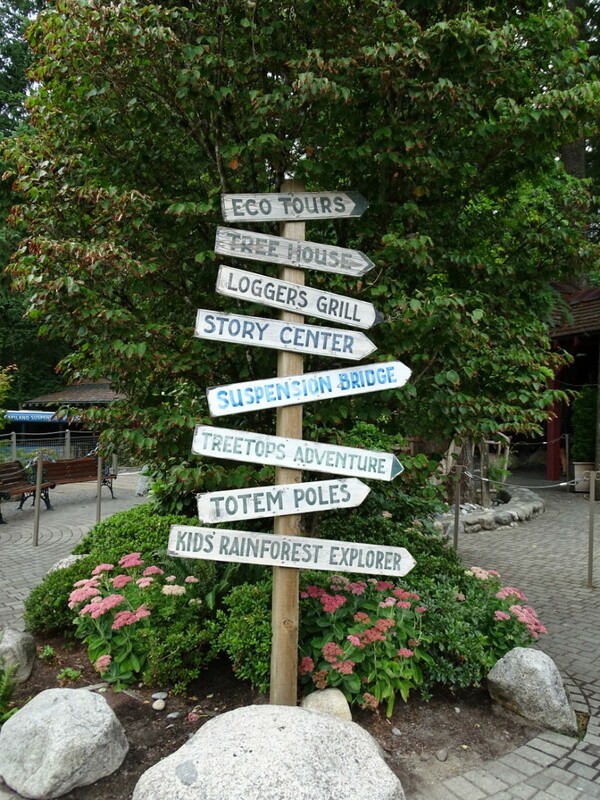 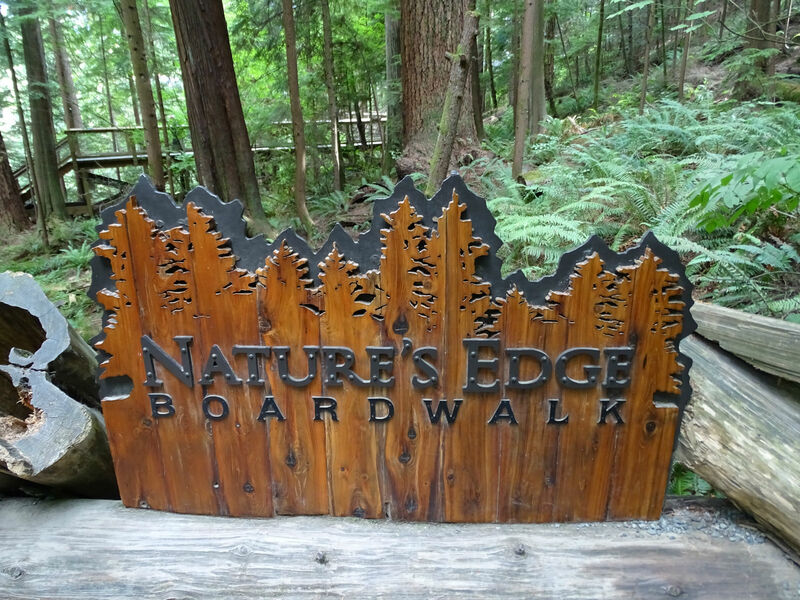 In the park, there are still several walking and adventure trails: the Treetops Adventure; a kind of tree top trail of hanging bridges, the walking trail Natures Edge overlooking the Capilano Suspension Bridge and river and the Cliff Walk, a floating walkway. 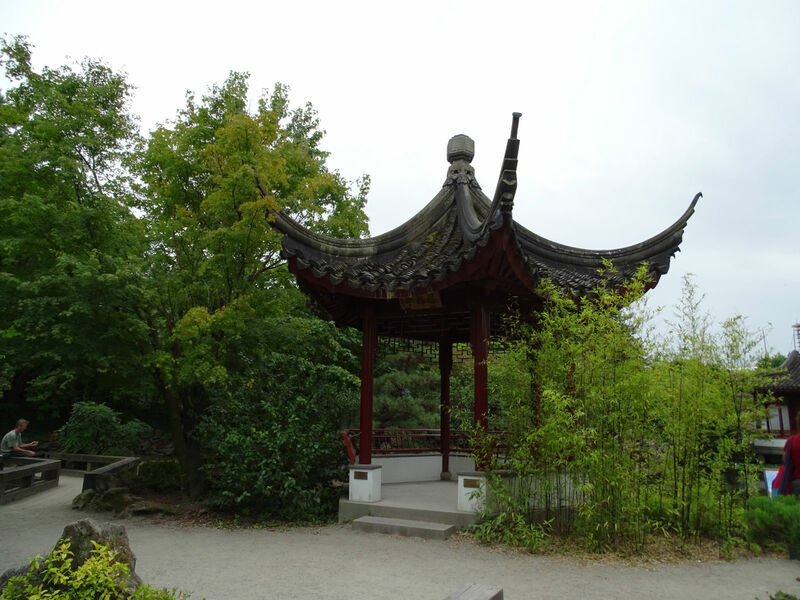 We spent a good 3 hours with our two guided tours in the park and it was a really interesting excursion. 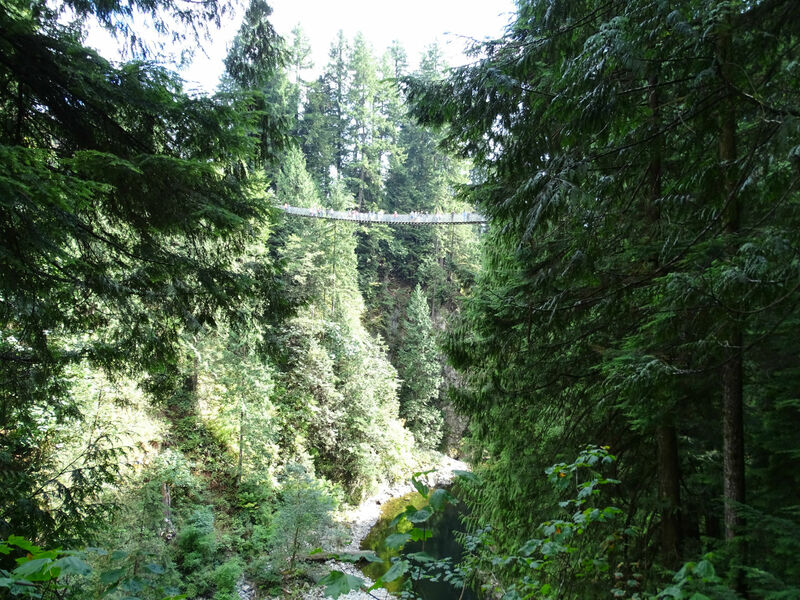 Also, due to that the Suspension Bridges aren’t handled as hanging bridges timbered for tourists, but the bridge actually has a story. 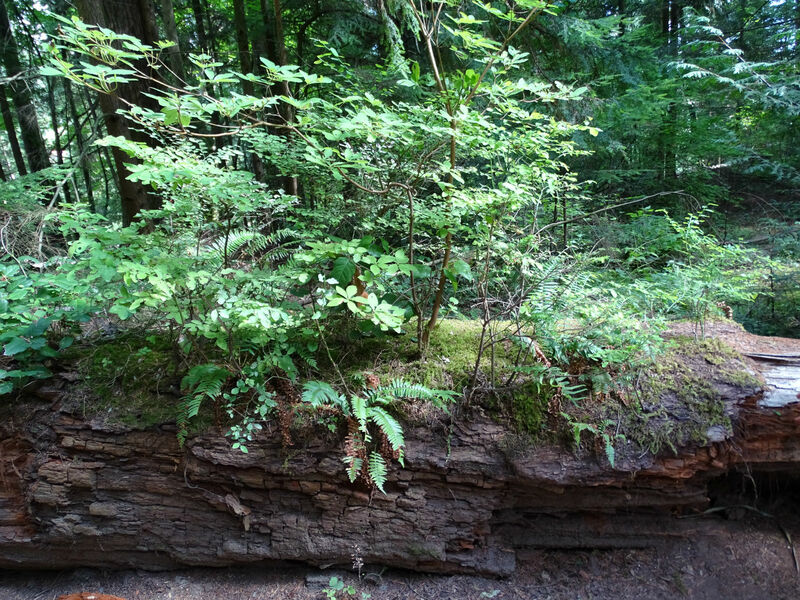 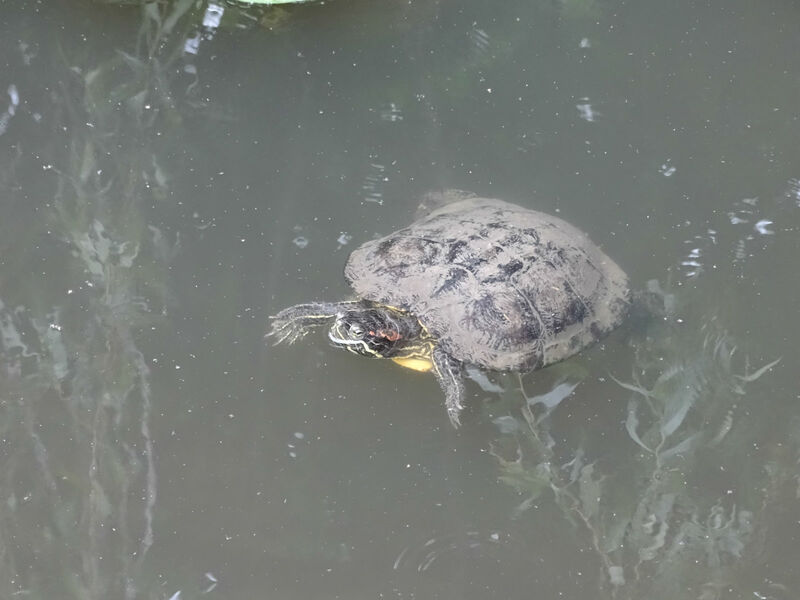 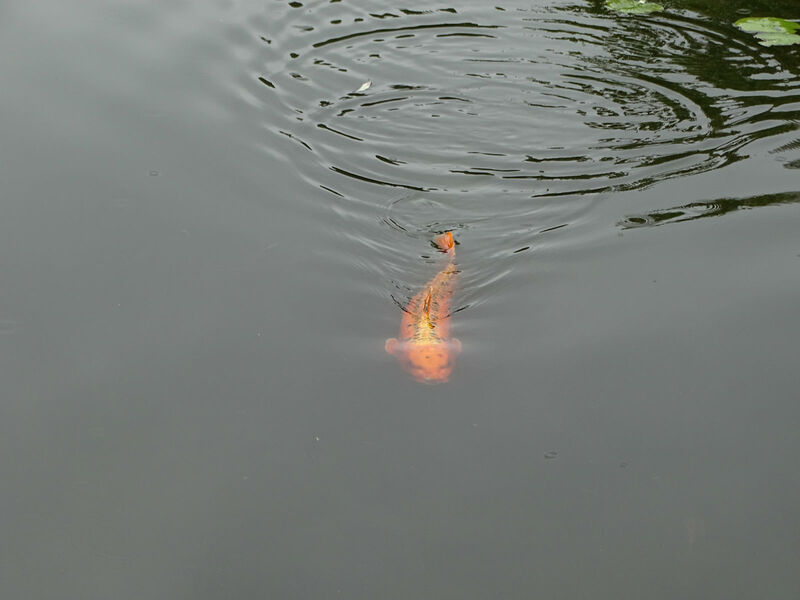 It really is well done integrating its various walks through the nature. 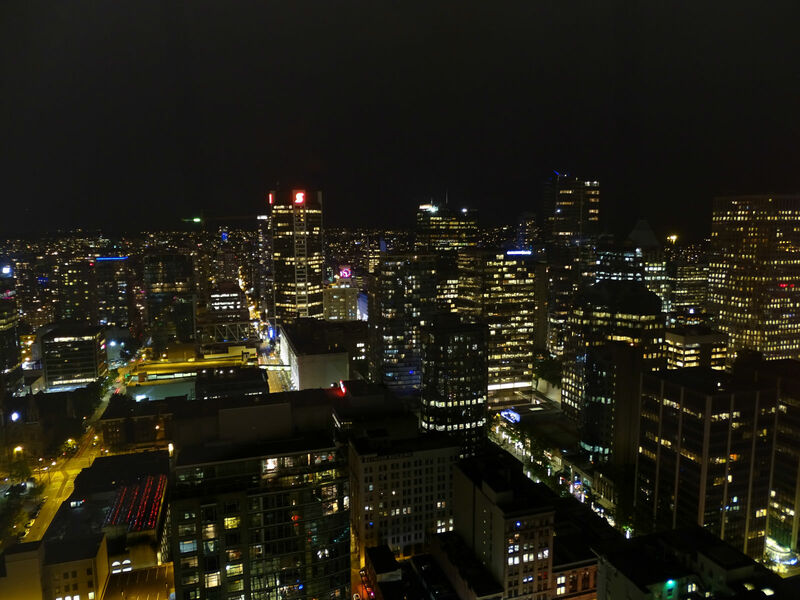 Conclusion: Vancouver is somewhat overrated. 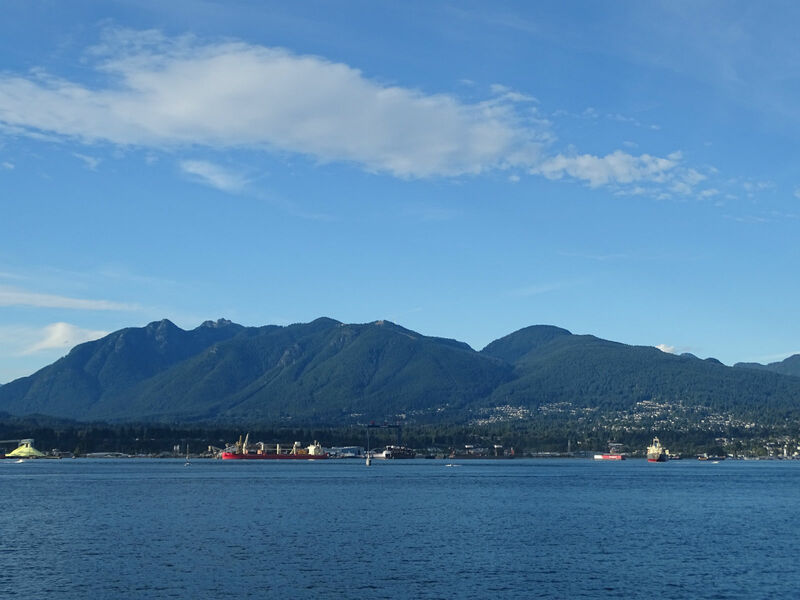 To me it is also not clear how Vancouver belongs to one of the most livable cities in the world. 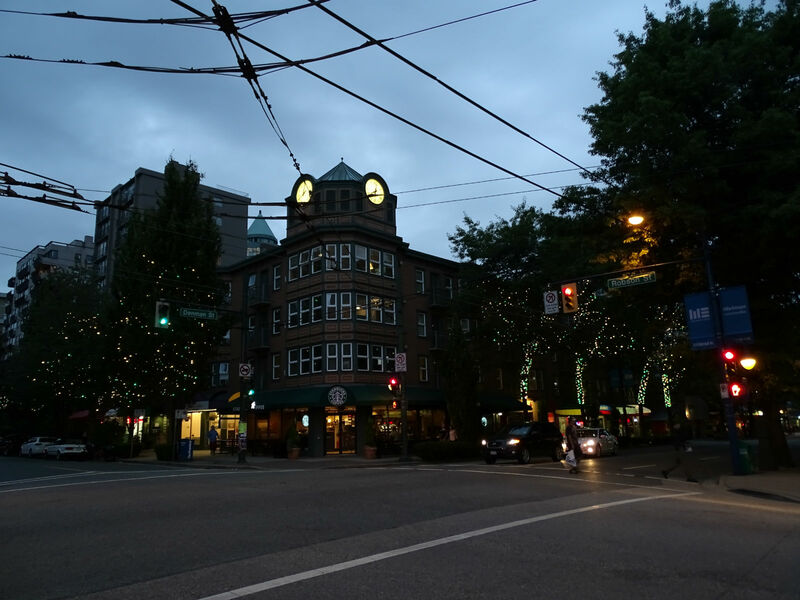 It is sometimes not nice, dirty and full of peculiar characters, from who indeed there is no danger, but who prevent me from feeling comfortable here. 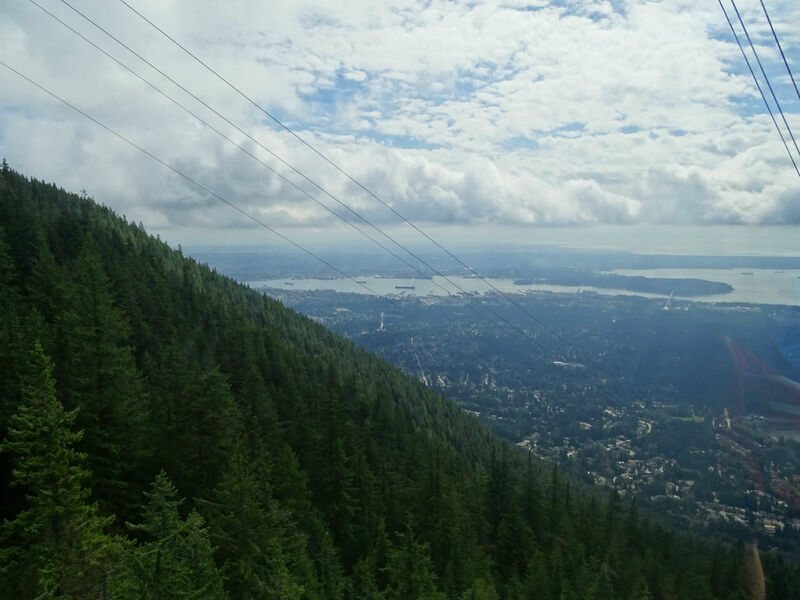 The highlights were the bike ride in Stanley Park, Granville Iceland Public Market, Grouse Mountain and the Capilano Suspension Bridge.